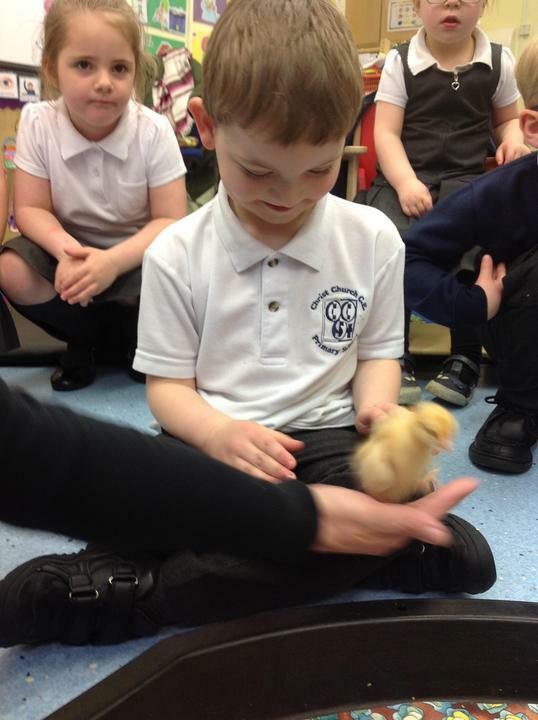 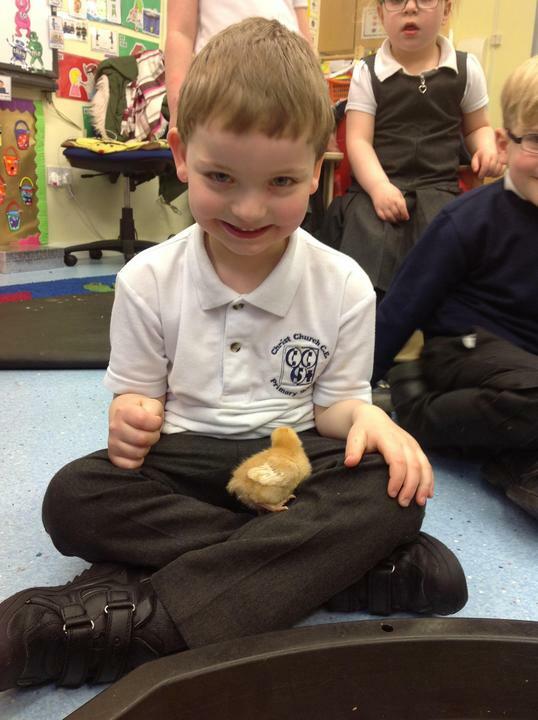 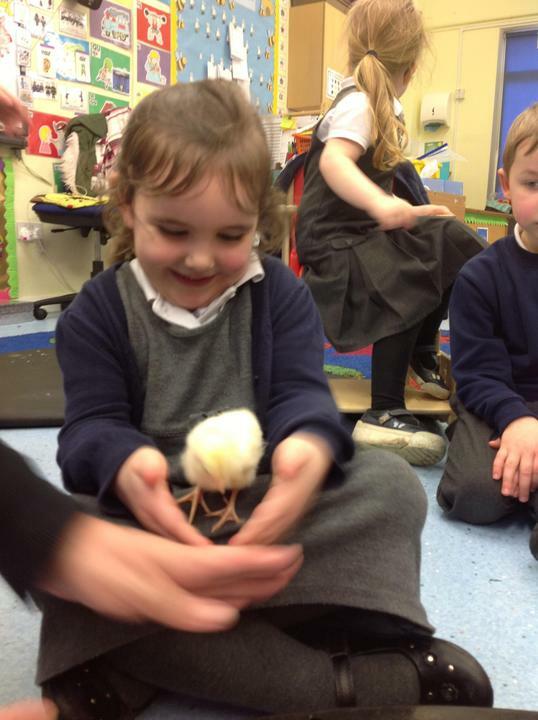 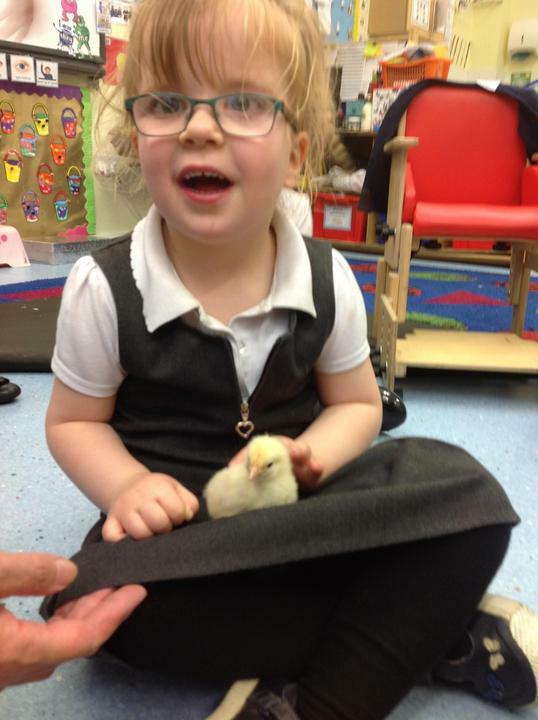 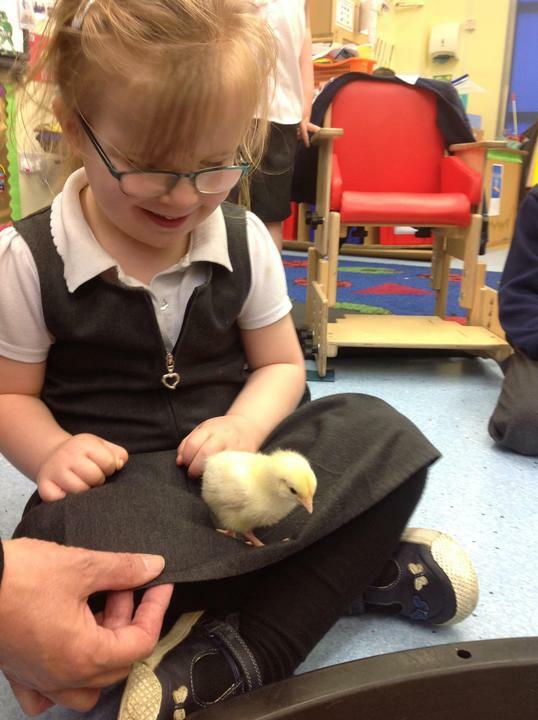 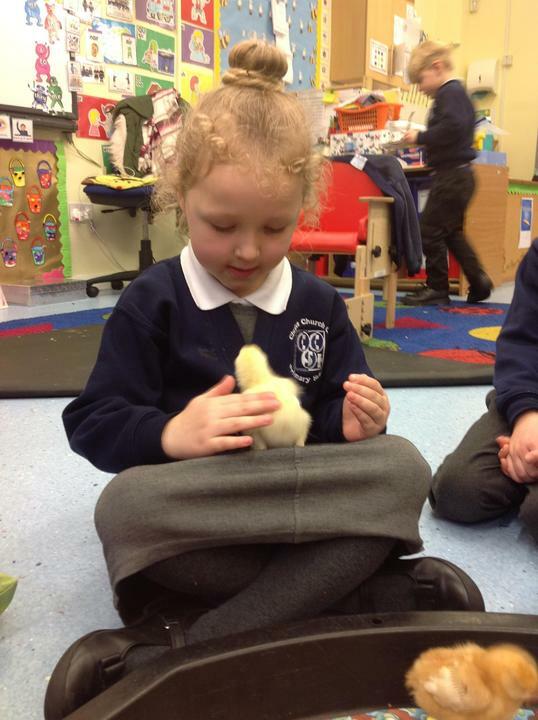 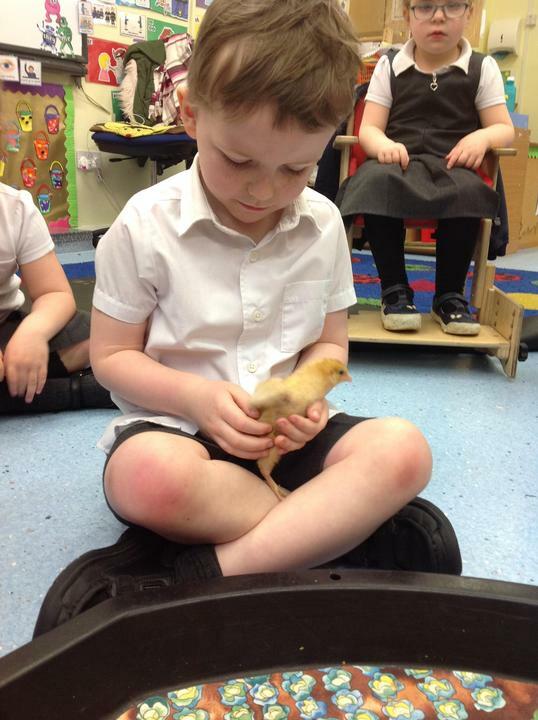 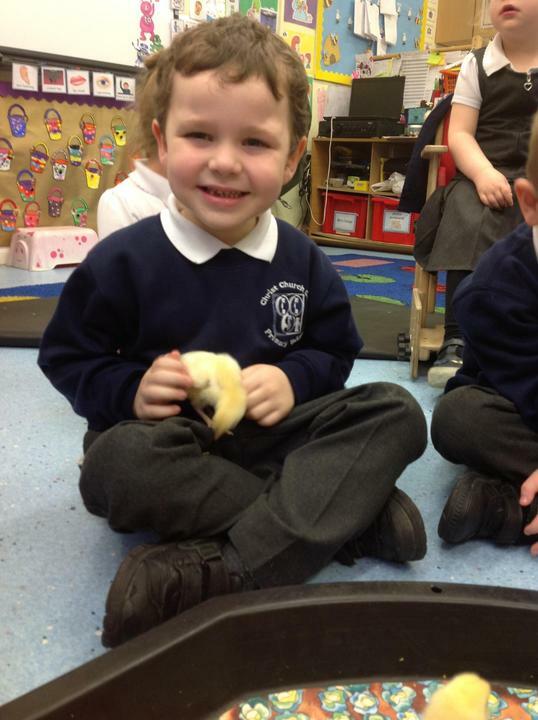 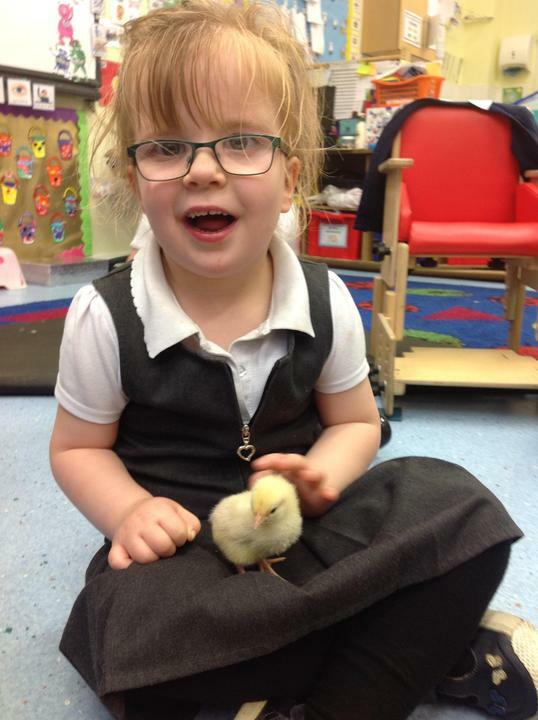 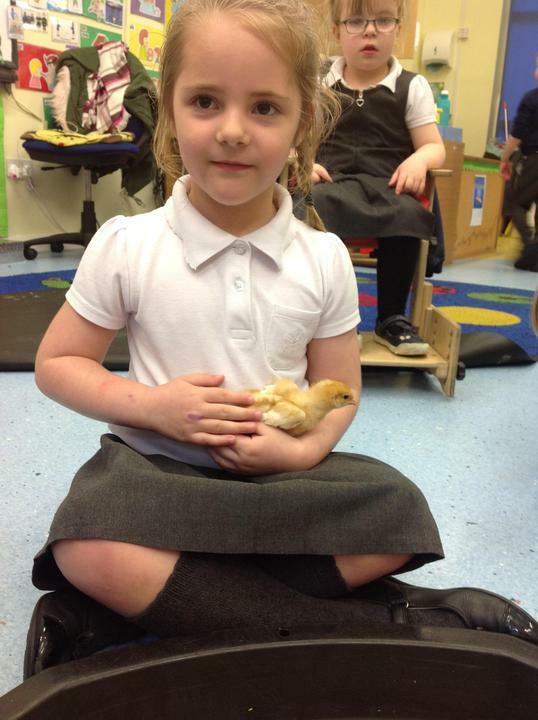 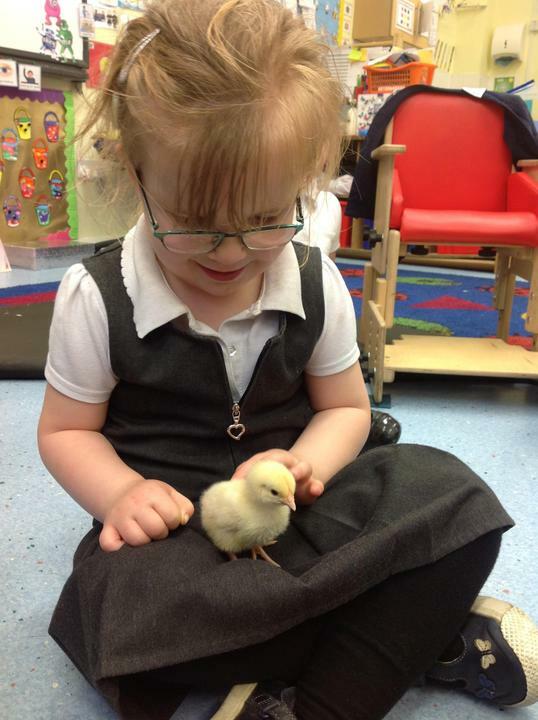 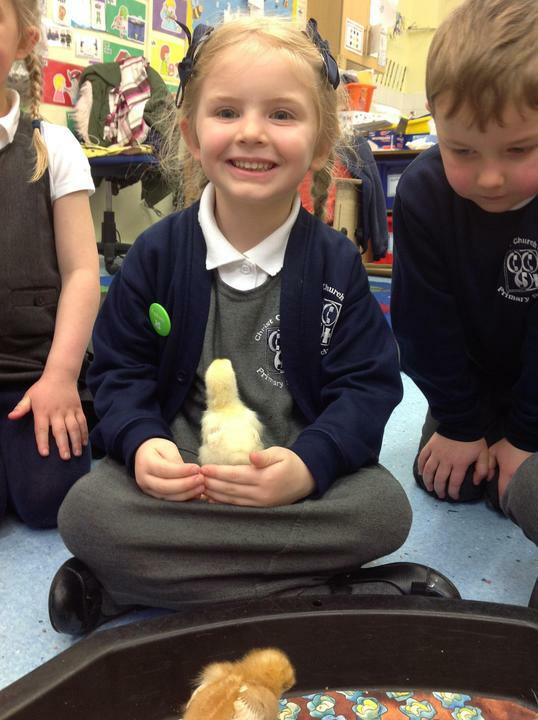 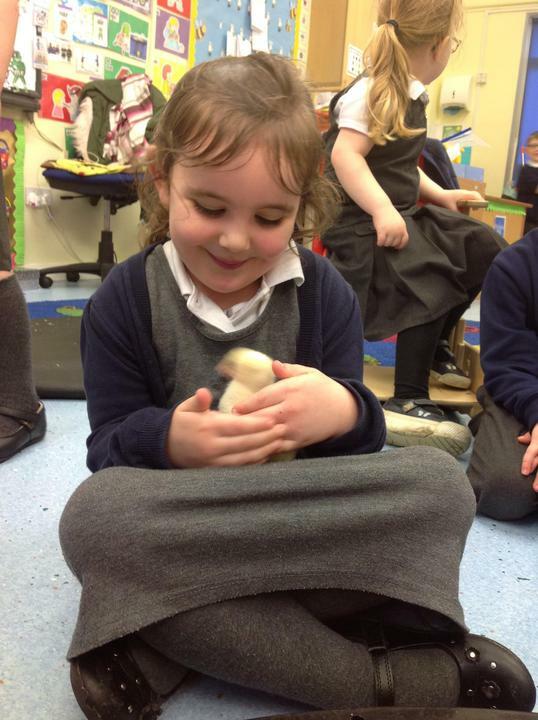 Reception Class were very excited today as they got to hold the chicks. 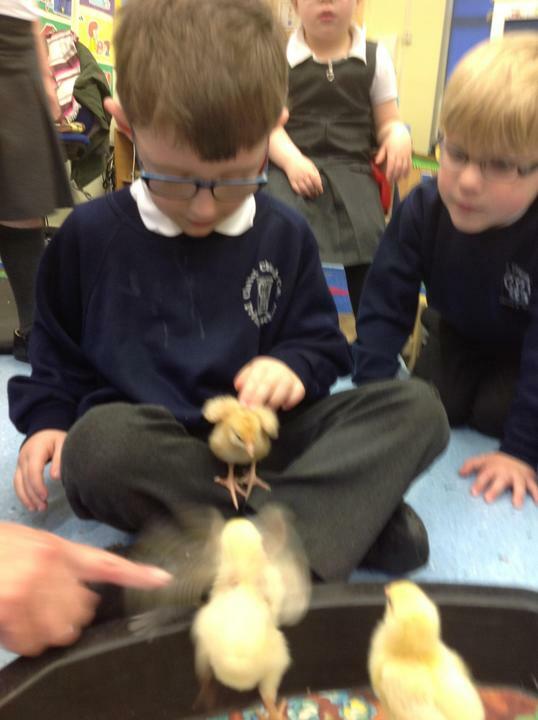 Here are some photographs of them holding the chicks. 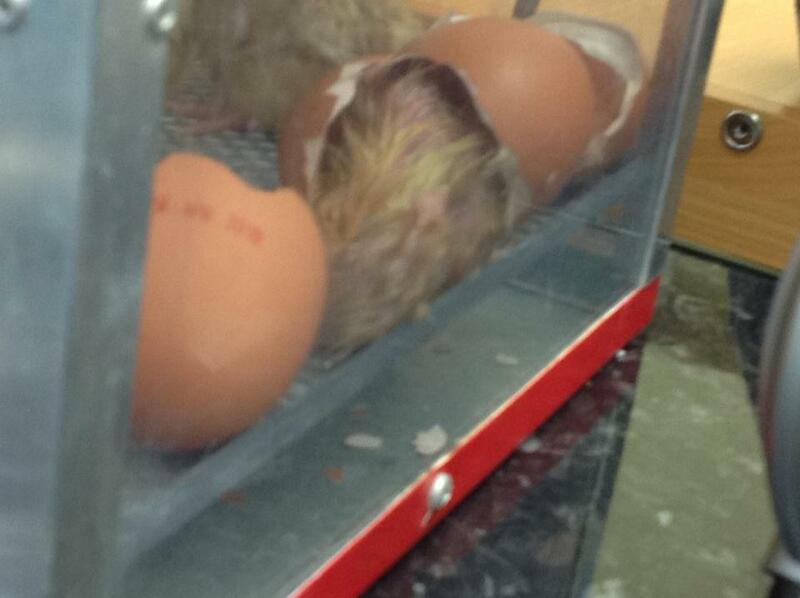 On Thursday, four more chicks hatched. 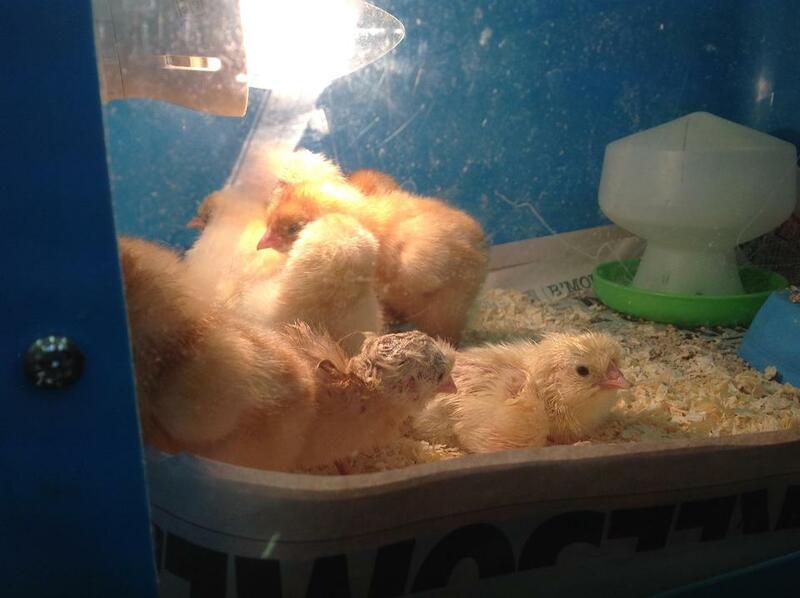 We now have 9 chicks altogether. 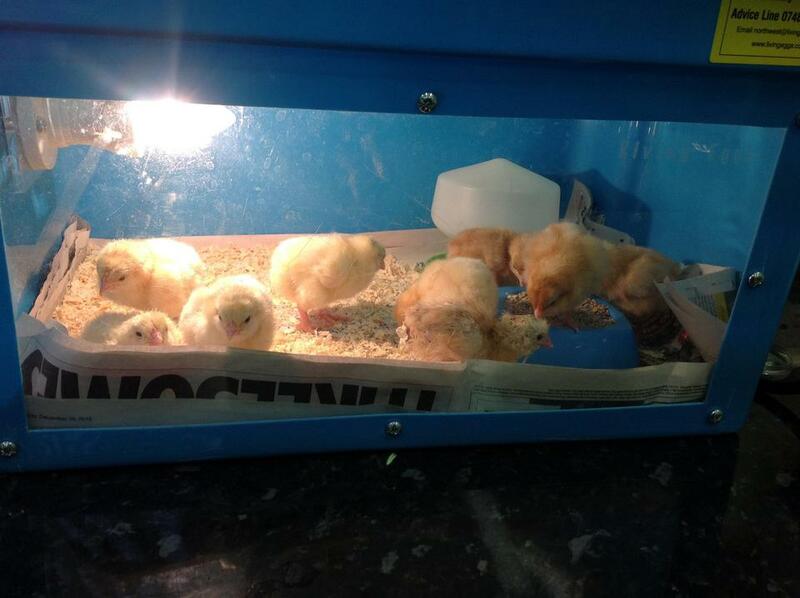 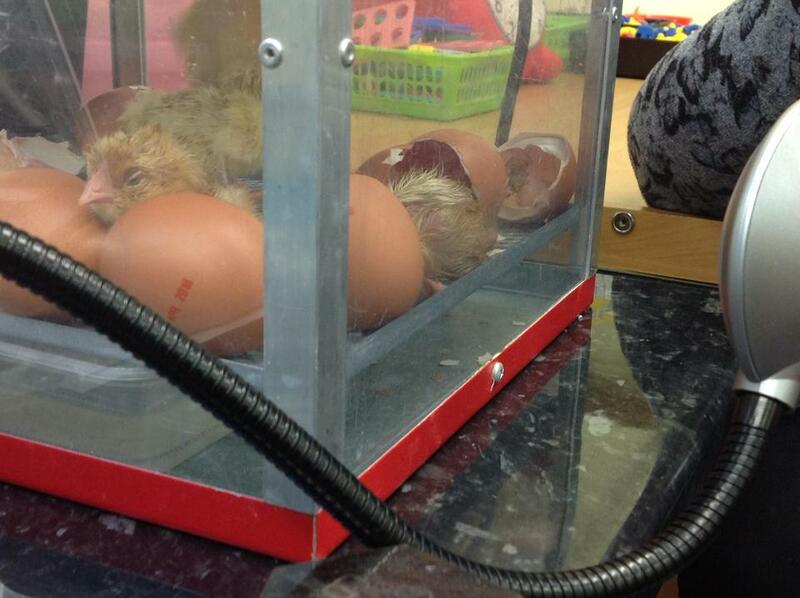 The chicks have now grown stronger and so have been moved from the incubator into the brooder box. 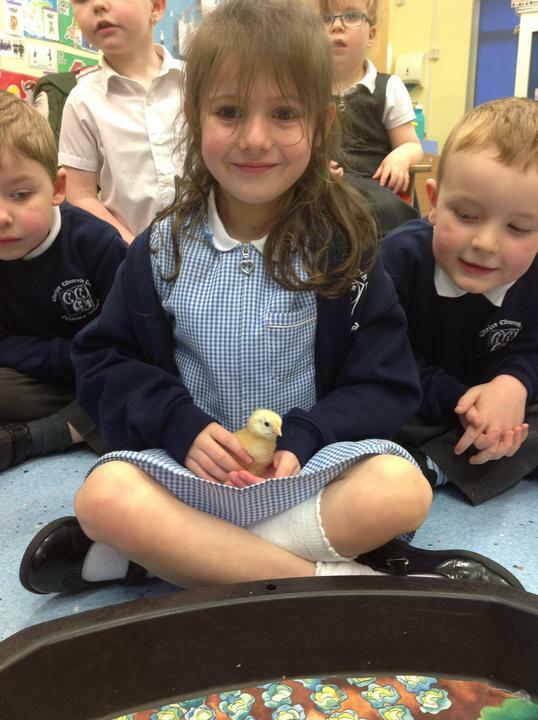 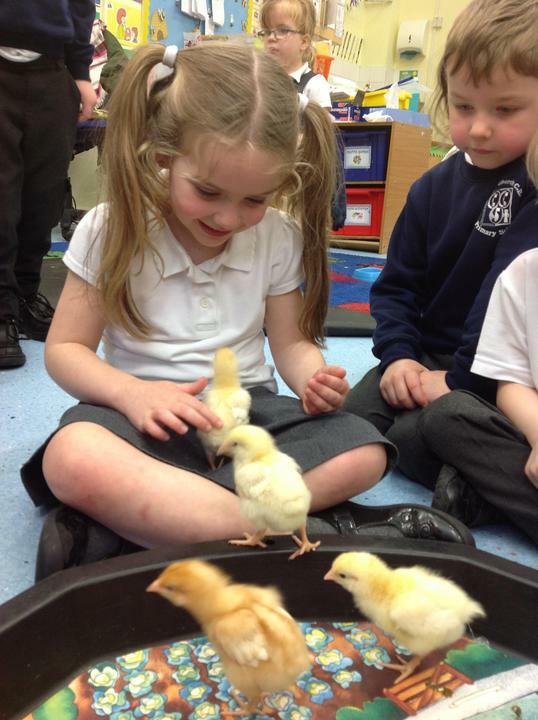 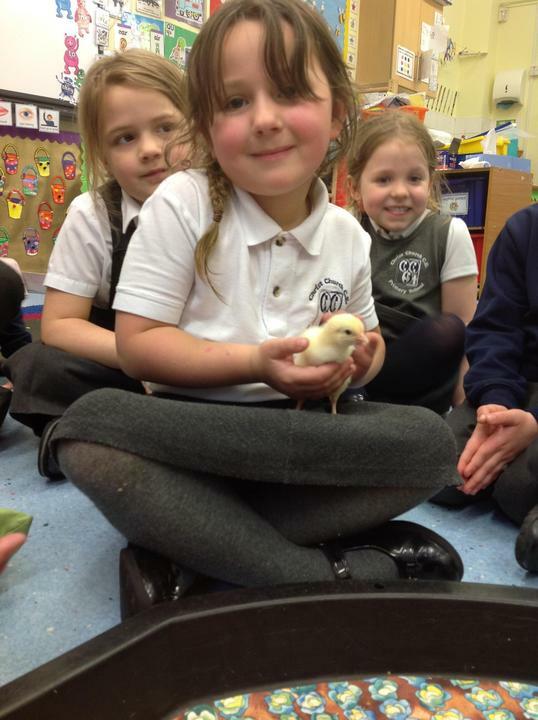 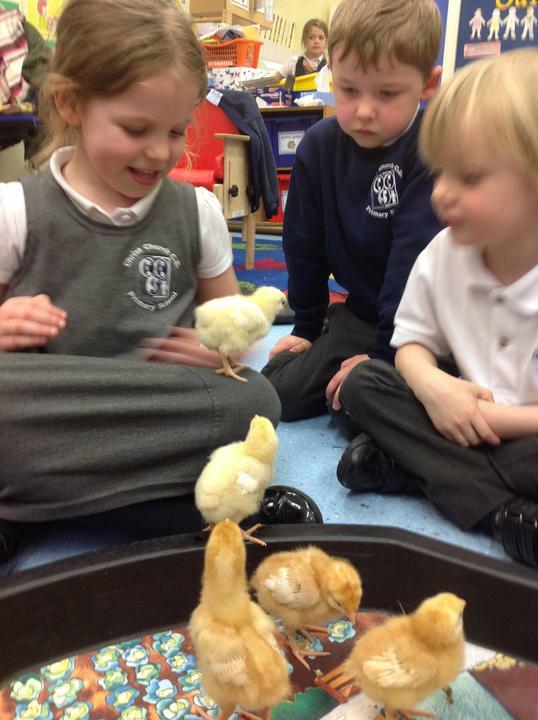 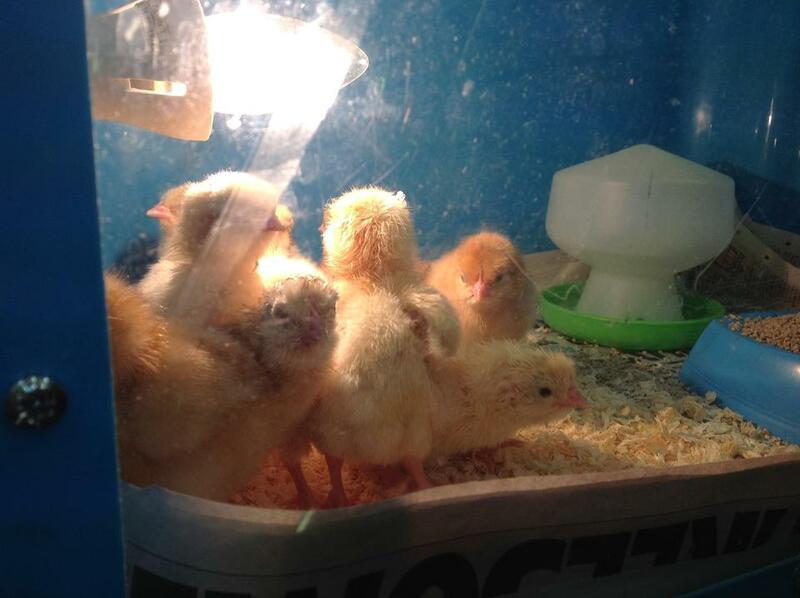 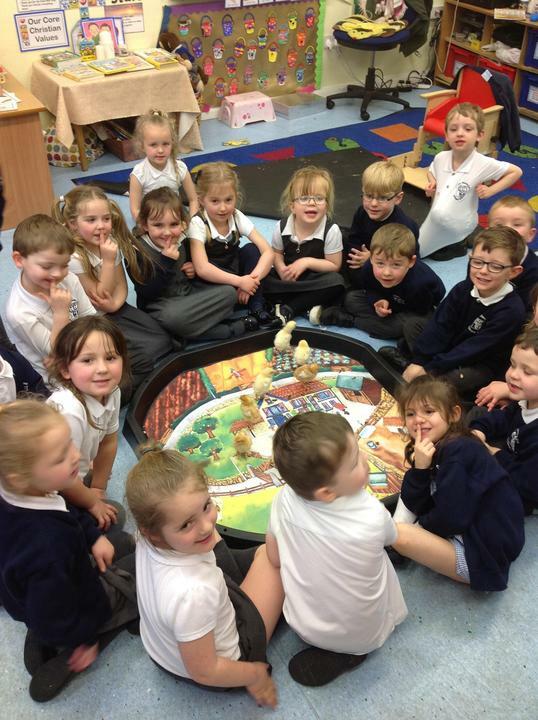 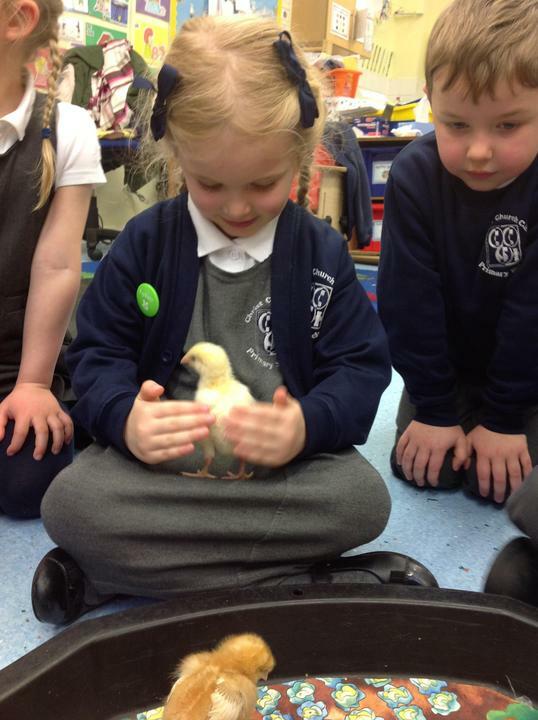 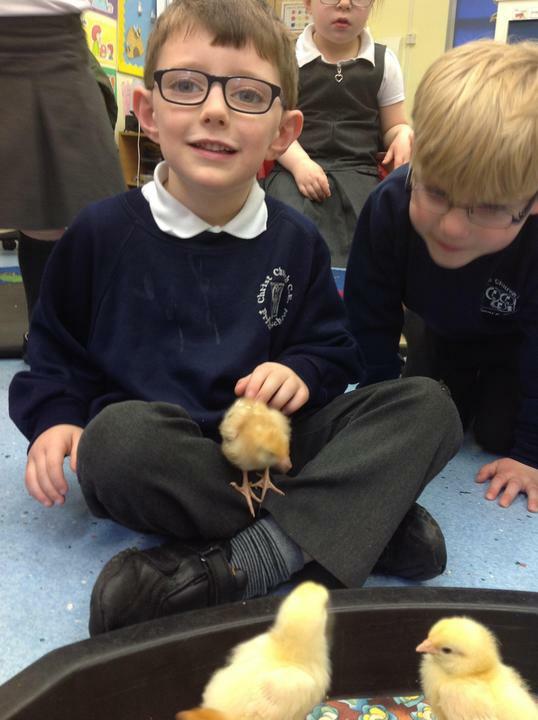 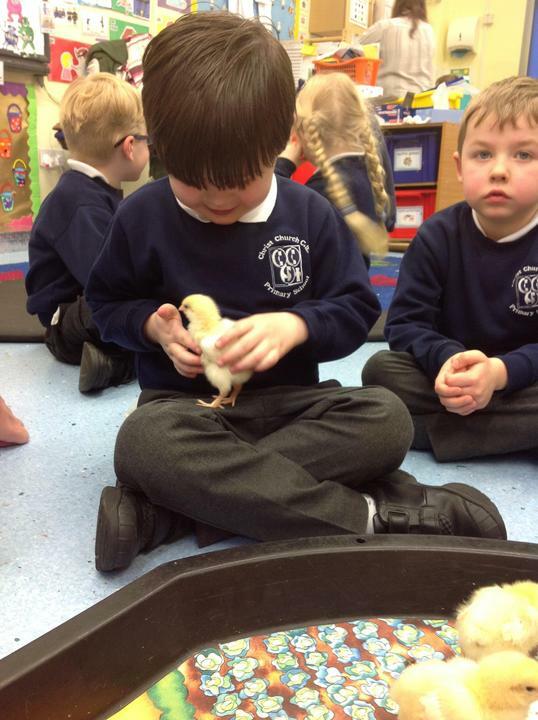 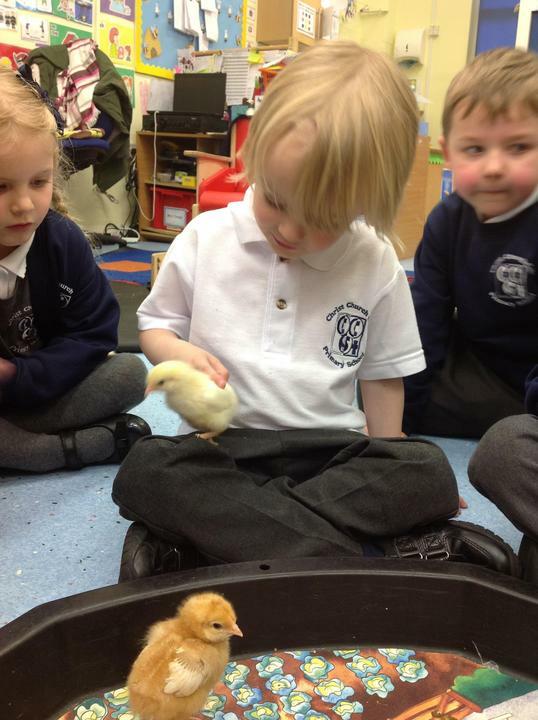 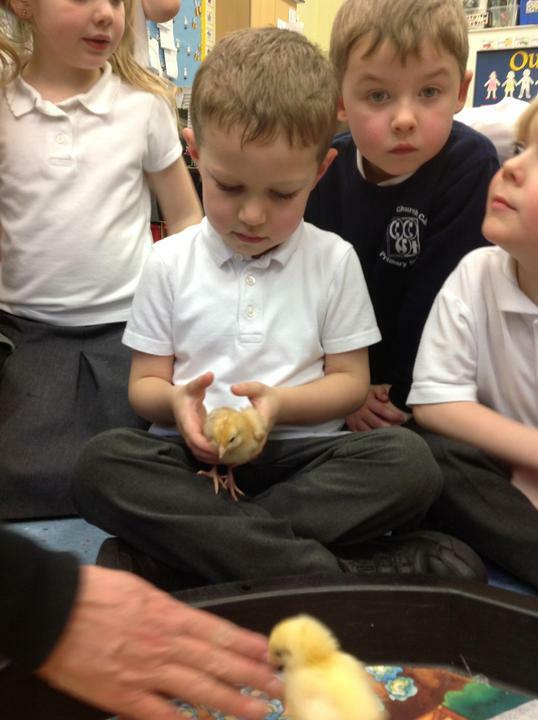 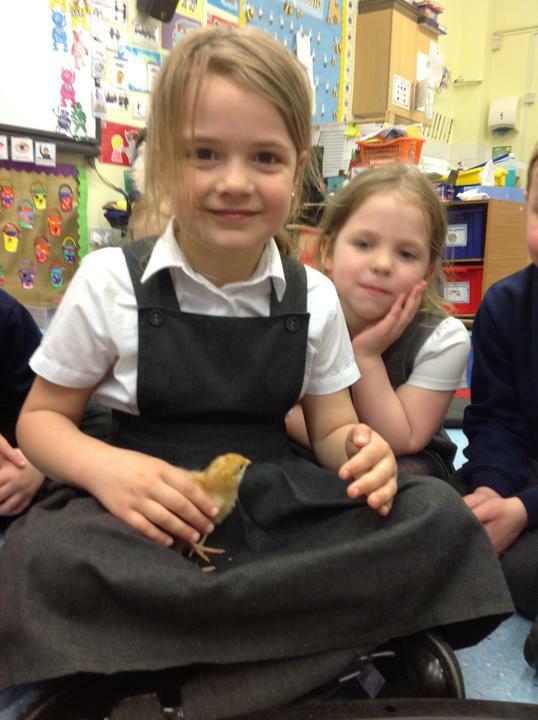 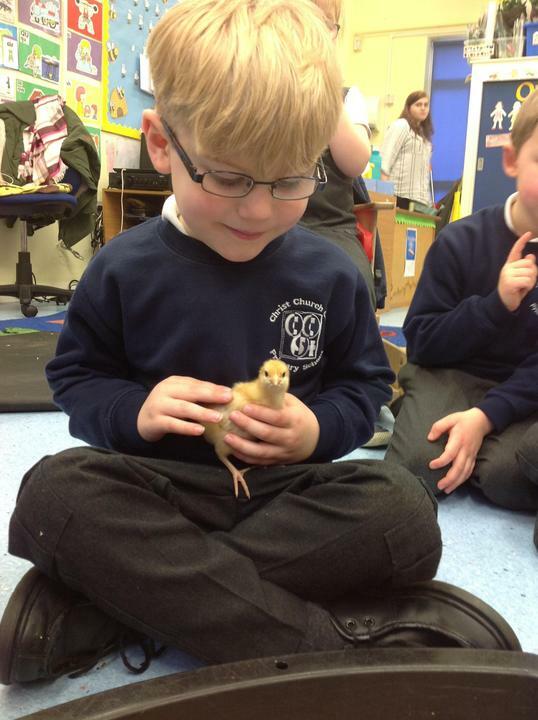 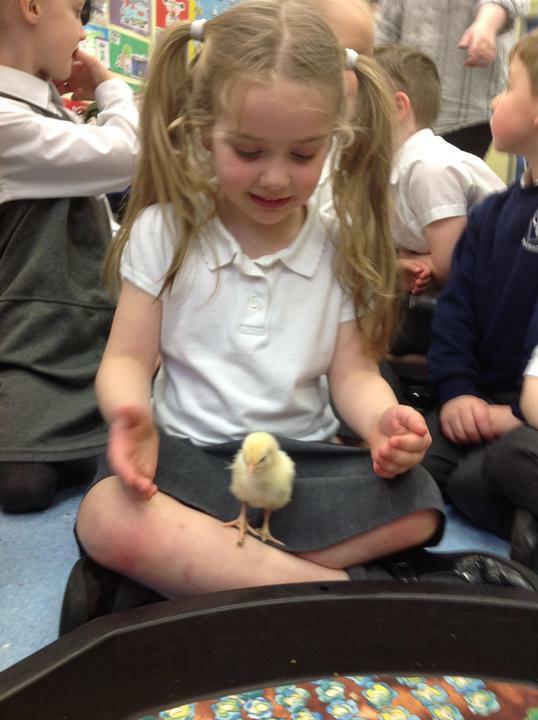 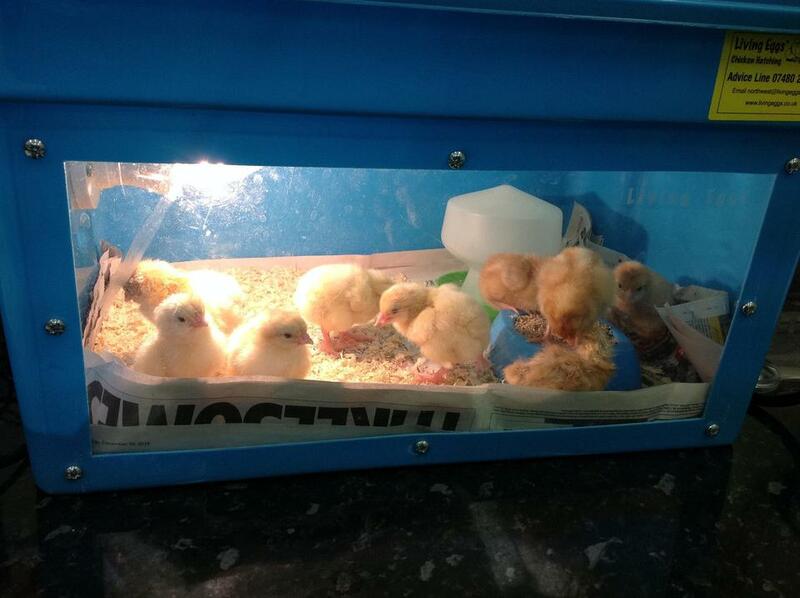 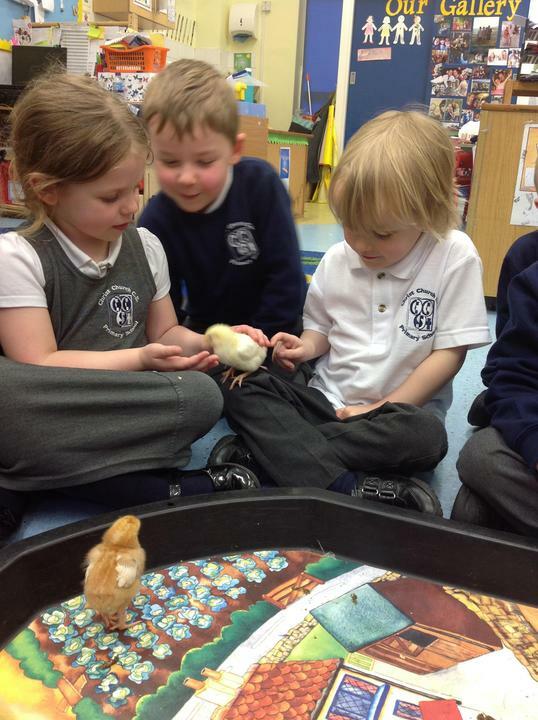 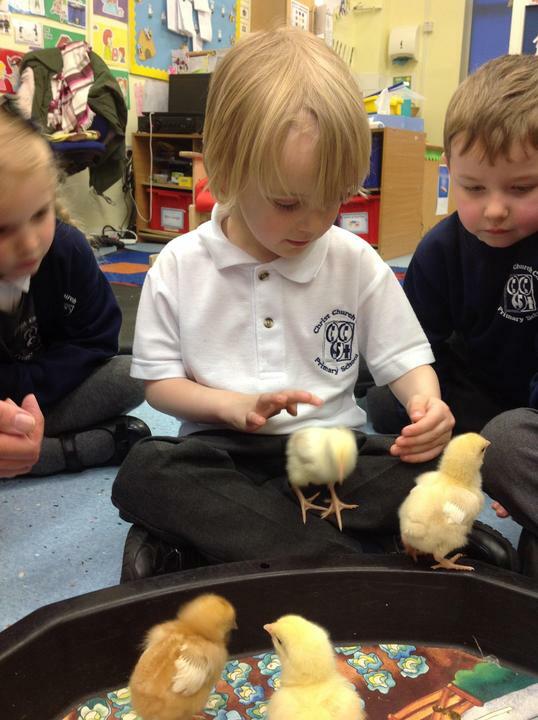 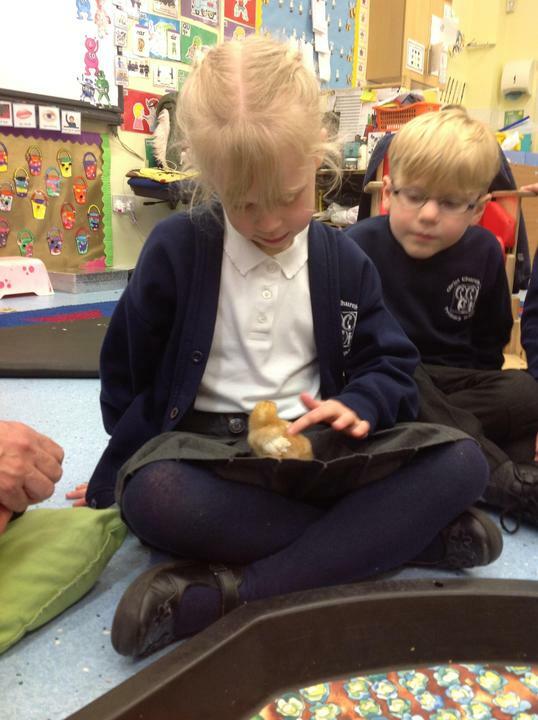 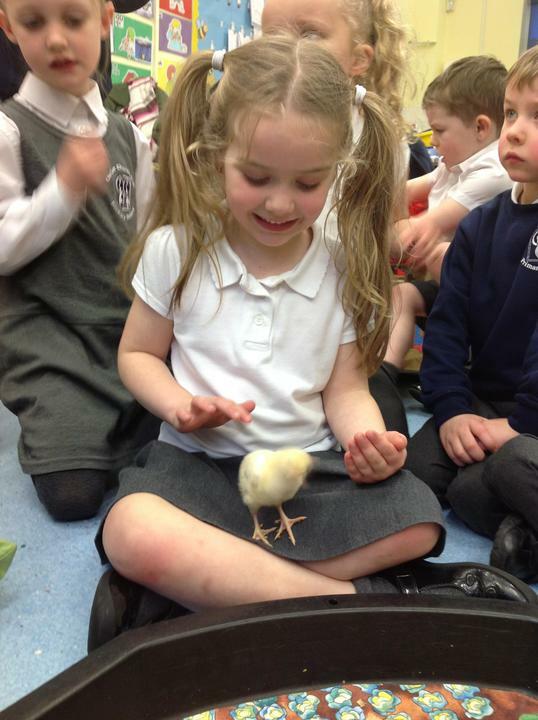 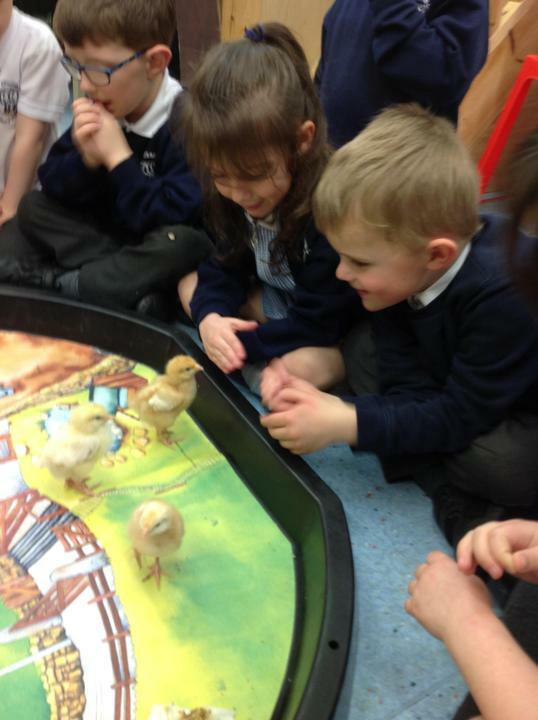 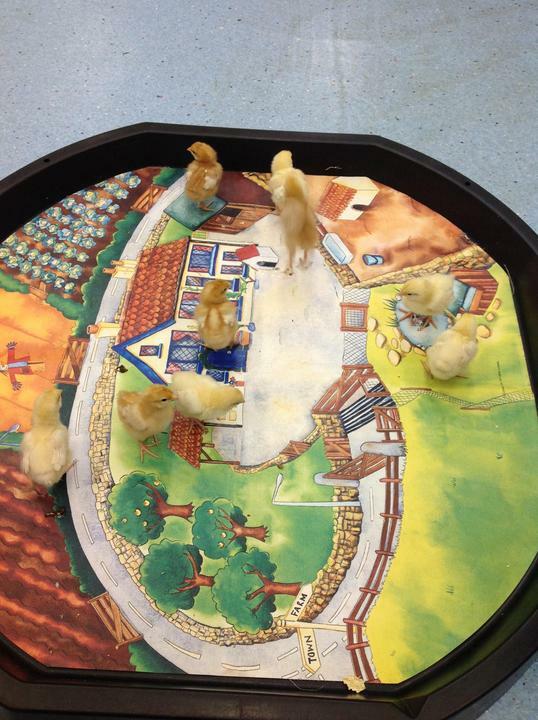 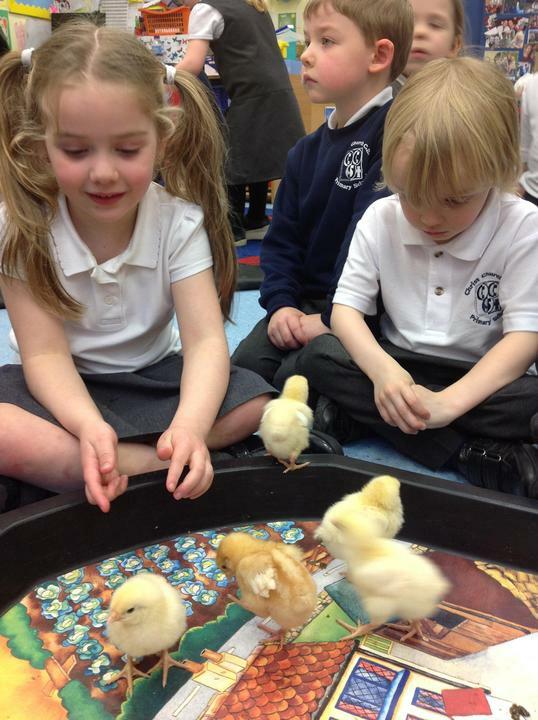 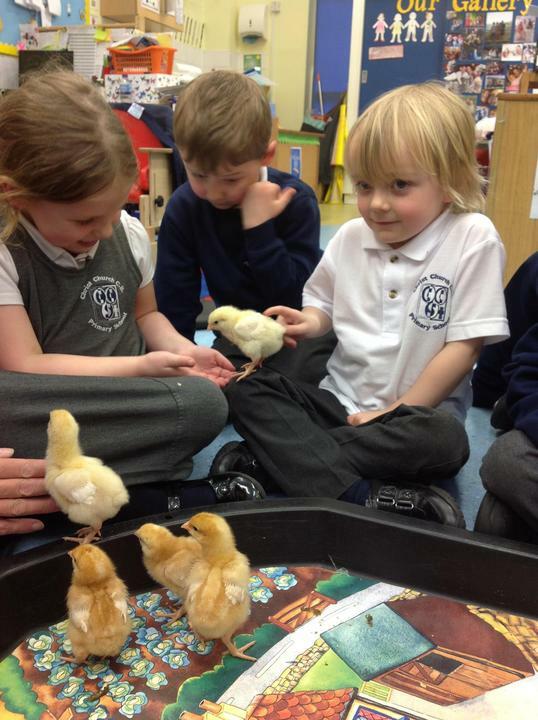 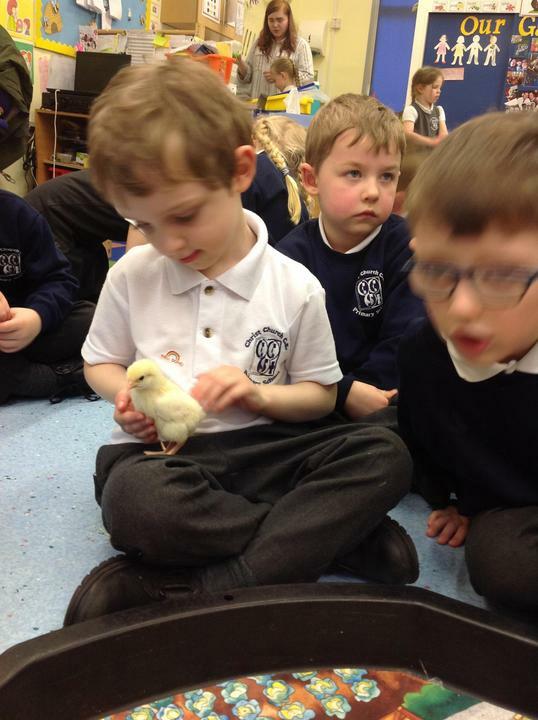 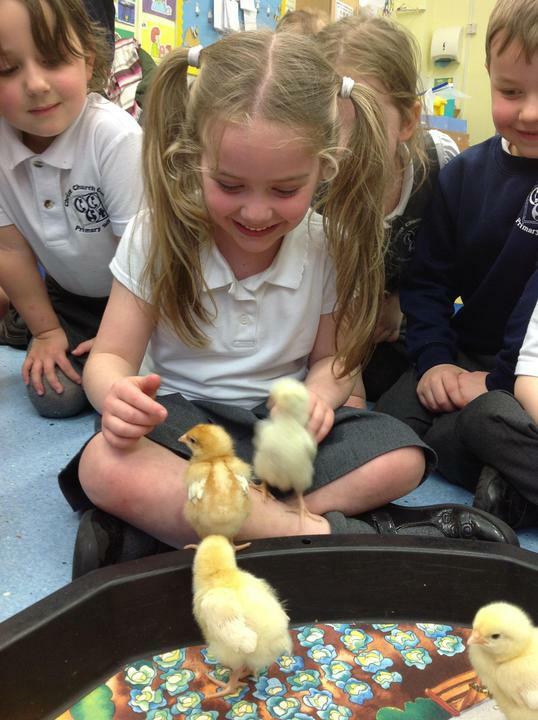 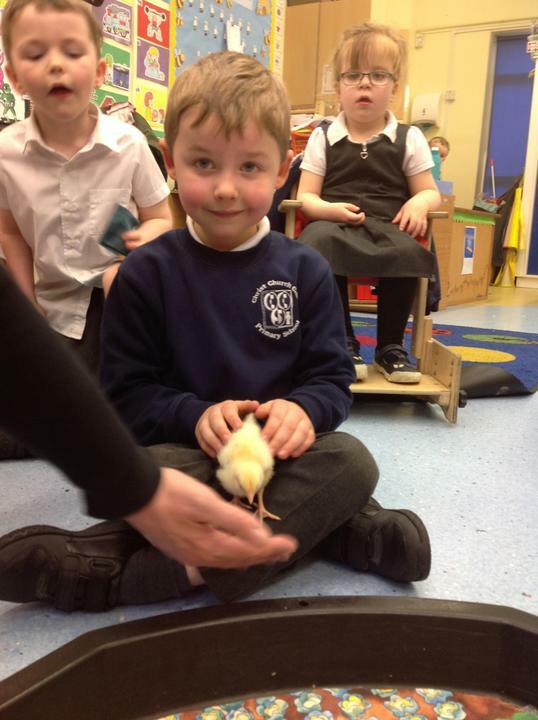 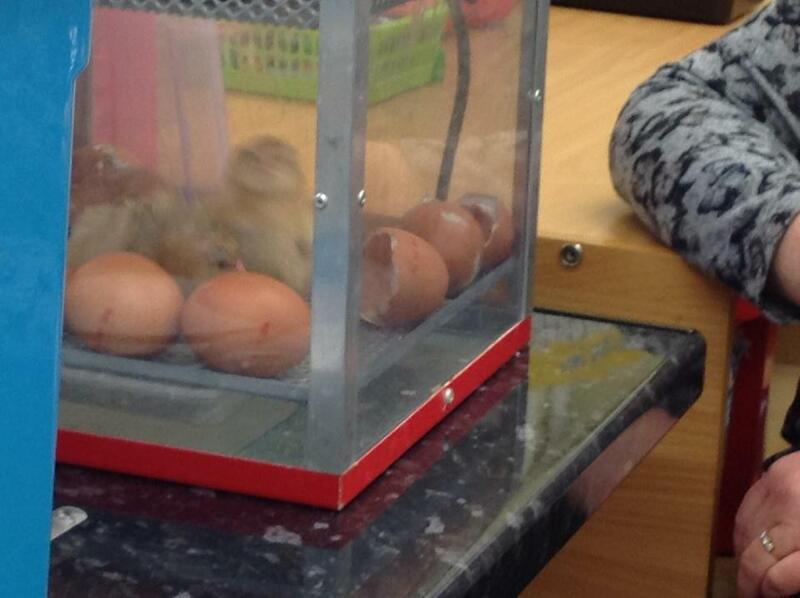 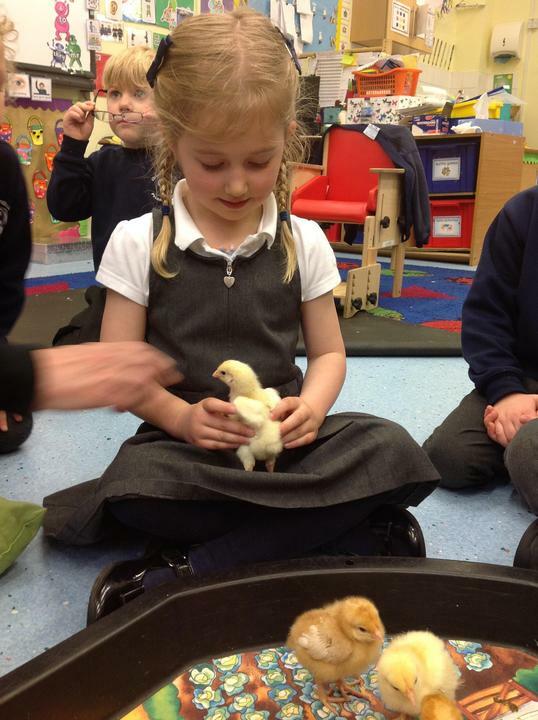 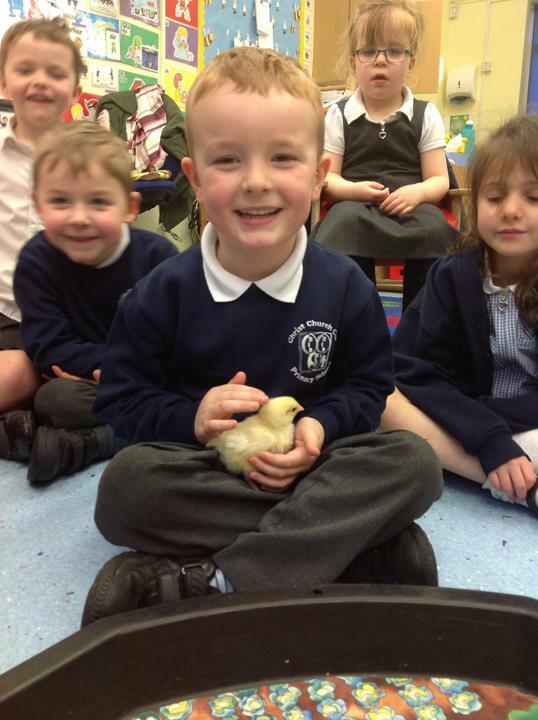 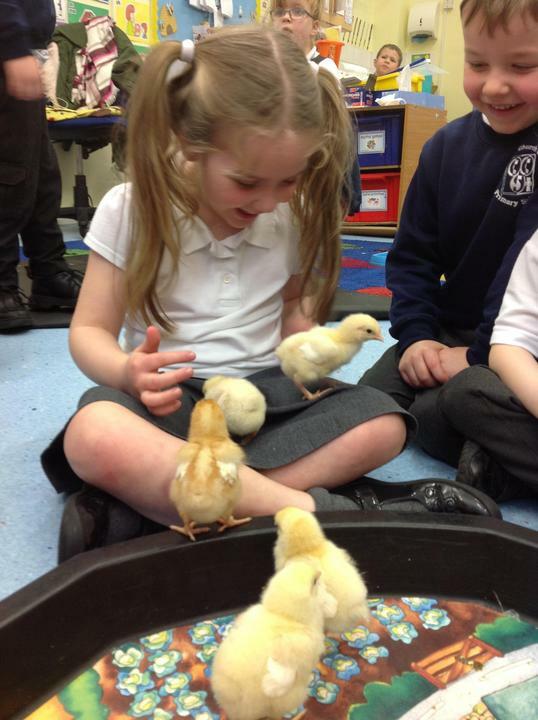 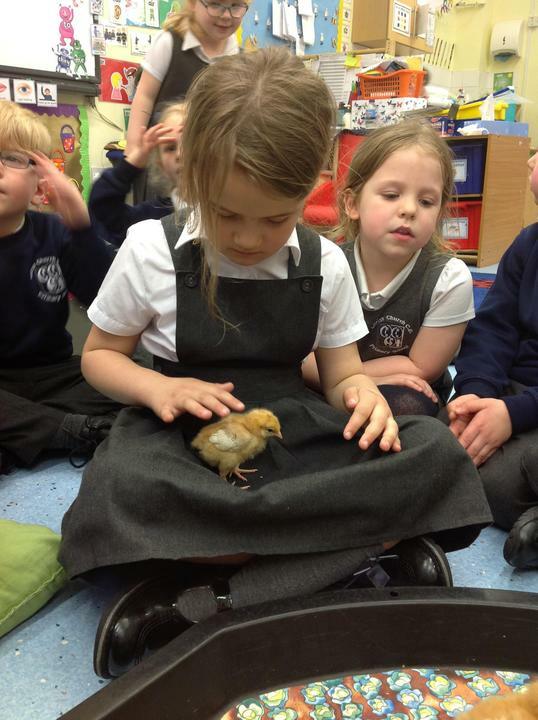 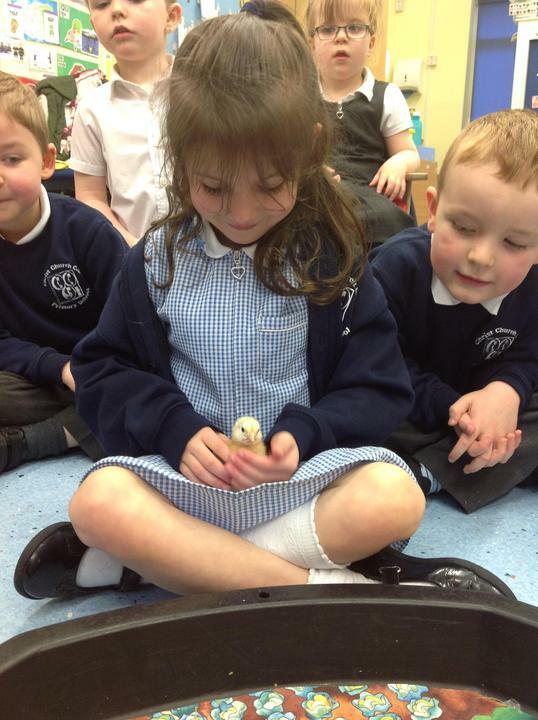 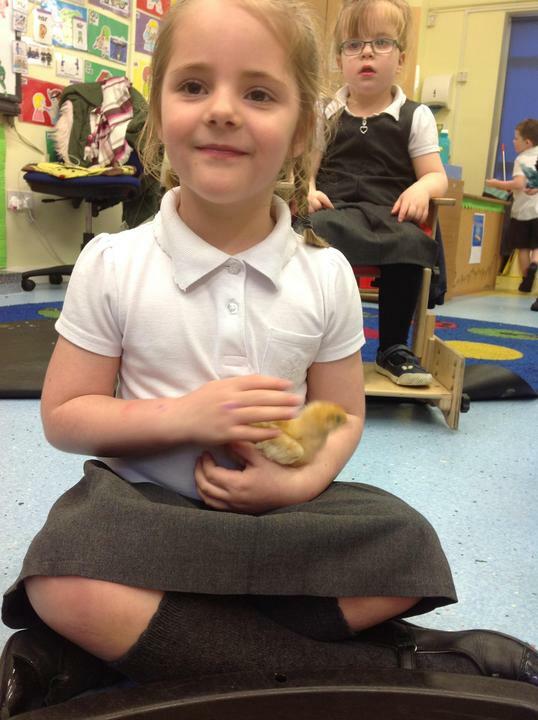 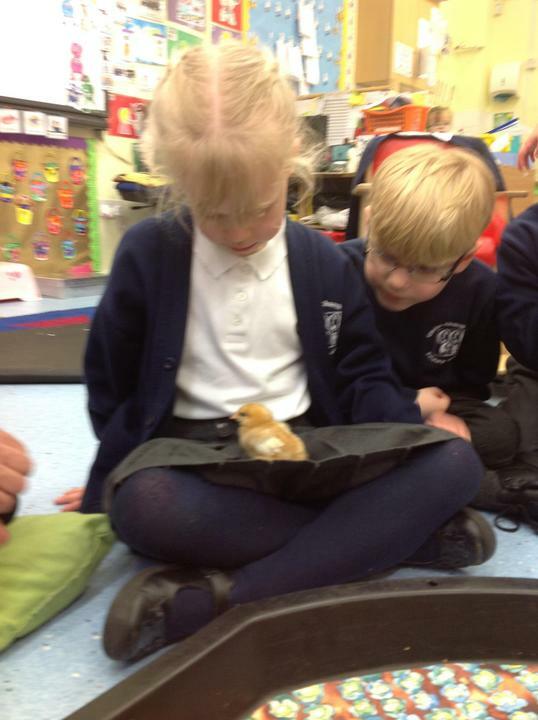 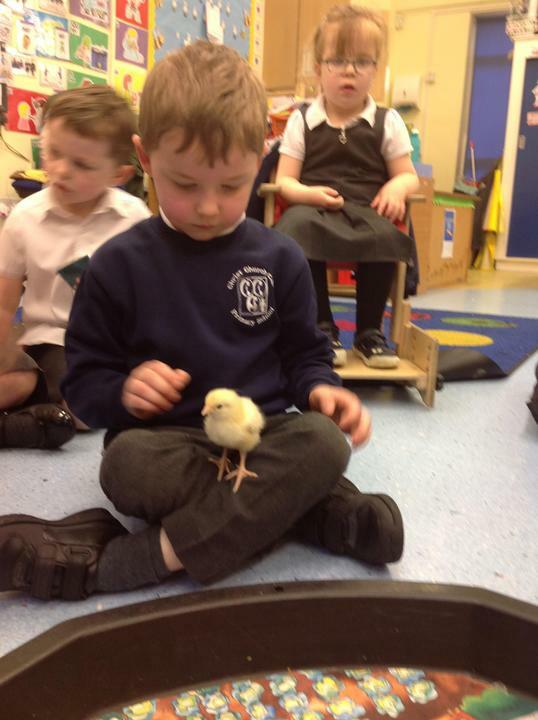 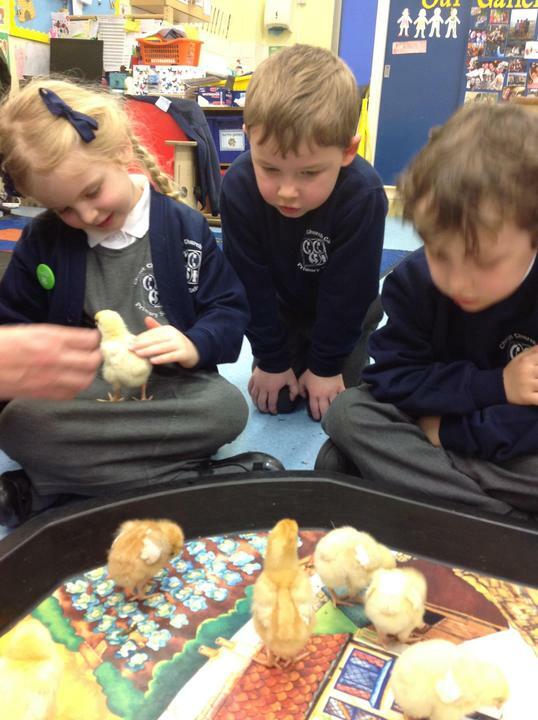 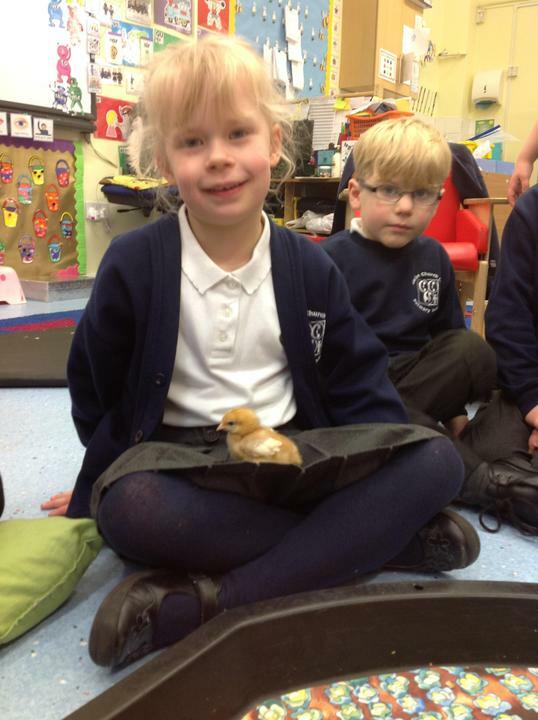 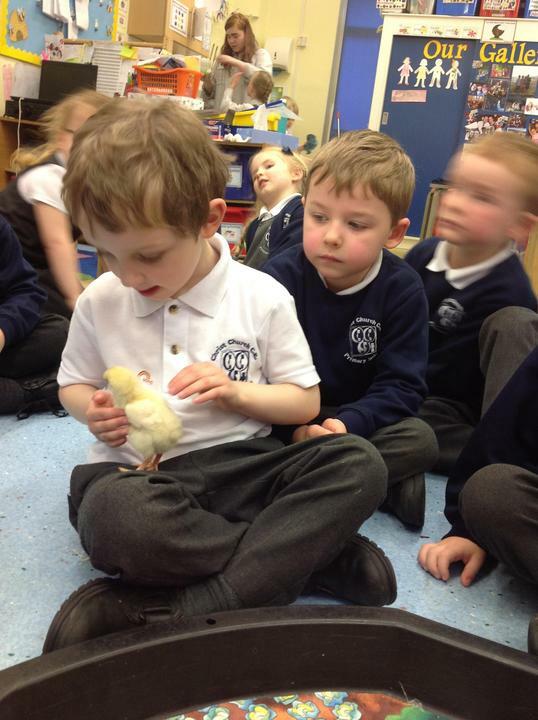 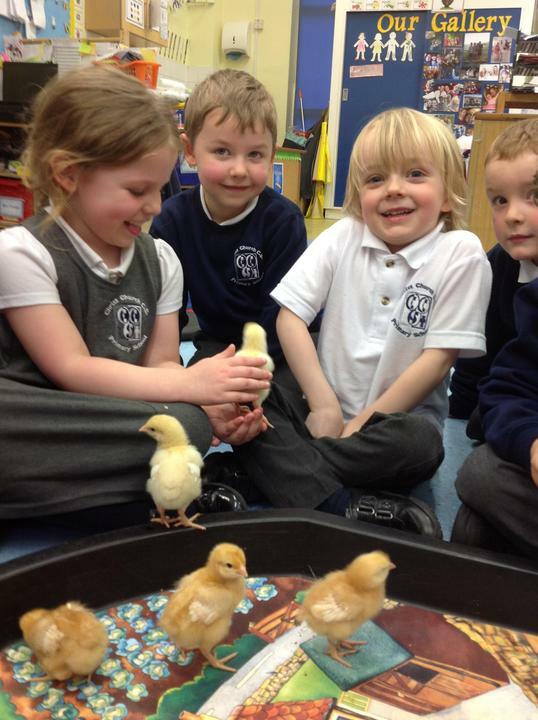 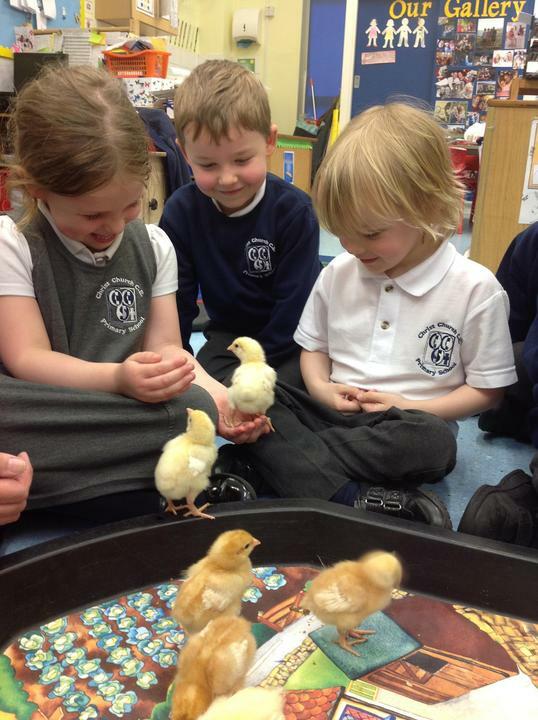 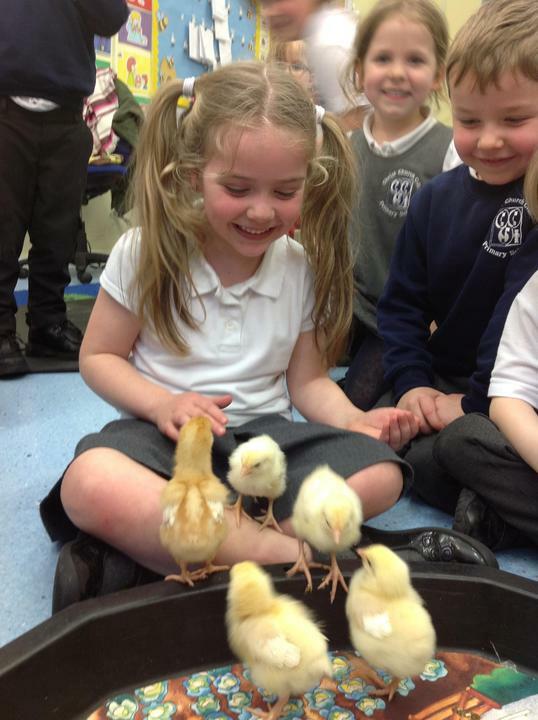 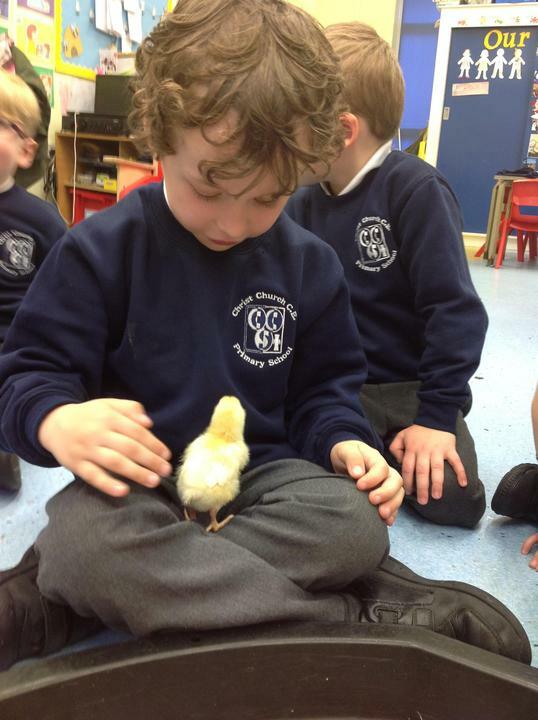 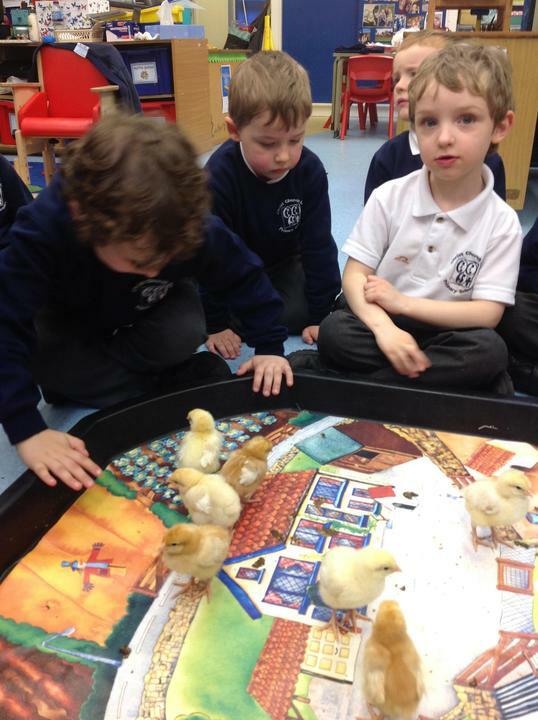 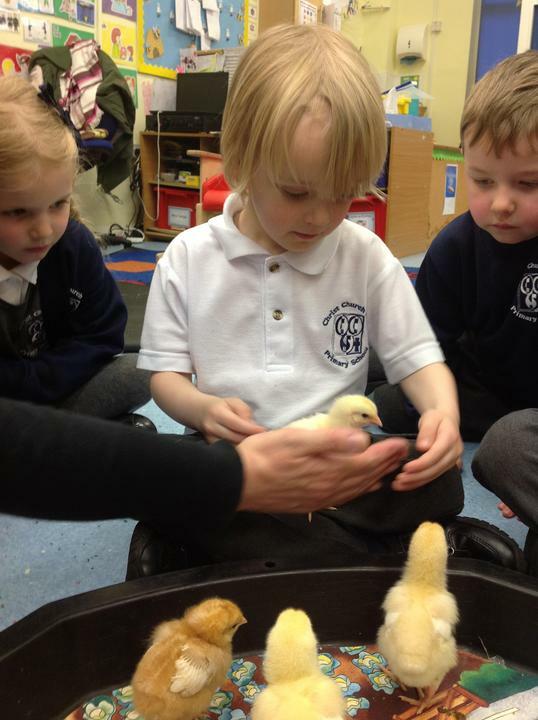 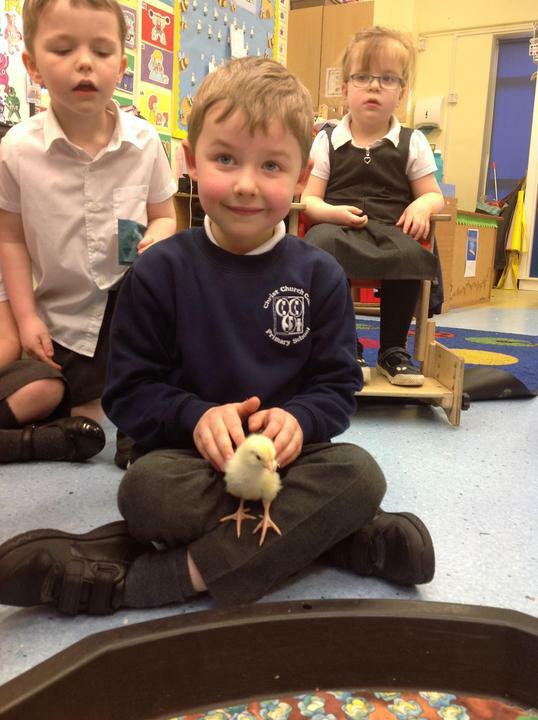 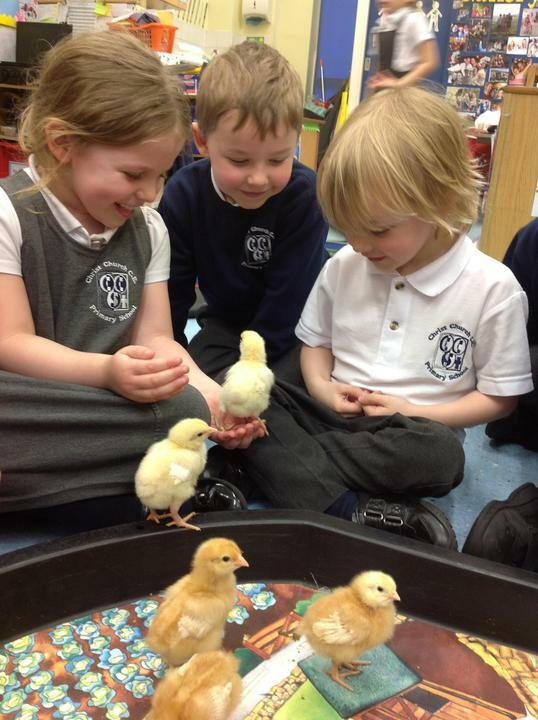 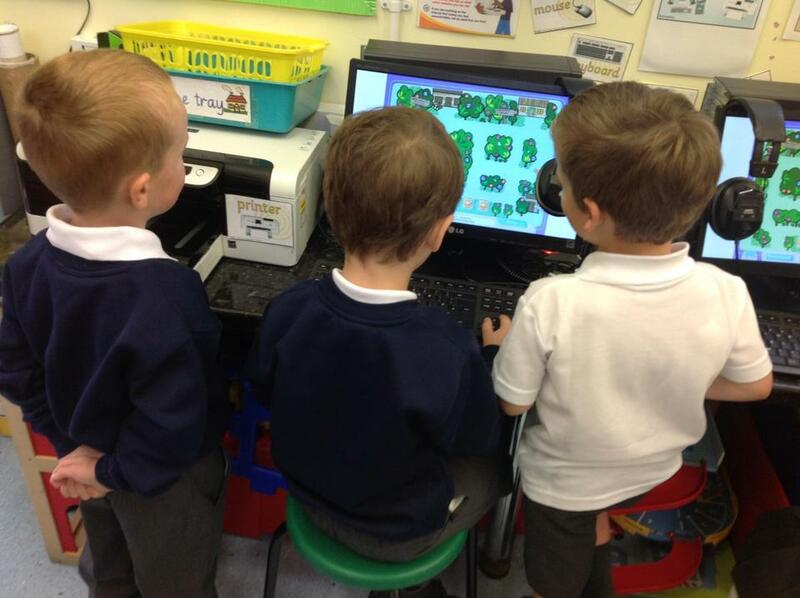 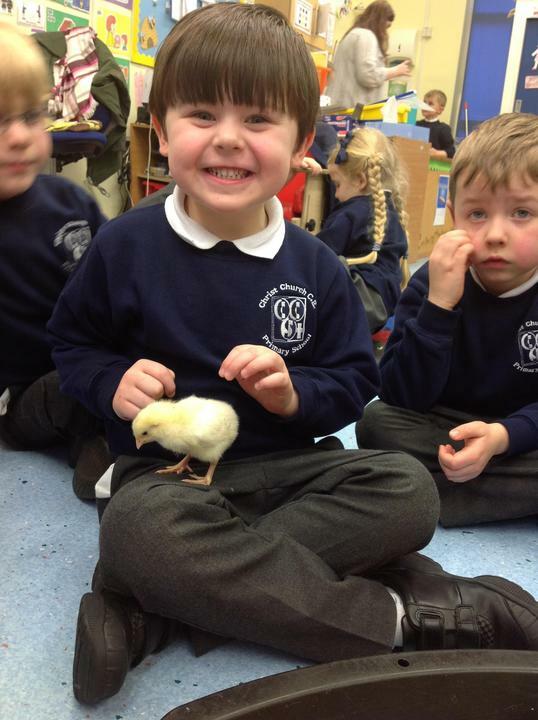 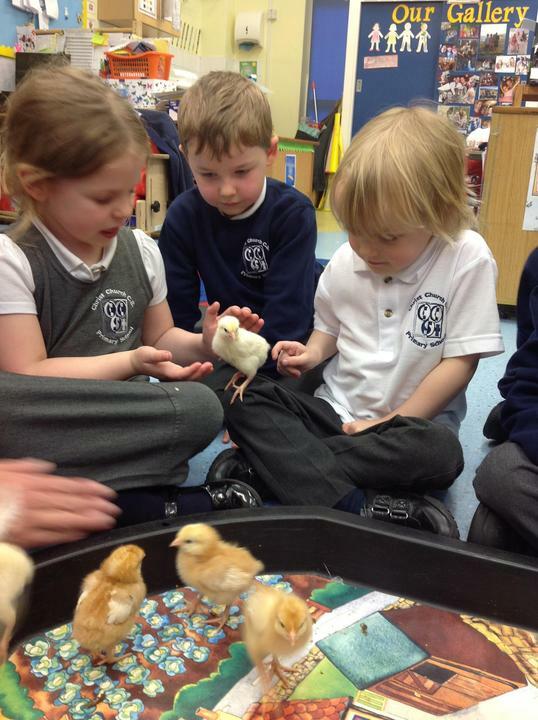 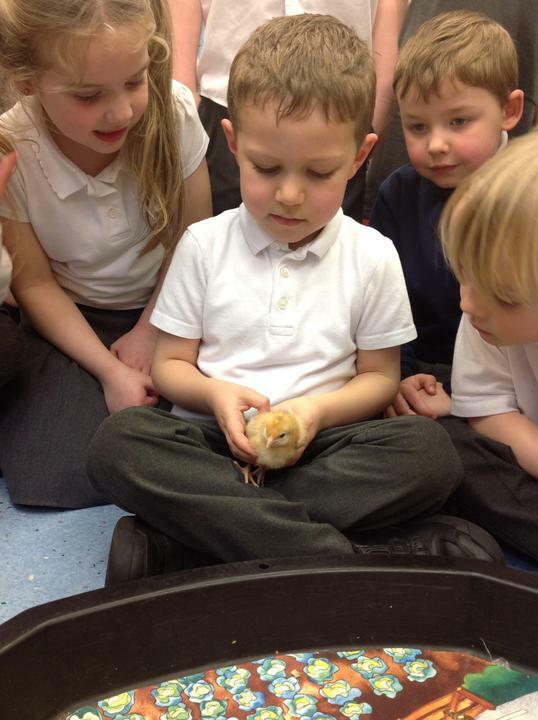 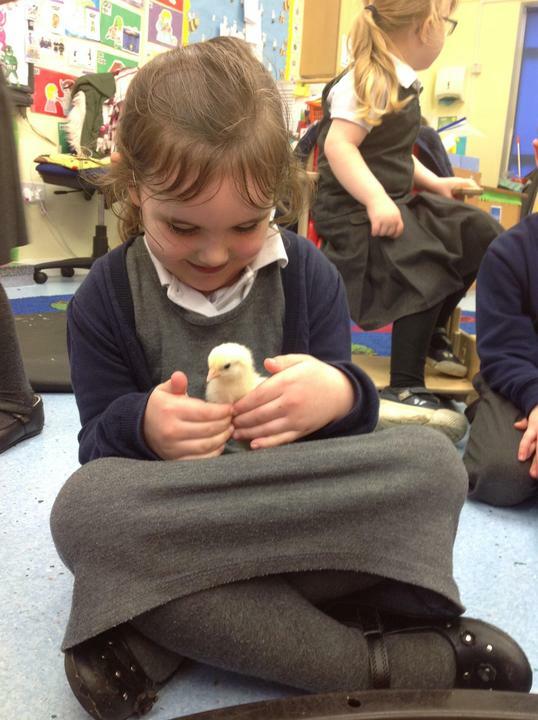 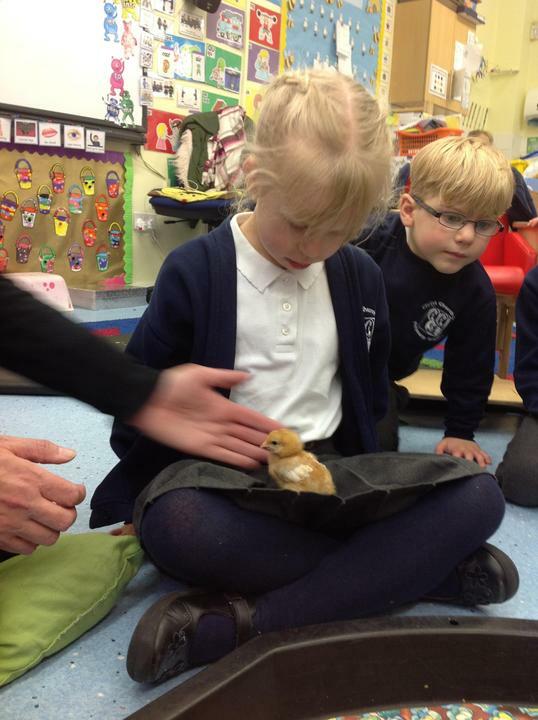 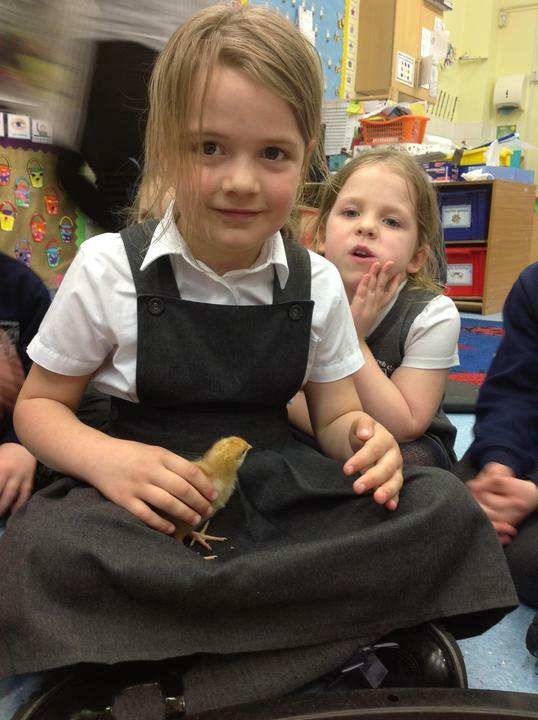 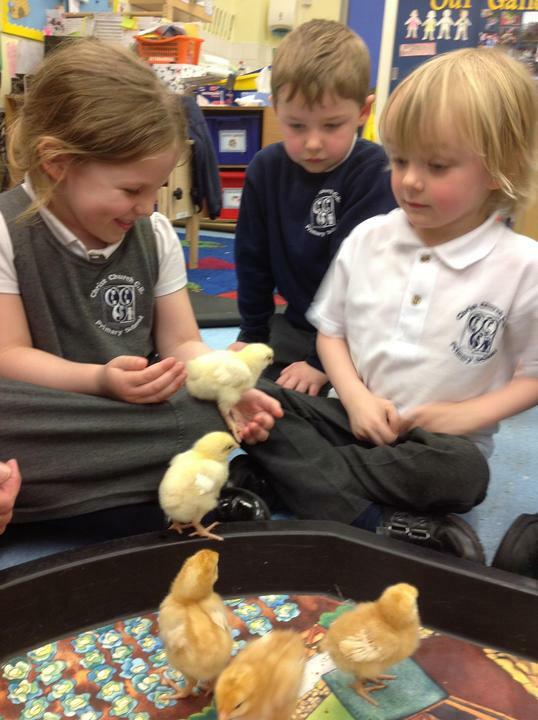 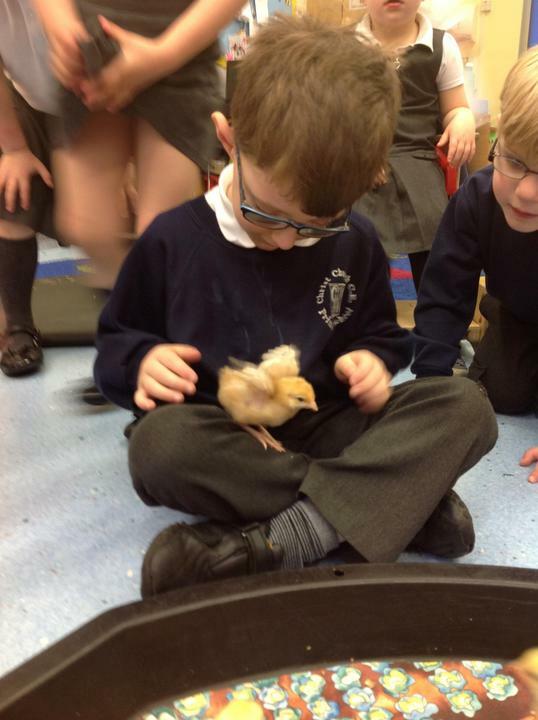 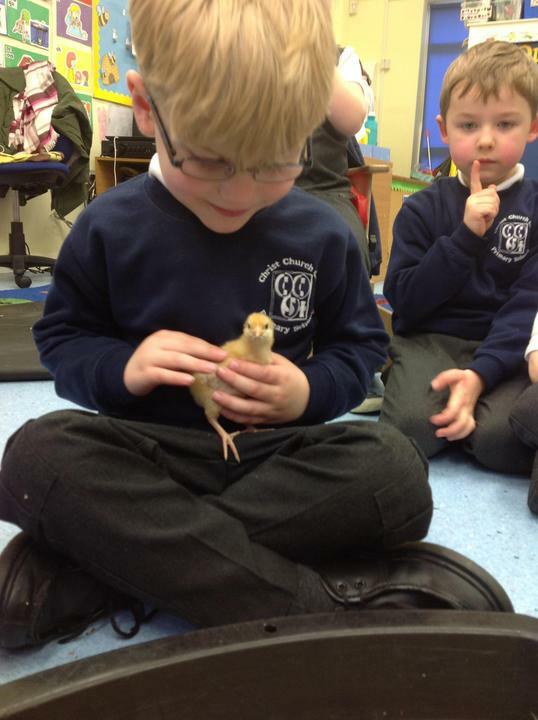 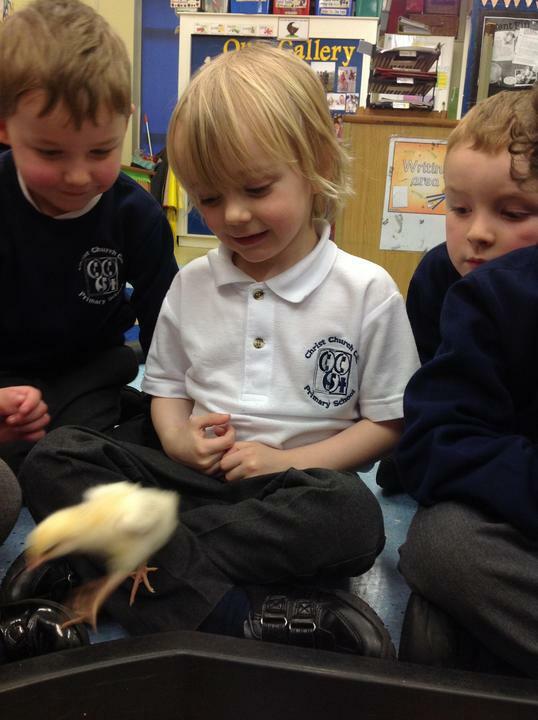 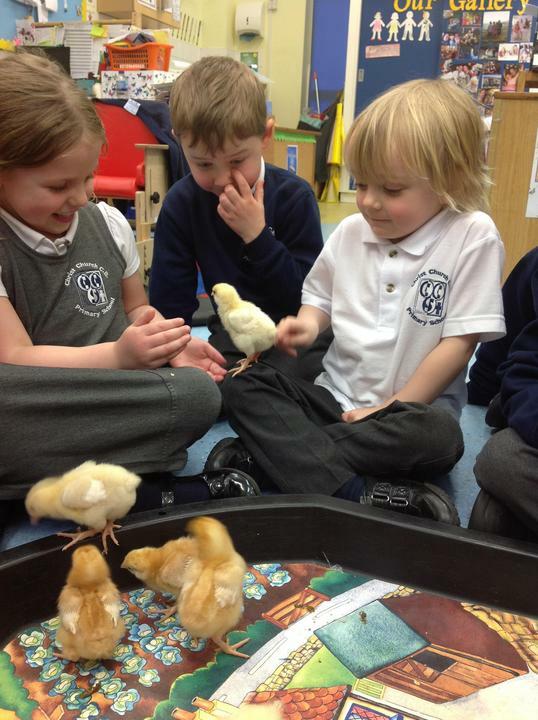 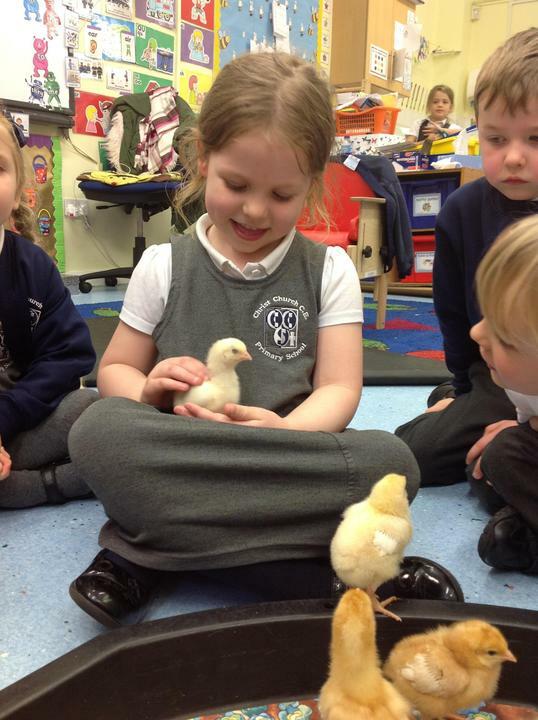 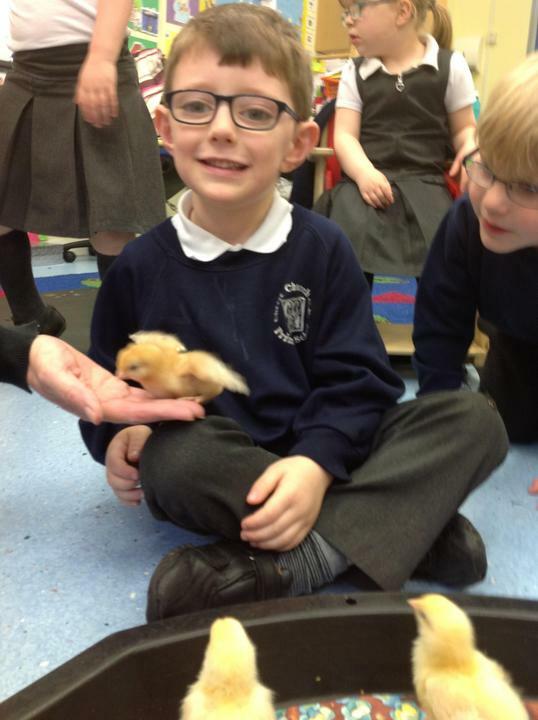 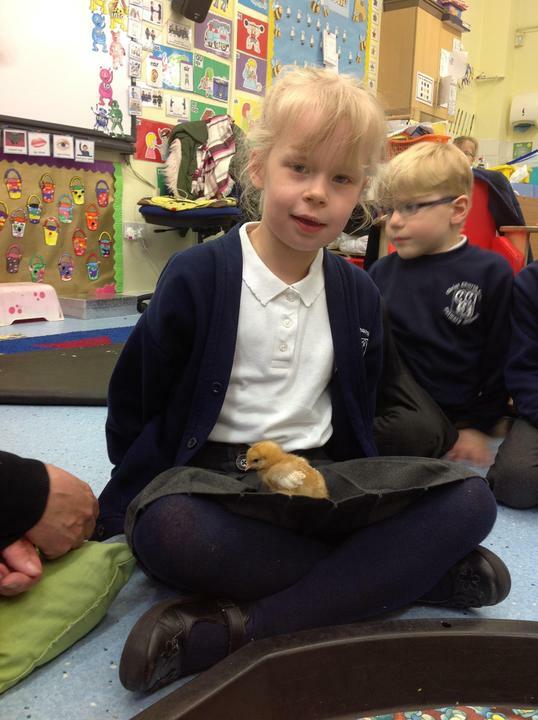 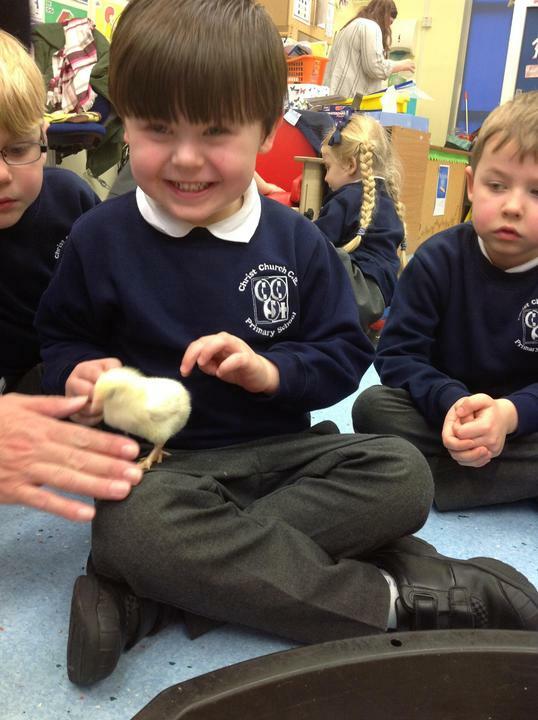 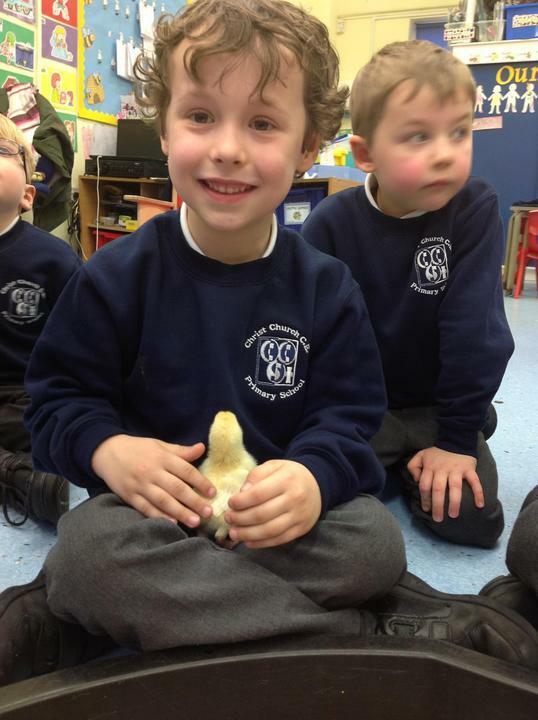 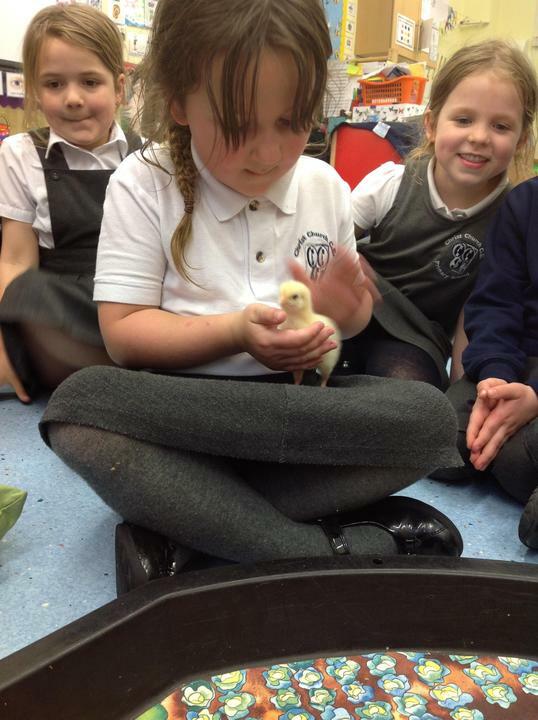 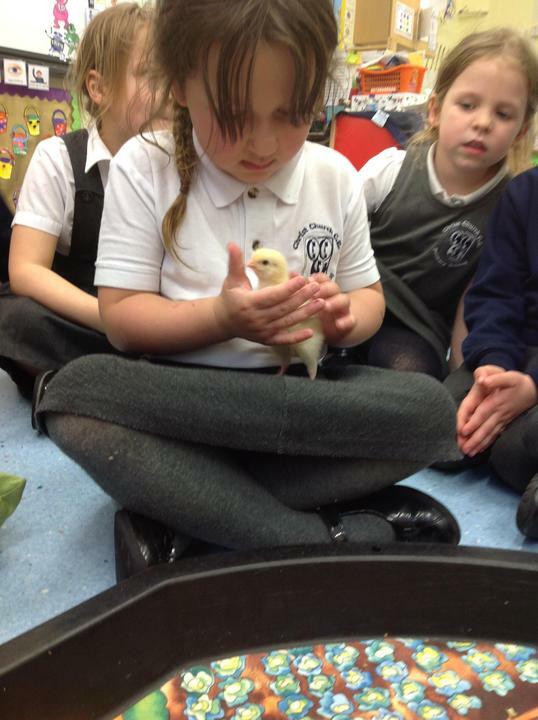 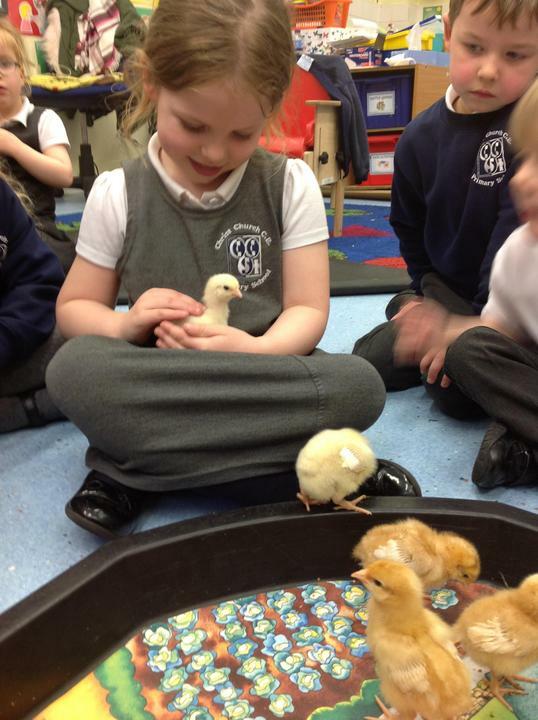 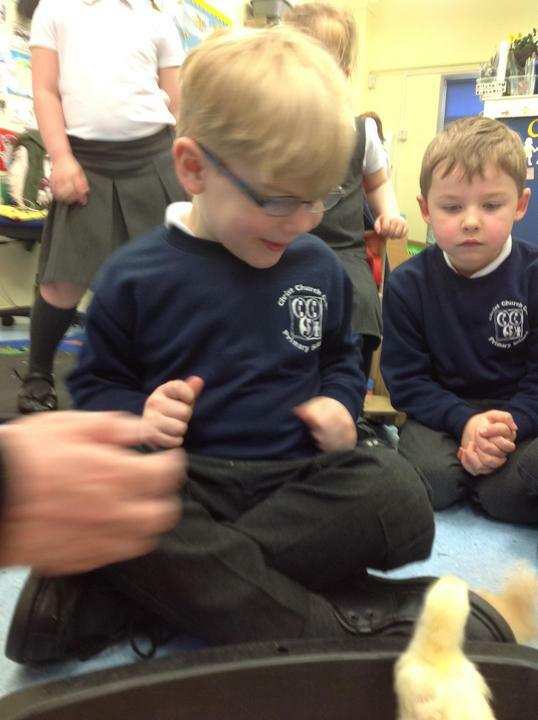 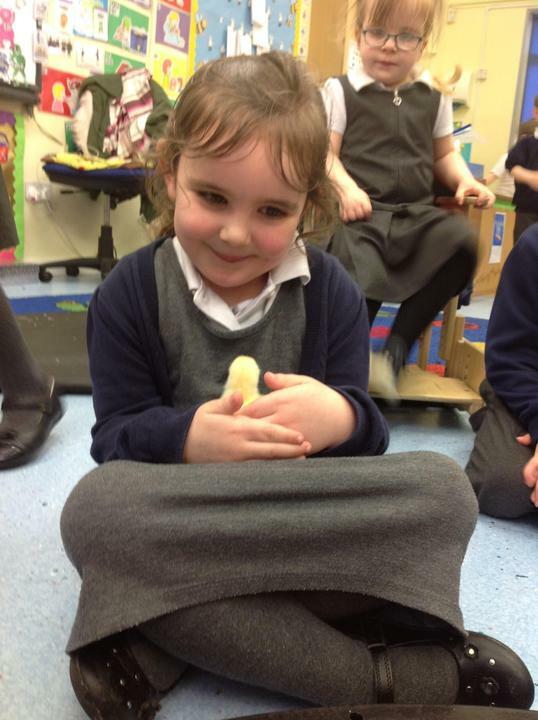 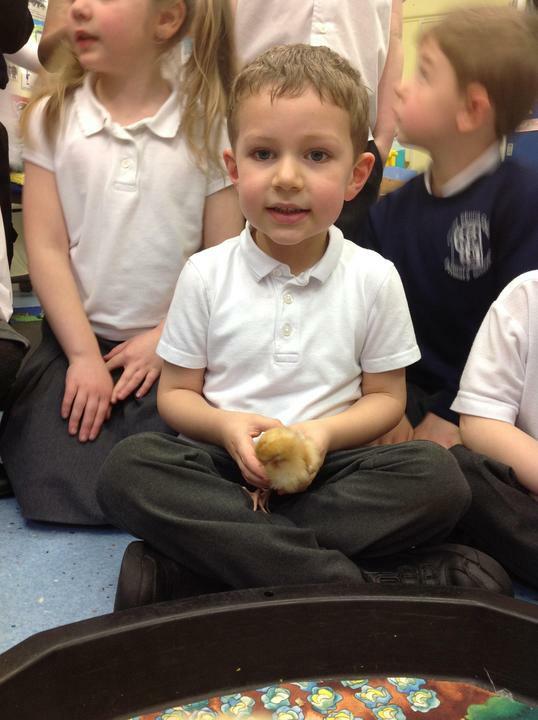 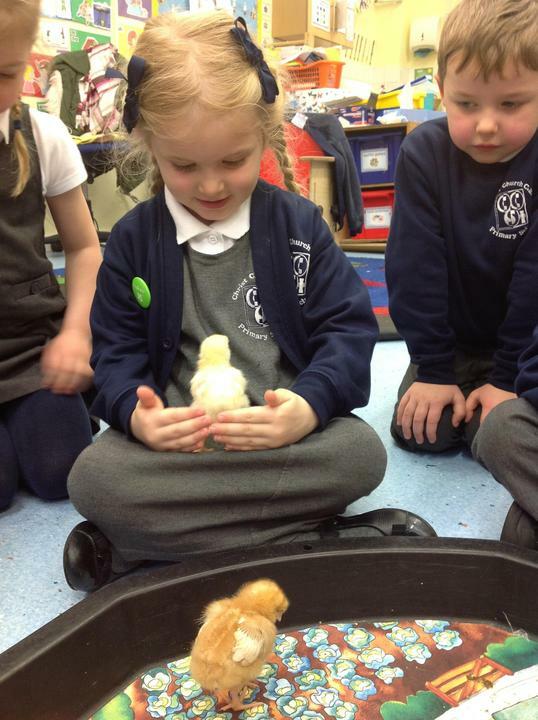 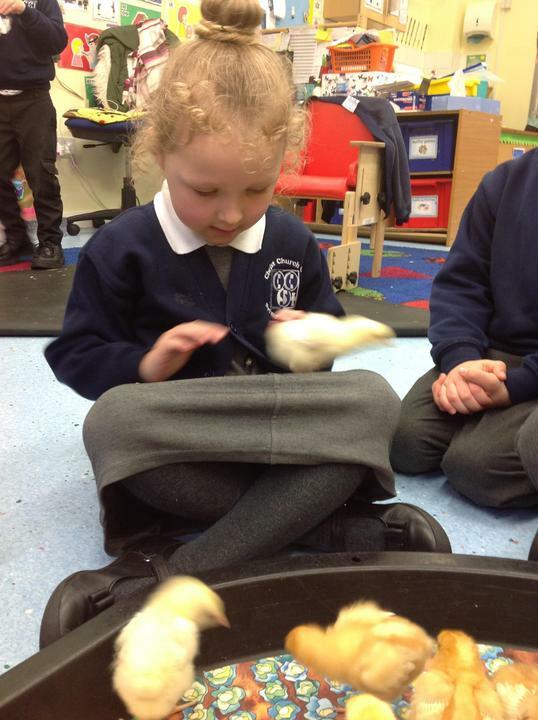 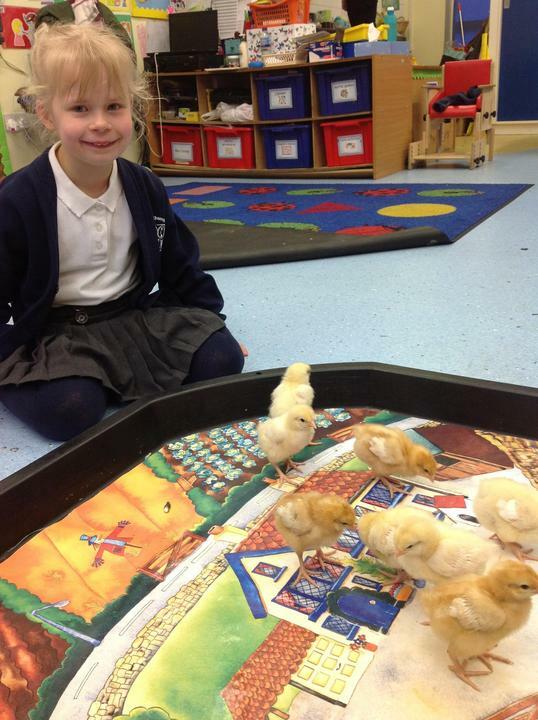 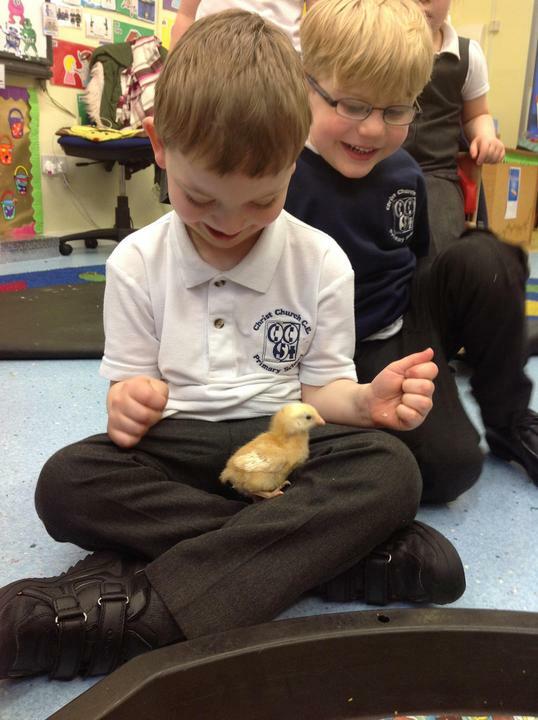 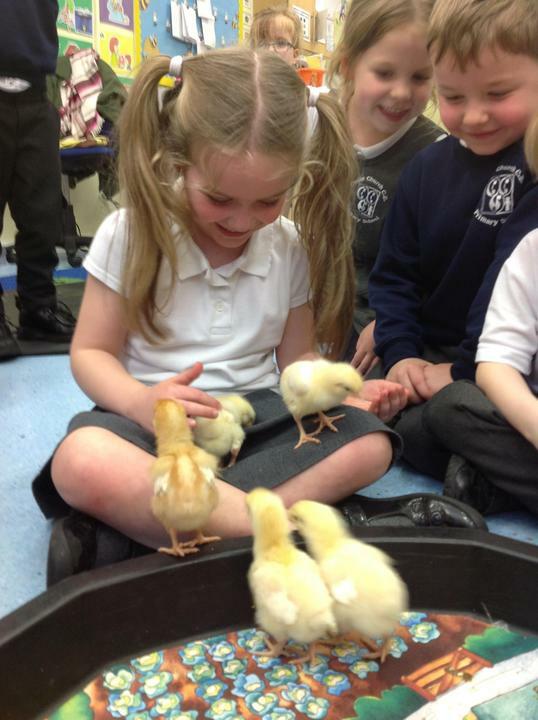 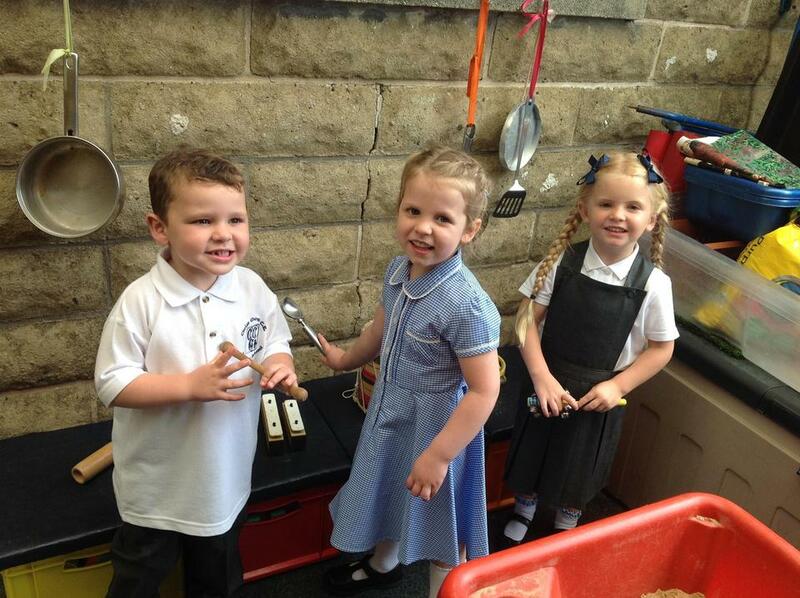 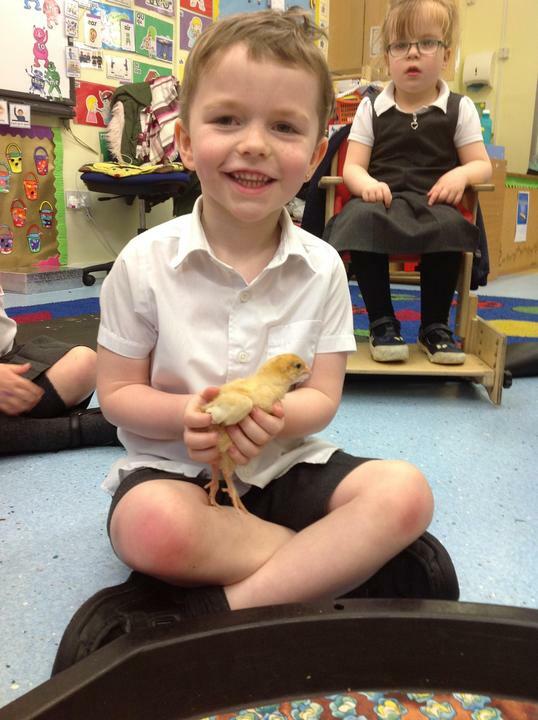 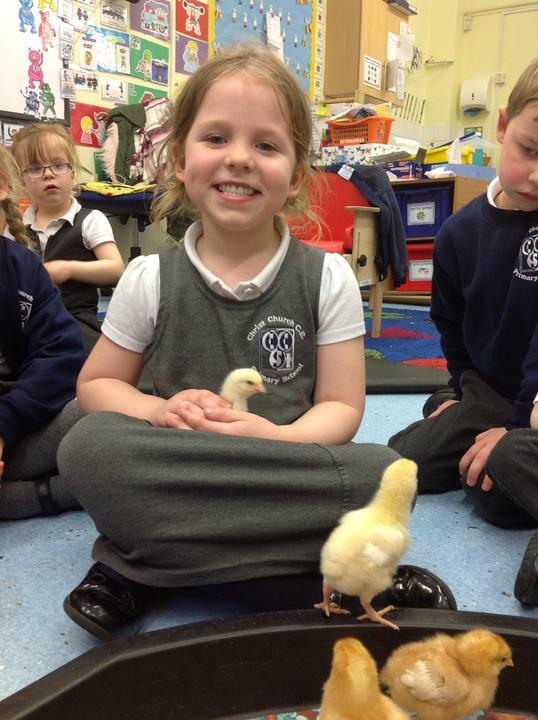 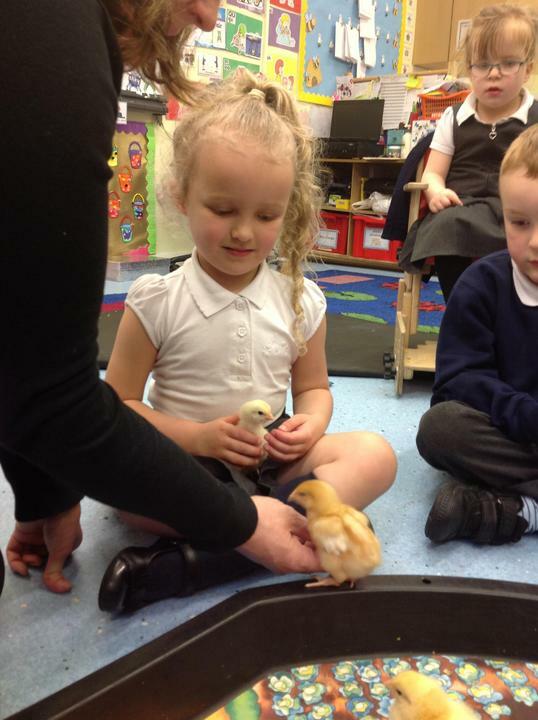 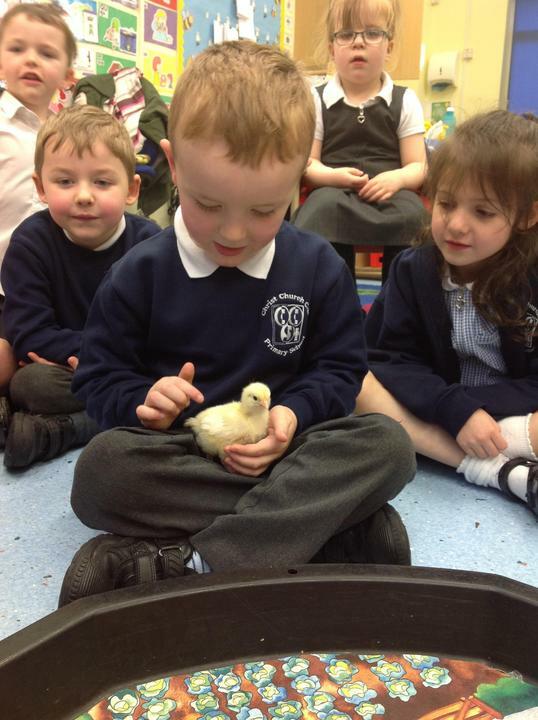 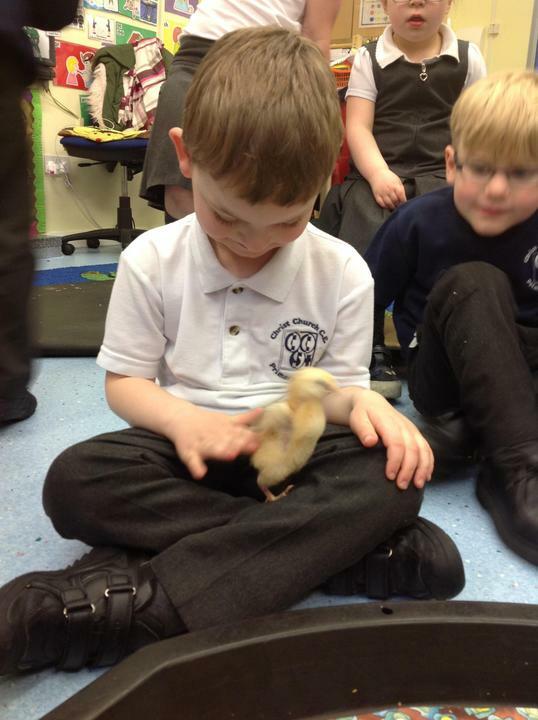 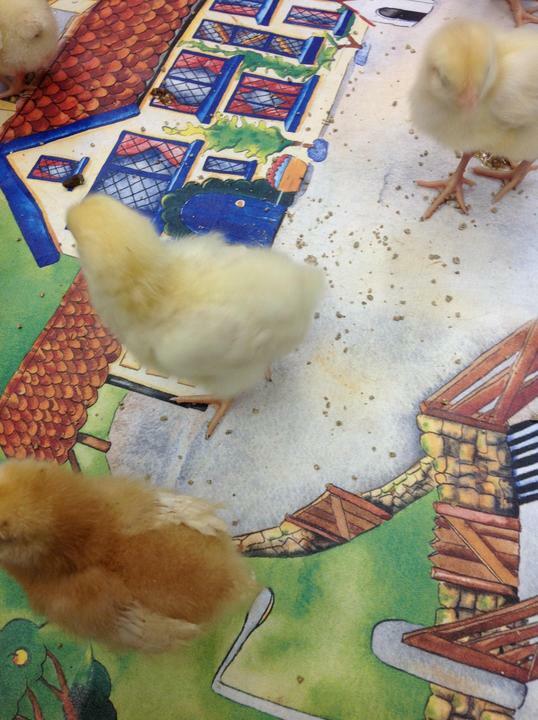 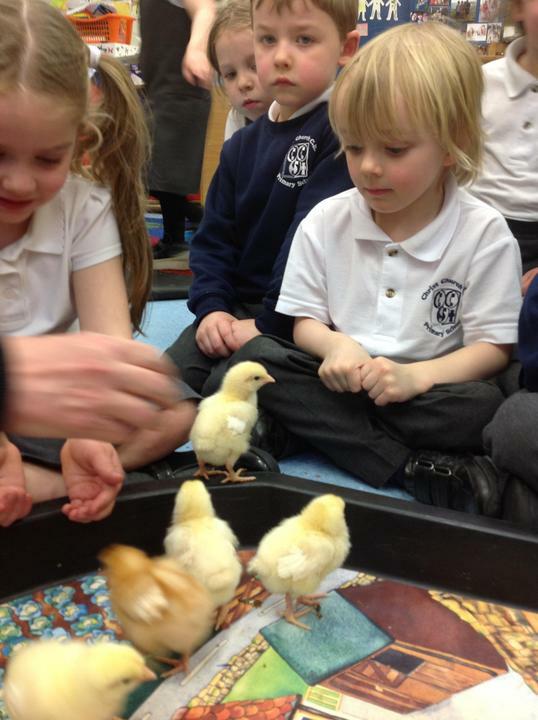 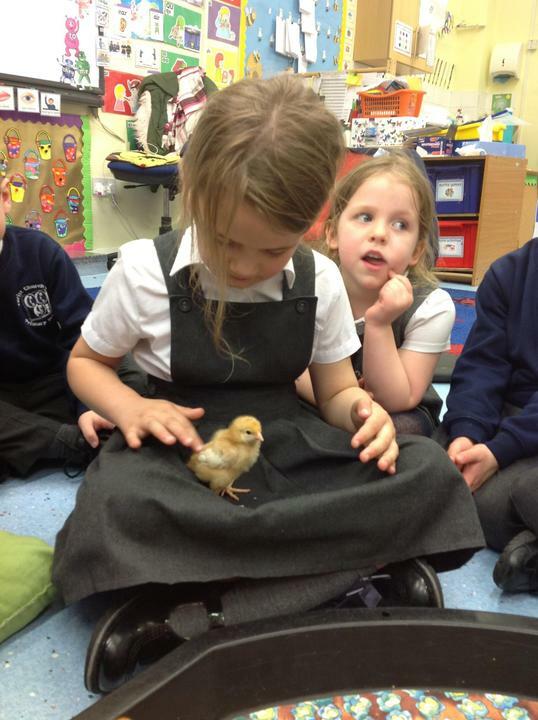 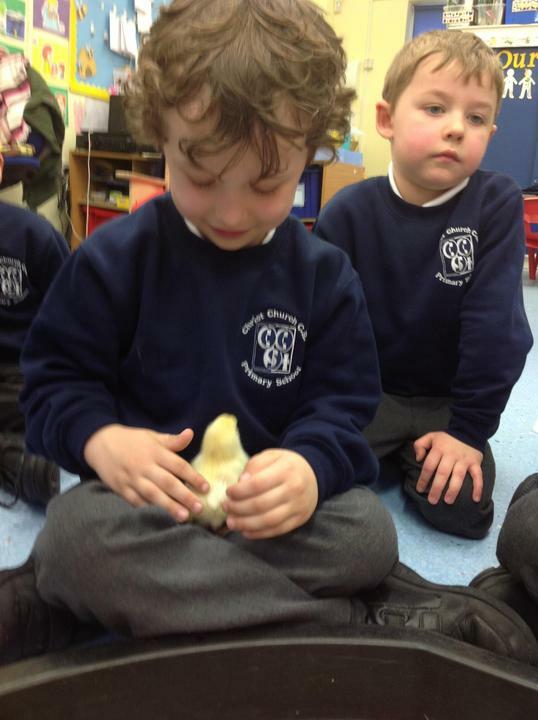 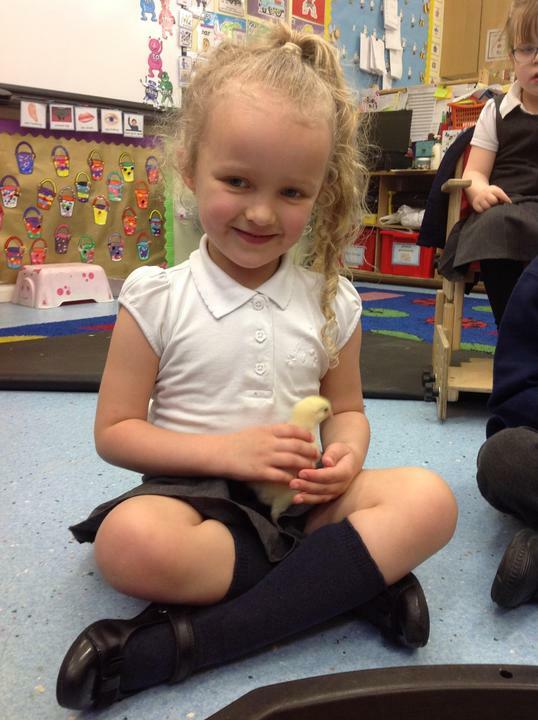 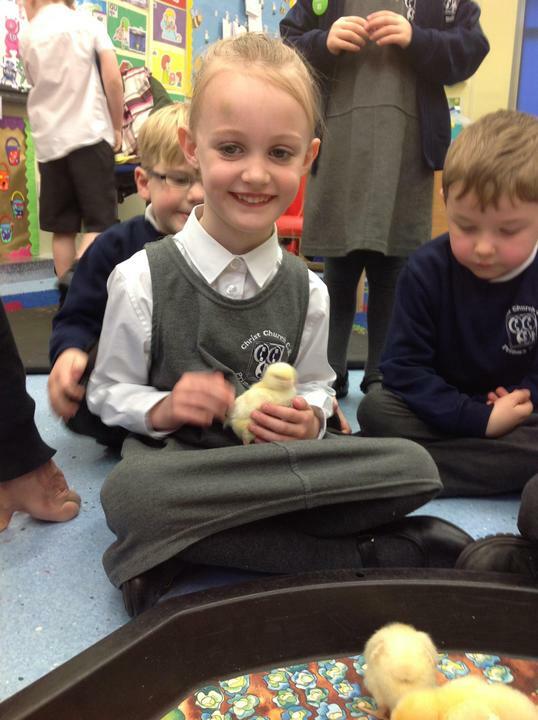 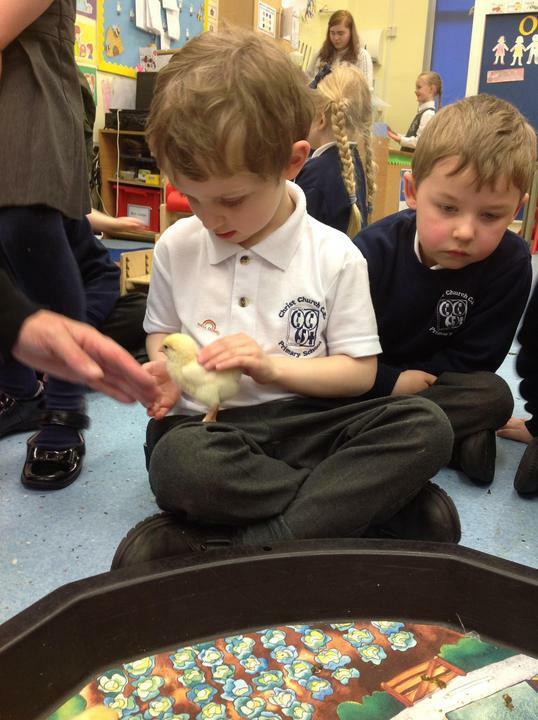 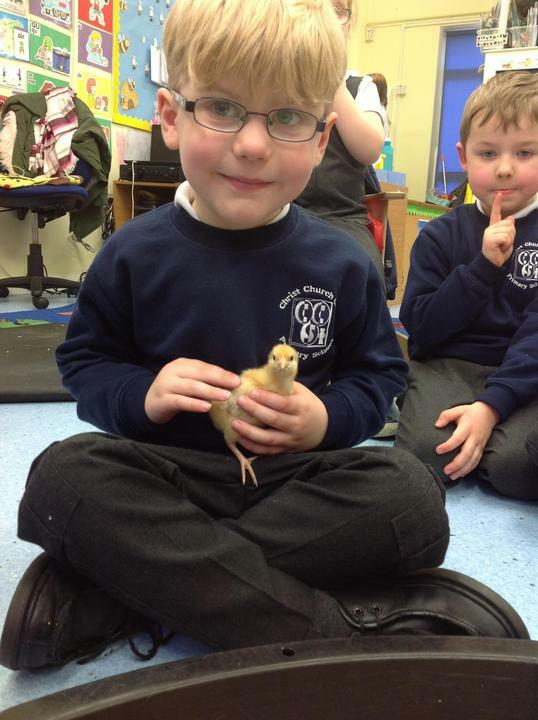 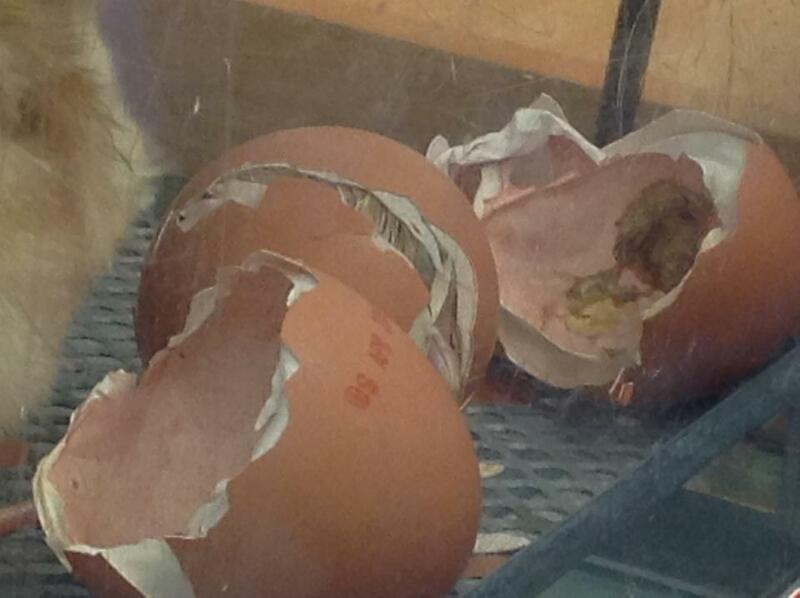 On Wednesday morning, Reception Class walked into their classroom to find three chicks! 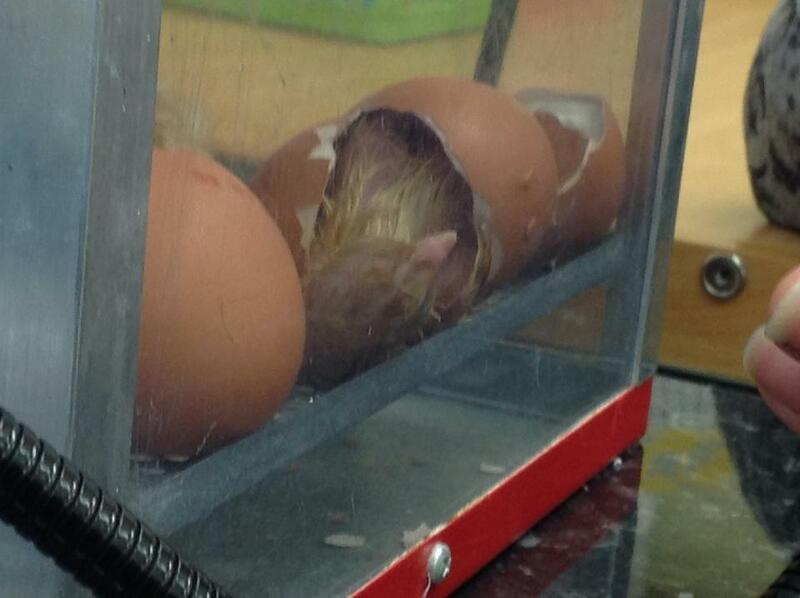 They had hatched over night. 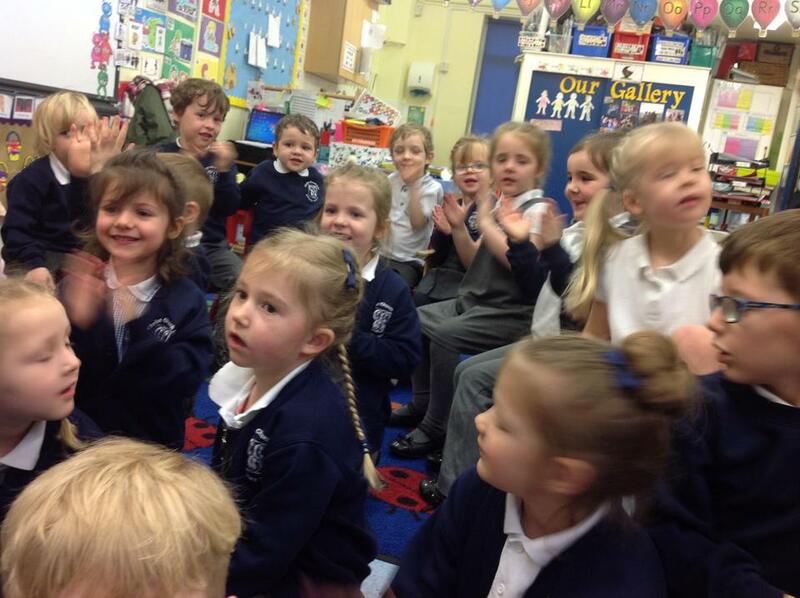 Reception were very excited! 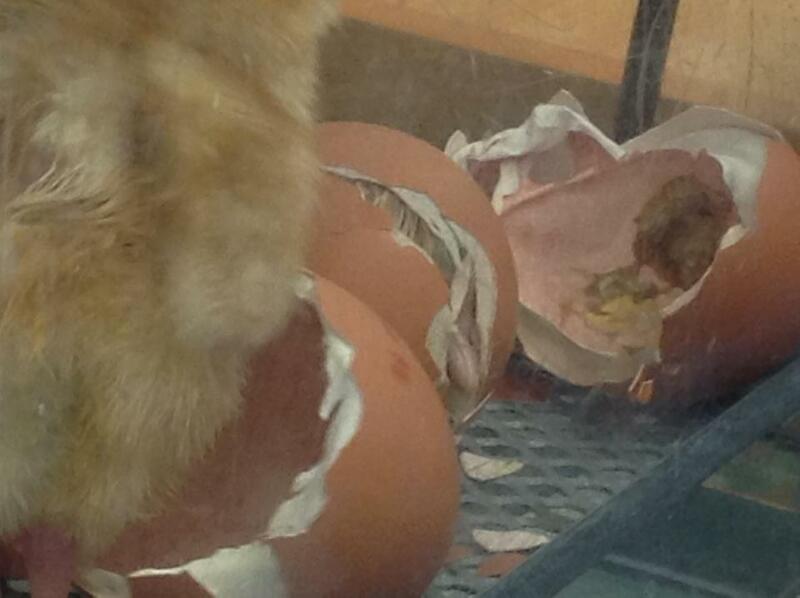 Over the day, we watched two chicks hatch live. 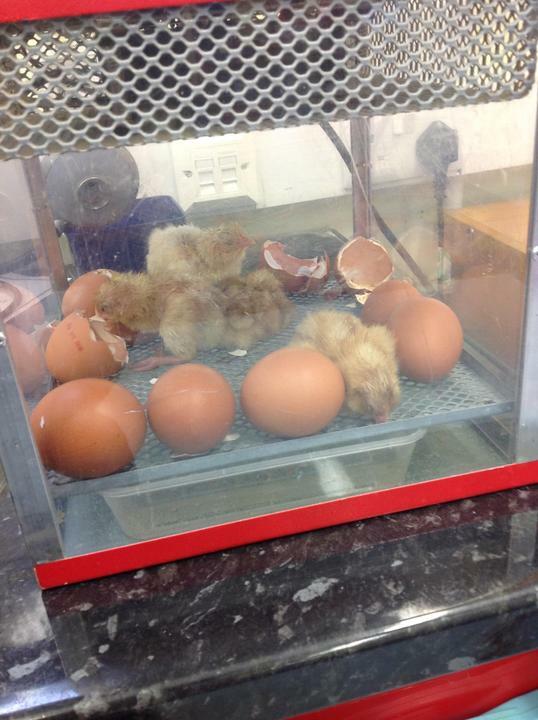 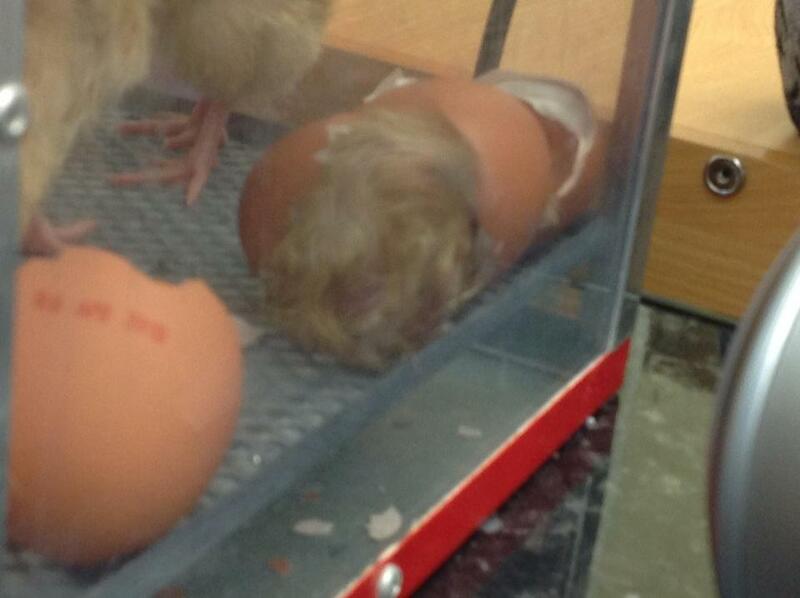 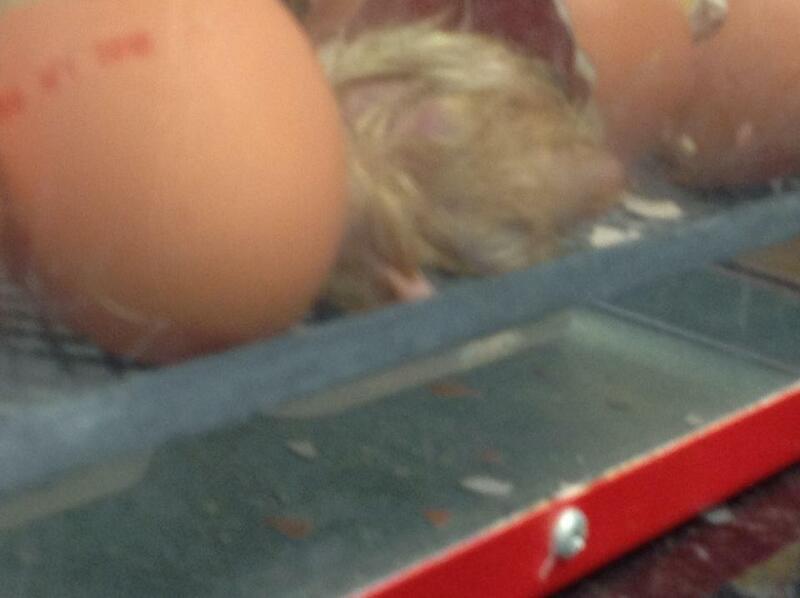 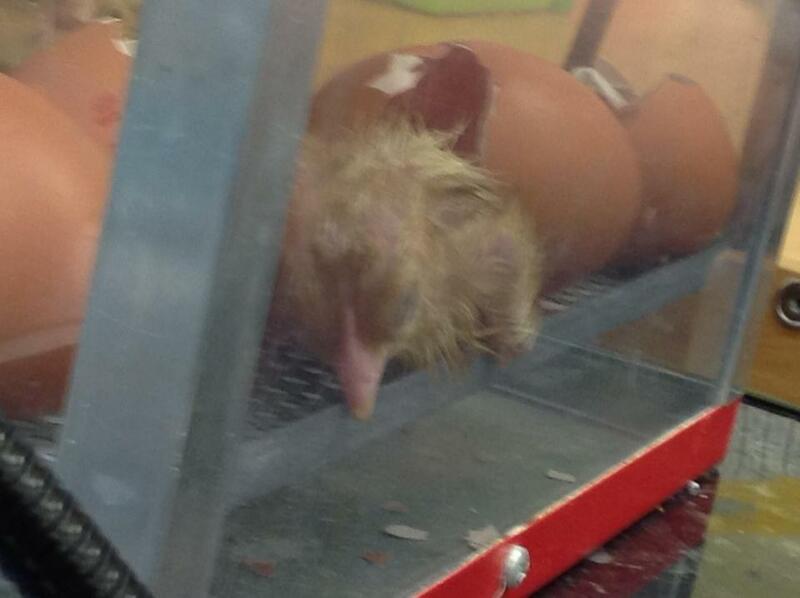 Below are some photographs of the chicks hatching. 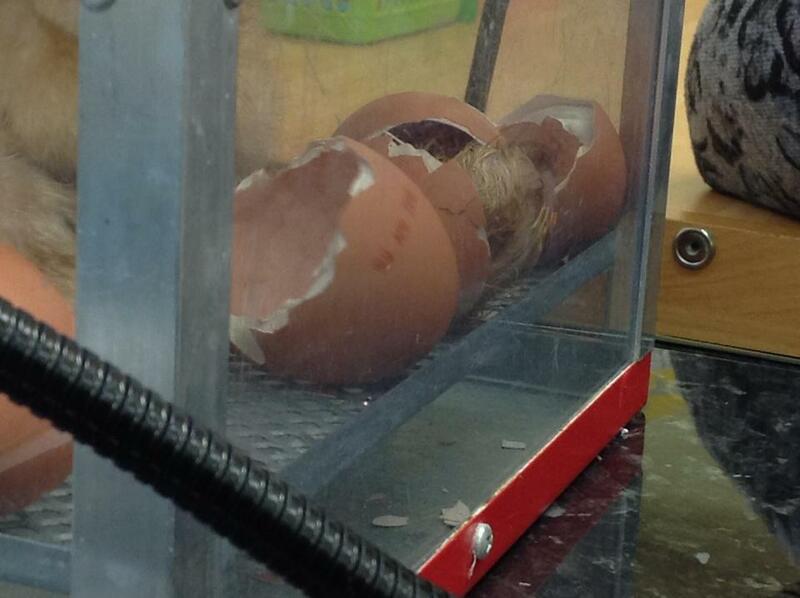 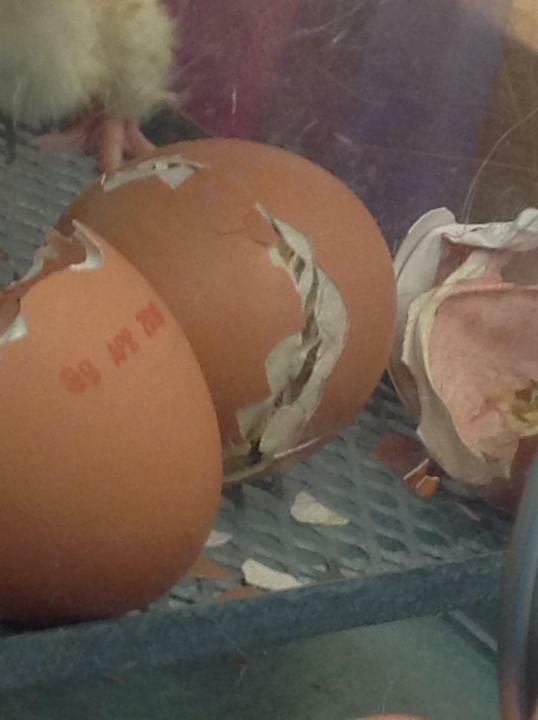 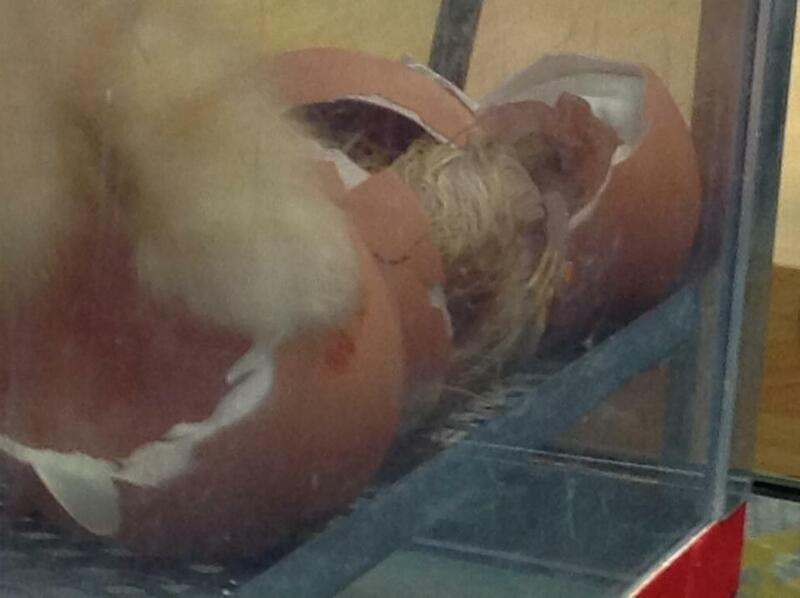 On Tuesday, we noticed a couple of the eggs had tiny cracks in them. 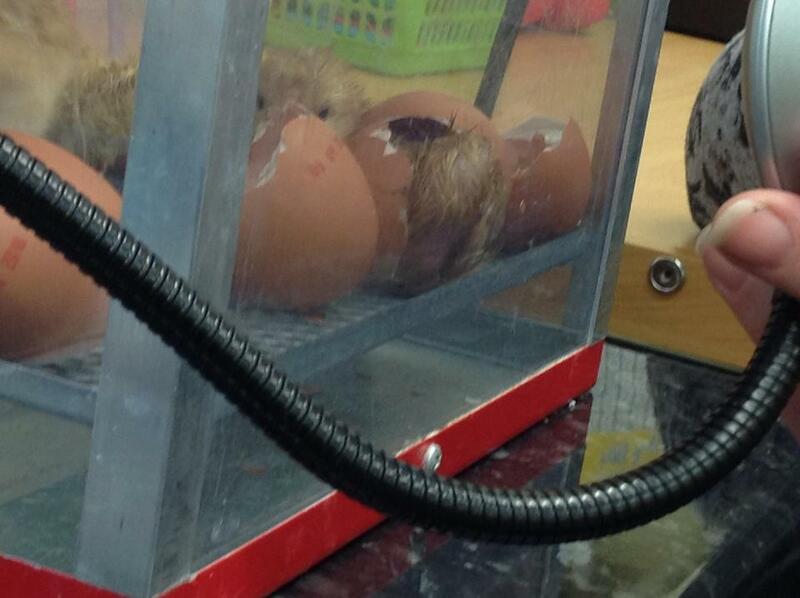 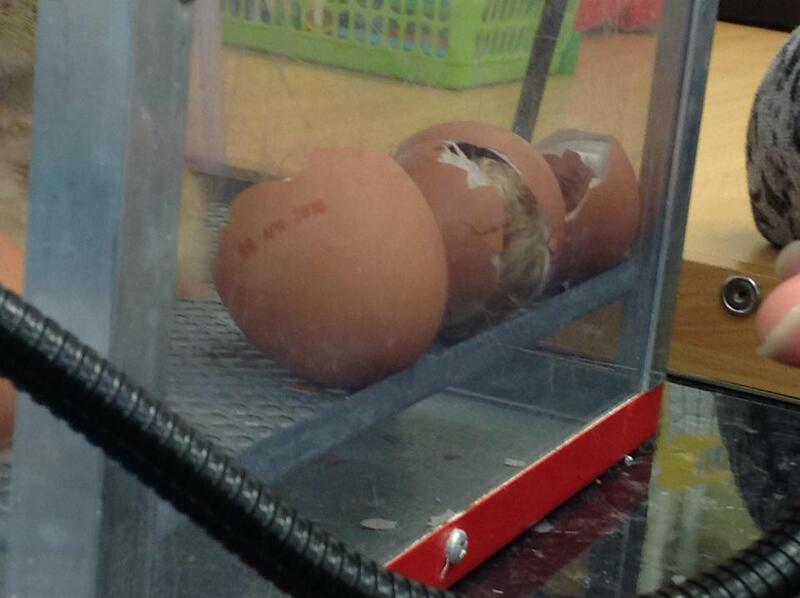 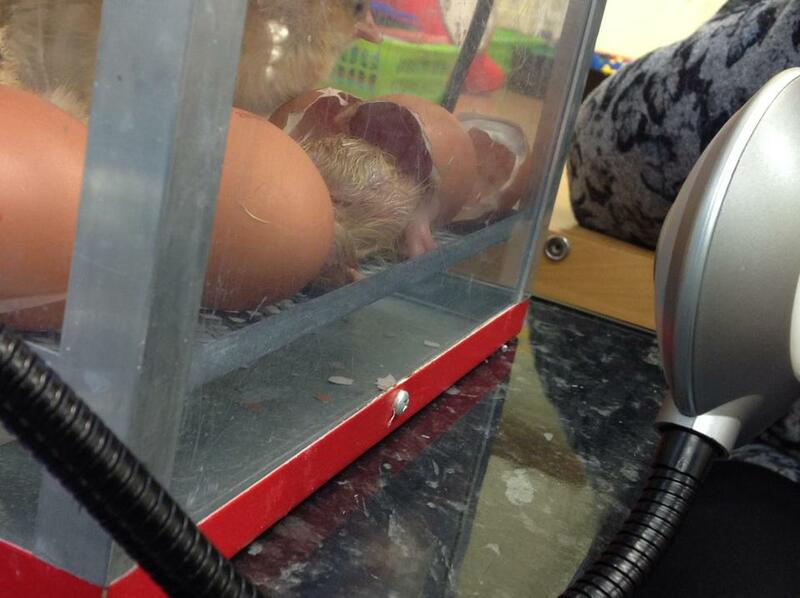 On Monday, we had some very exciting news.10 chick eggs arrived in our classroom. 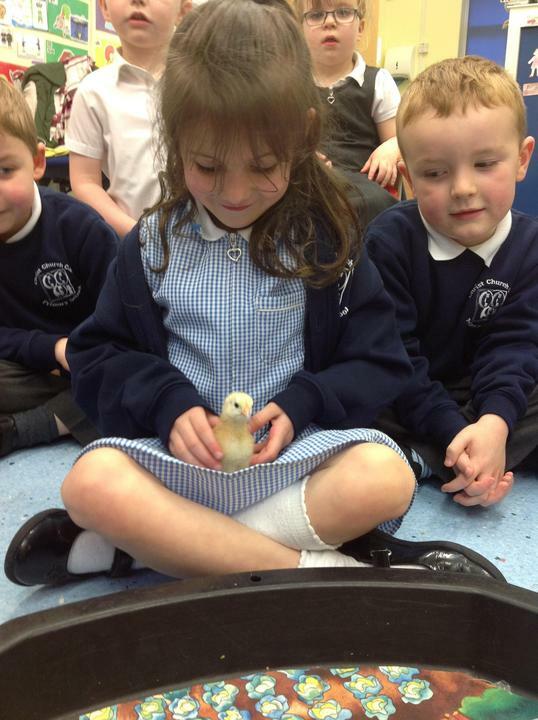 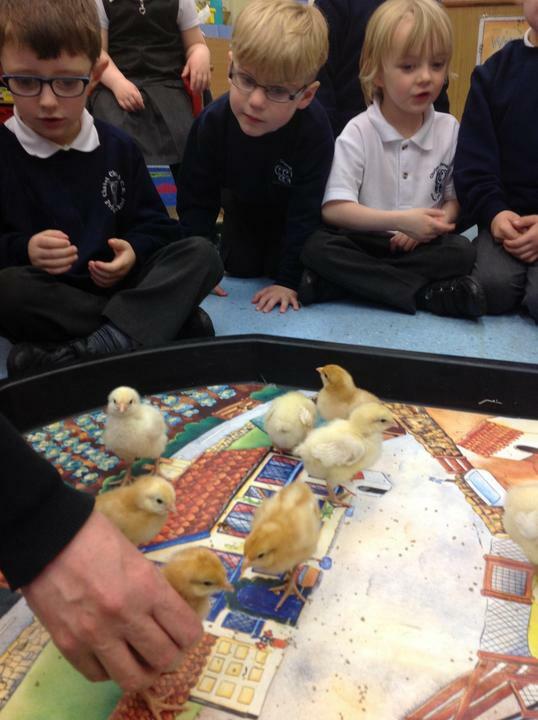 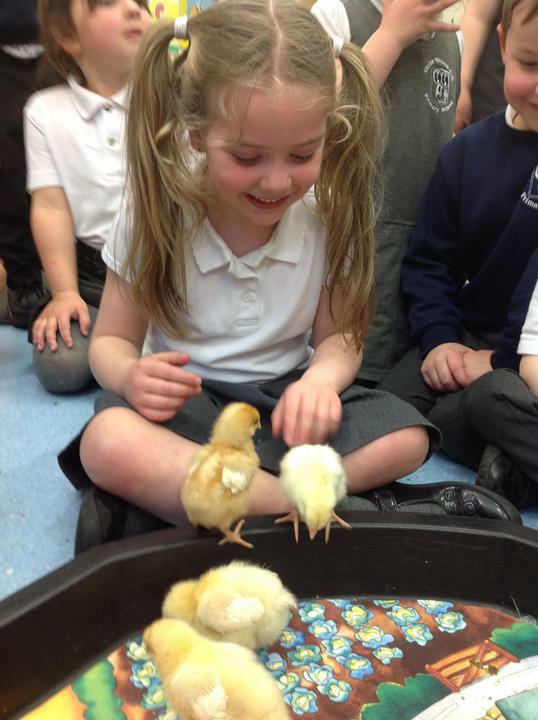 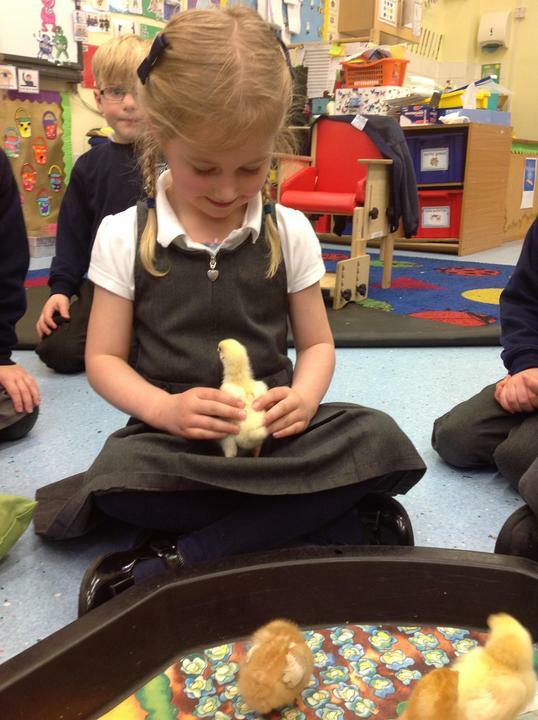 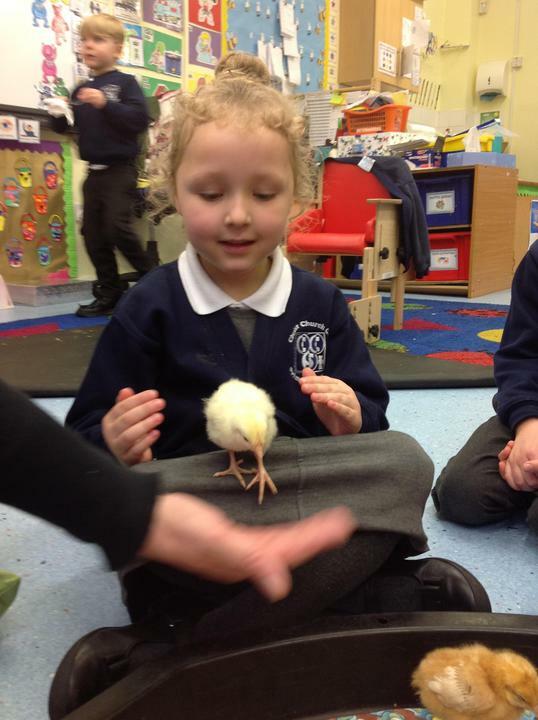 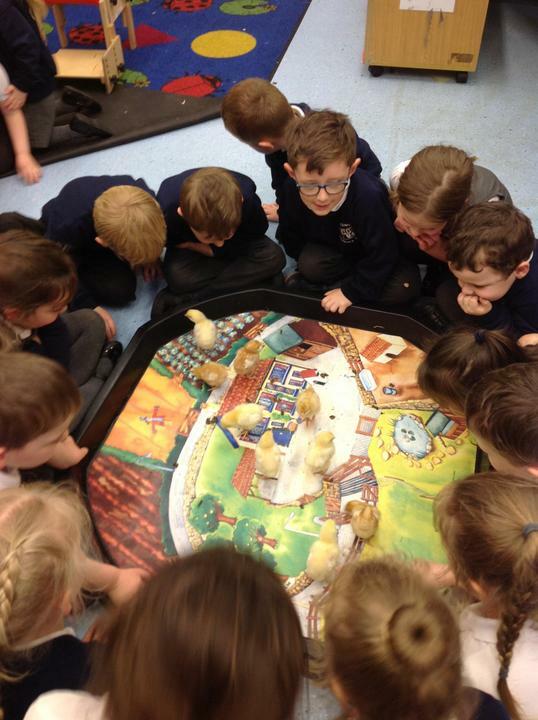 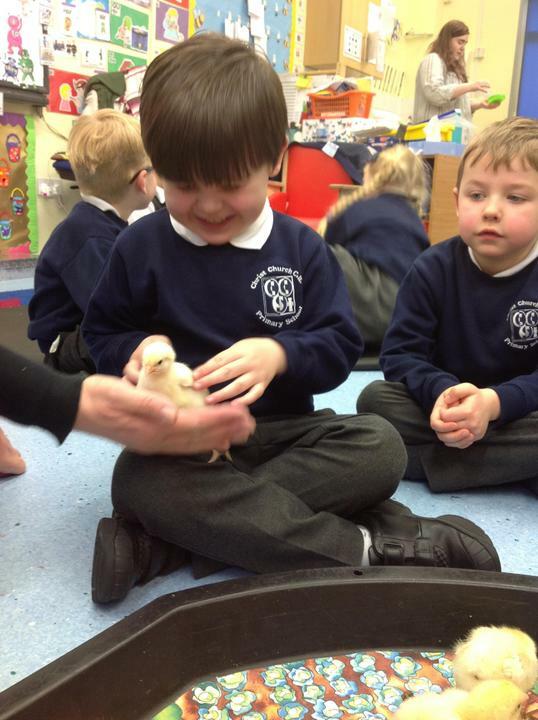 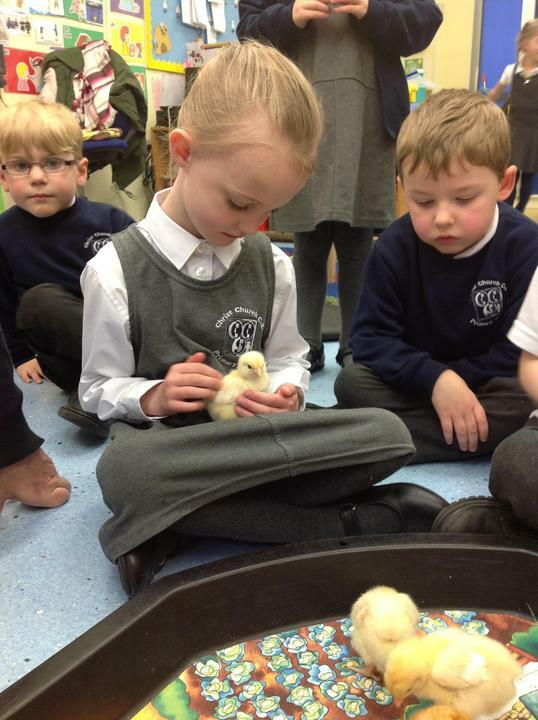 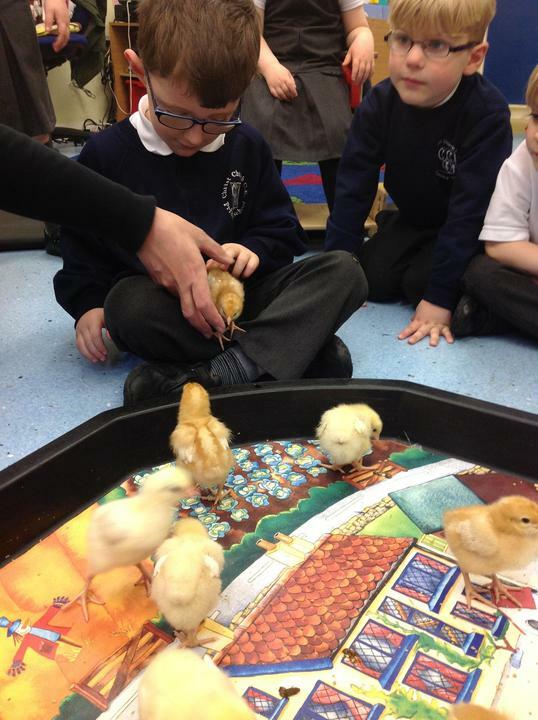 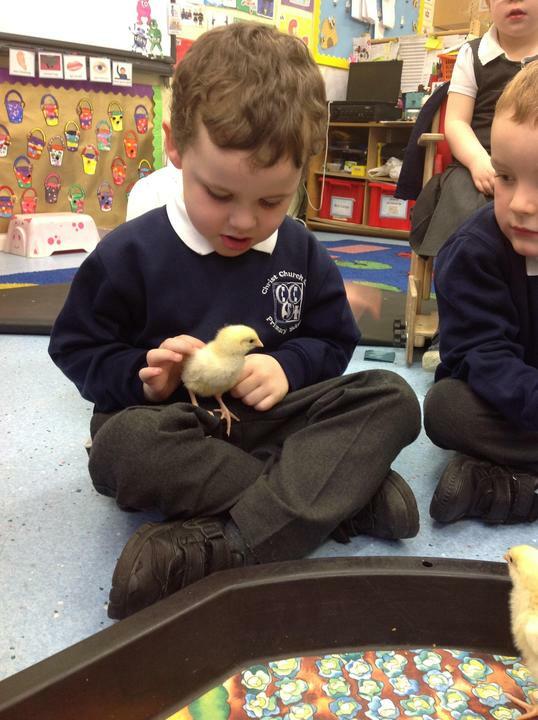 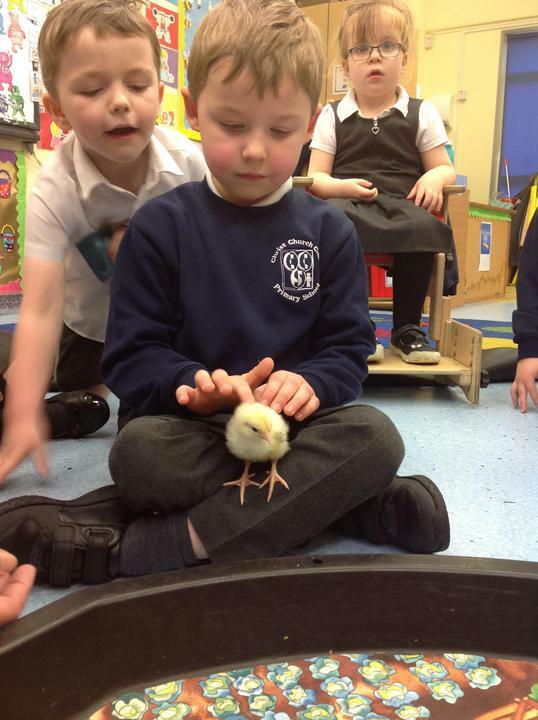 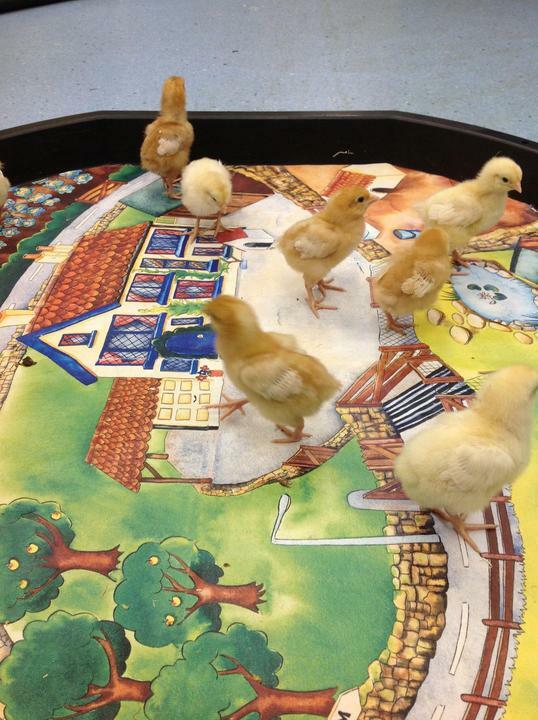 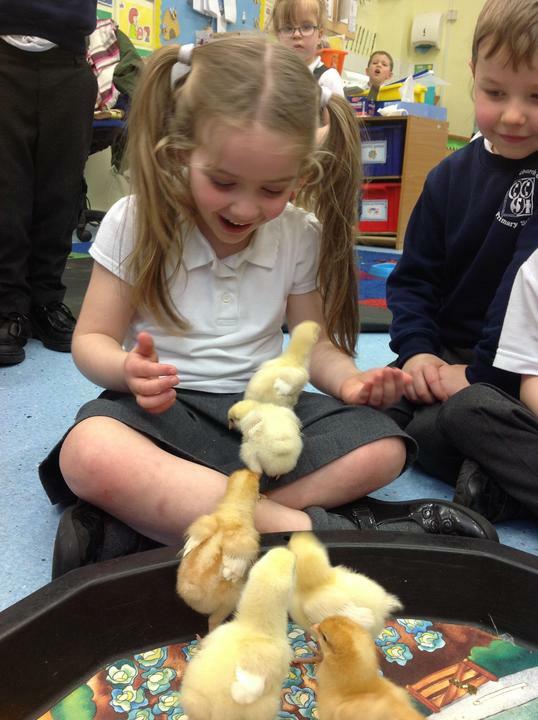 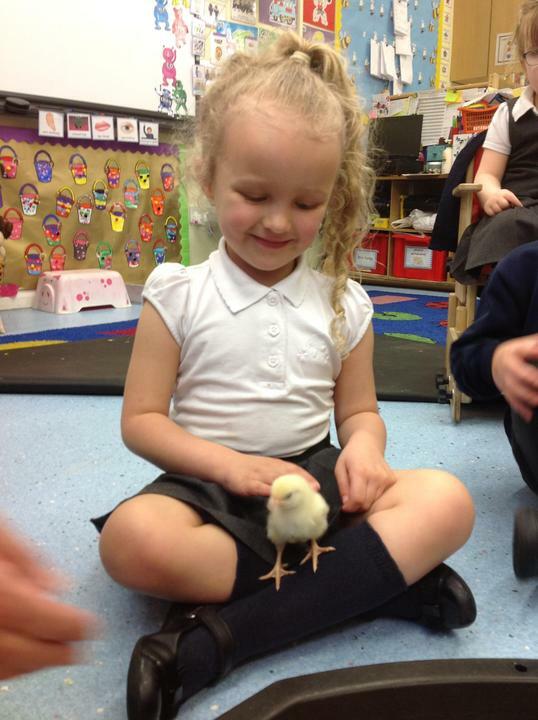 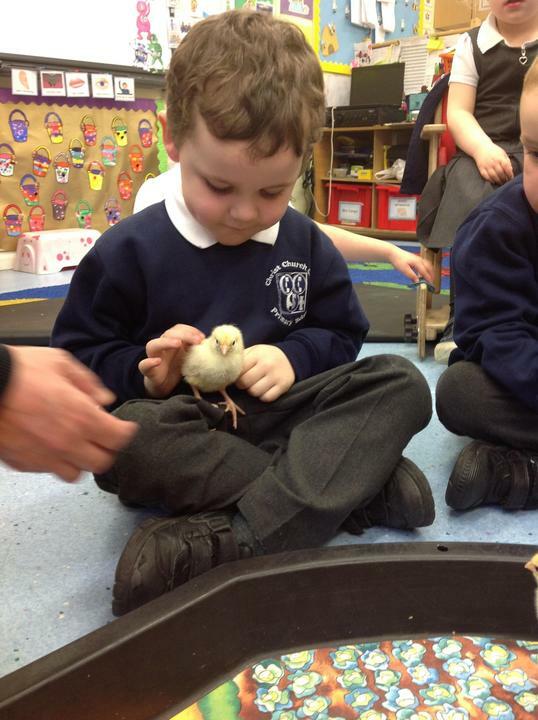 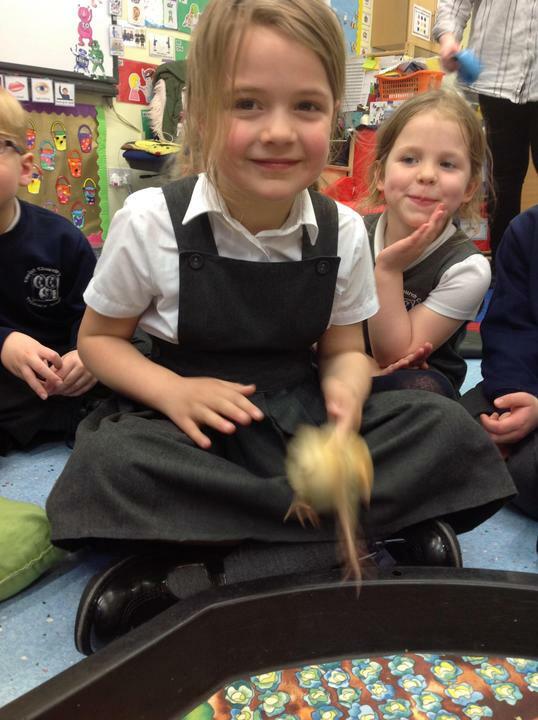 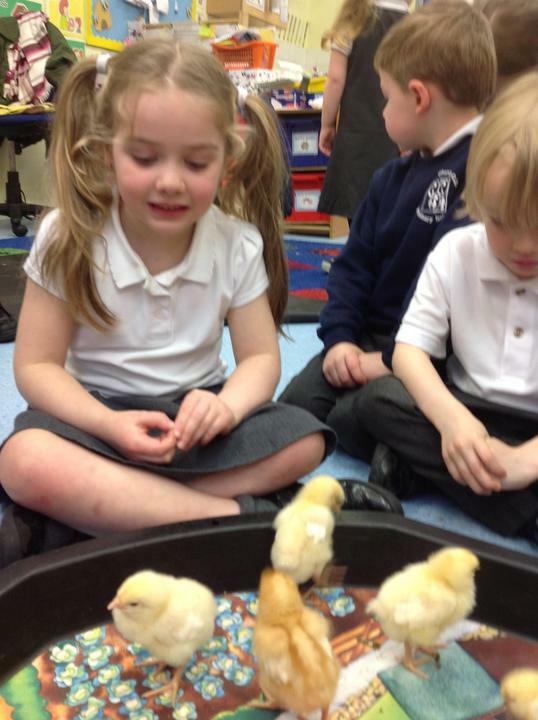 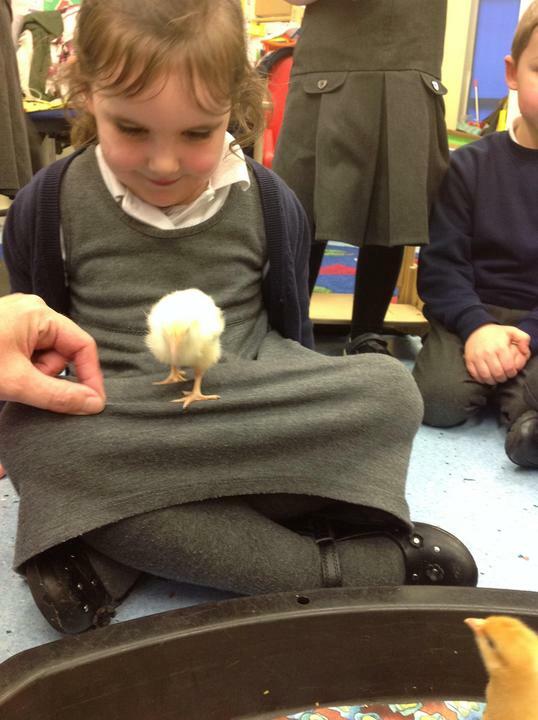 Reception Class were very excited to see how many of them hatched into chicks. 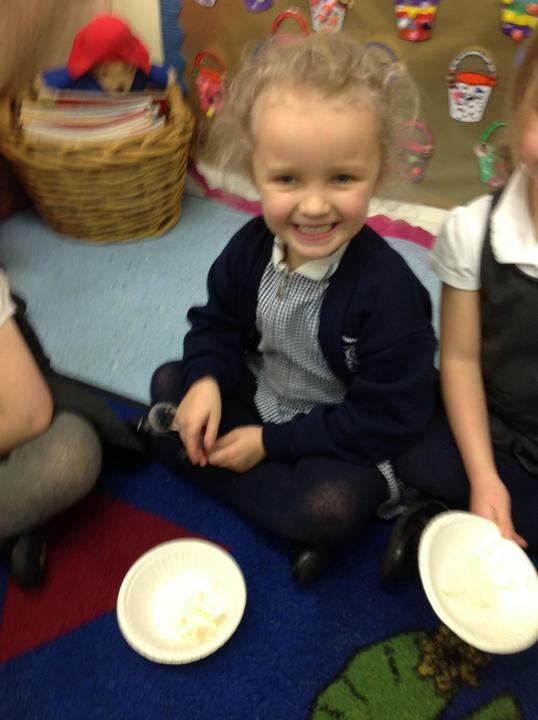 Welcome back Reception! 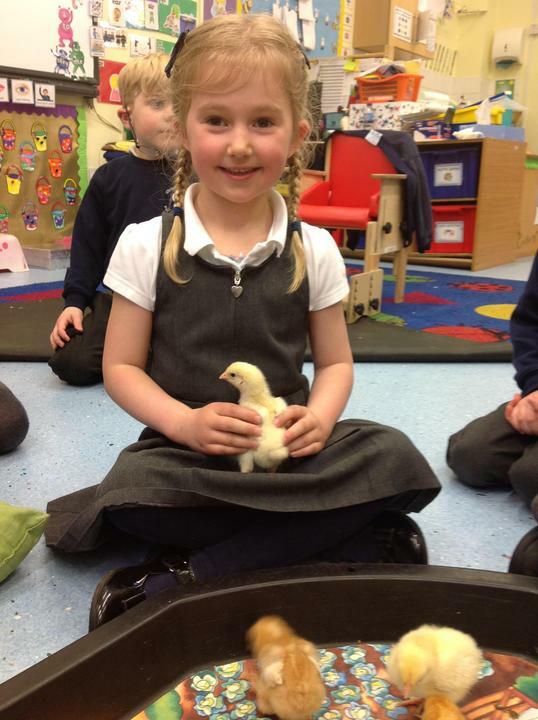 I hope that you have all had a lovely Easter. 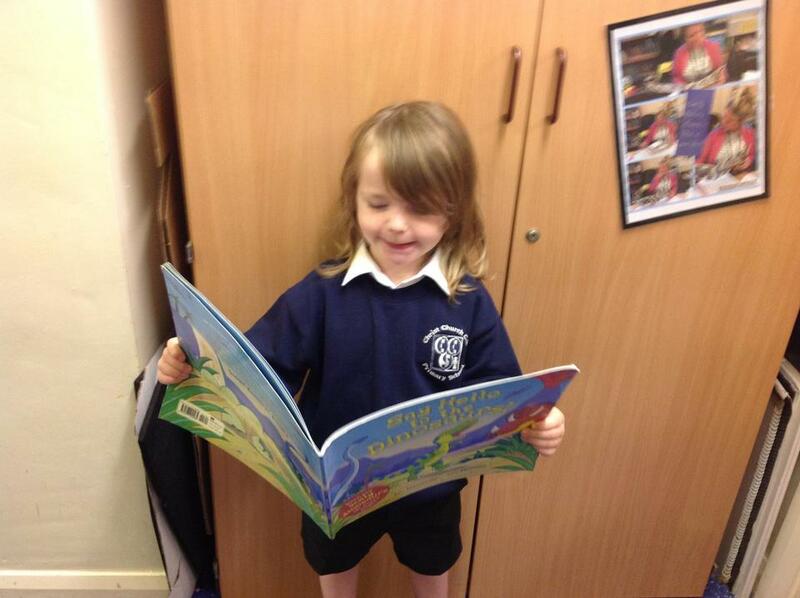 We have lots of exciting learning planned for Summer term. 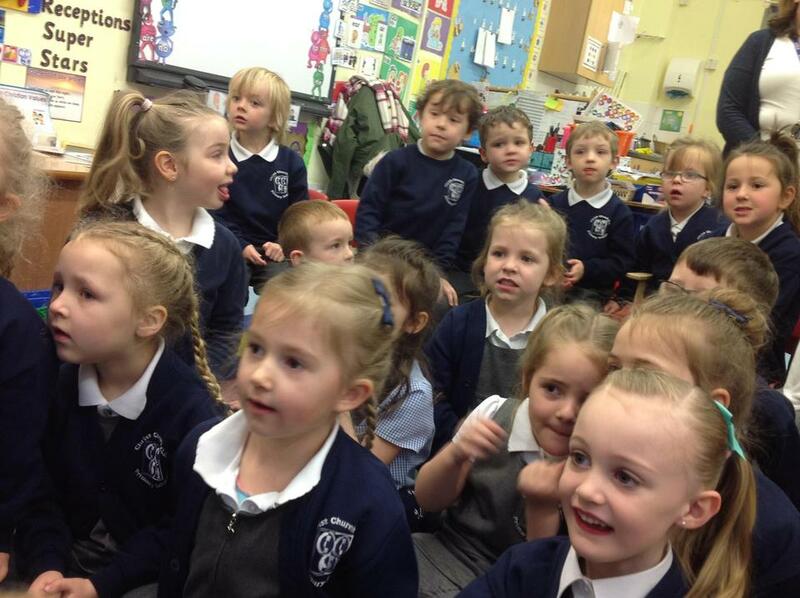 Reception Class have learnt all of their phase 2 and phase 3 phonemes. 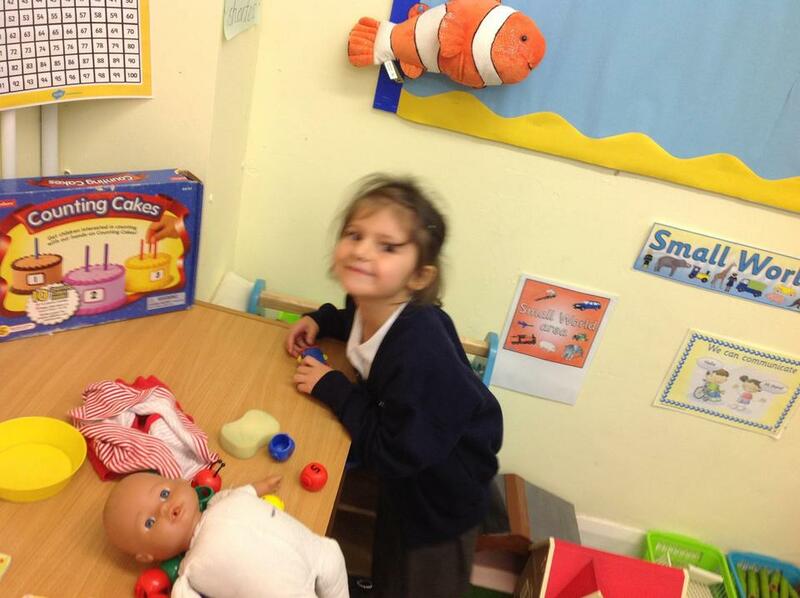 These are all on our phonic display in the classroom. 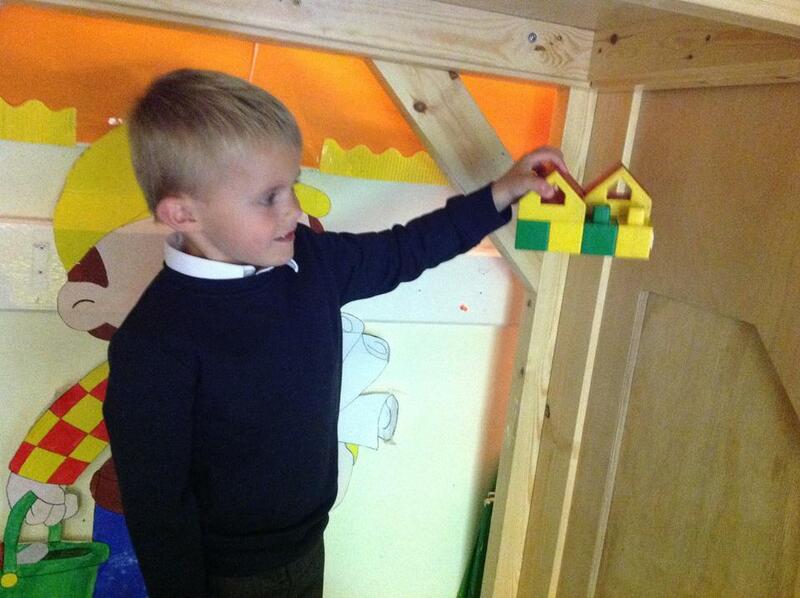 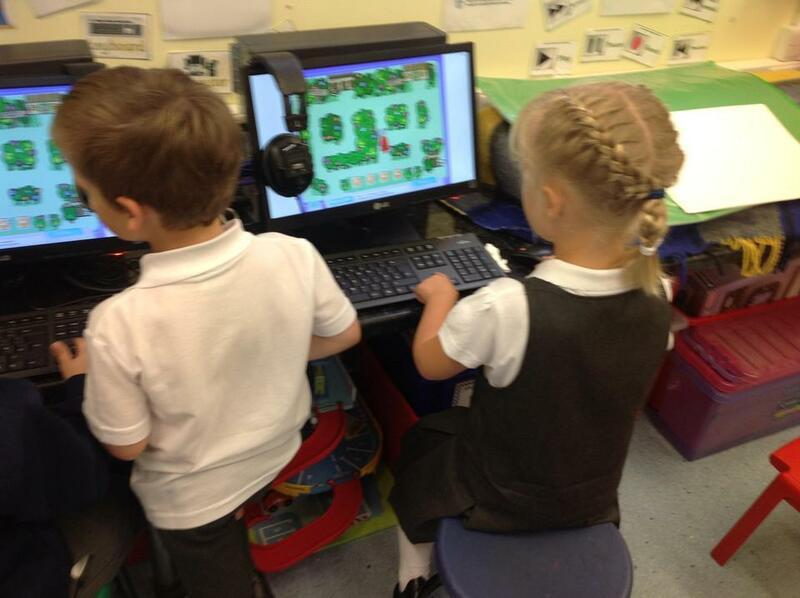 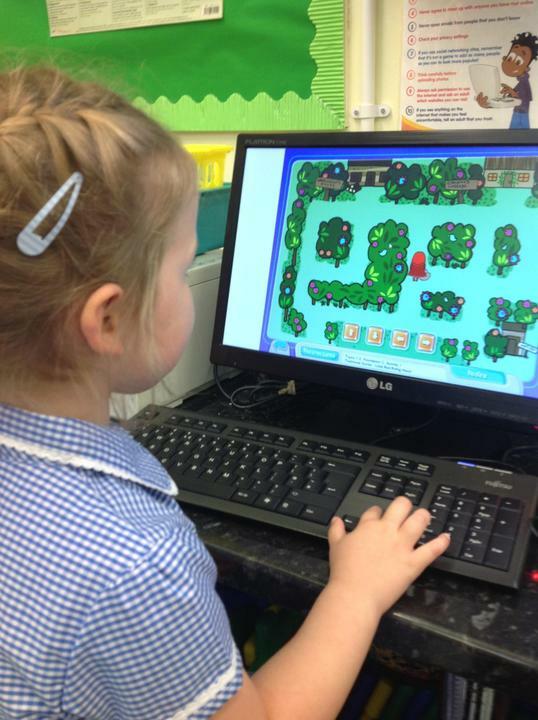 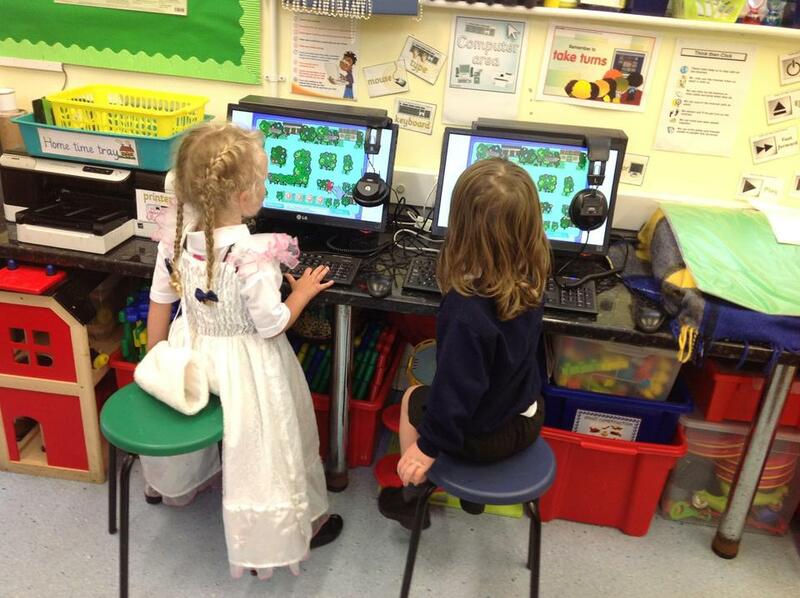 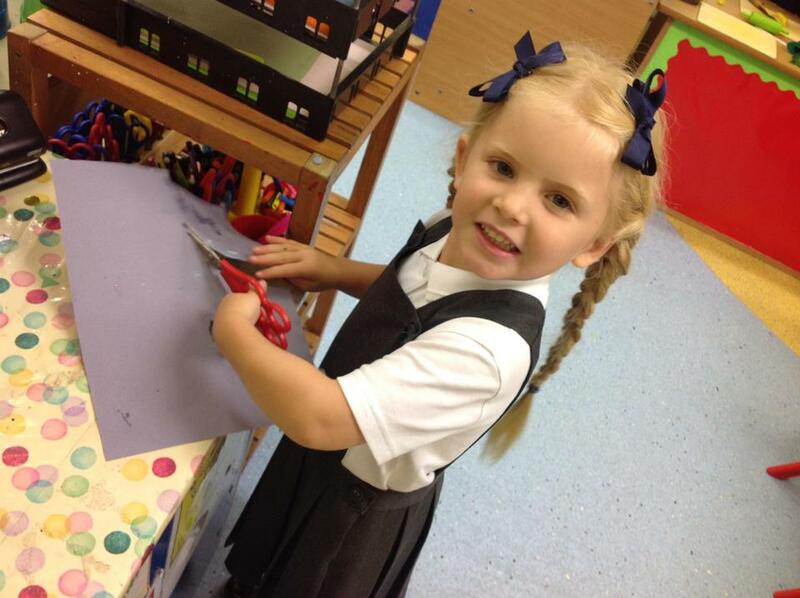 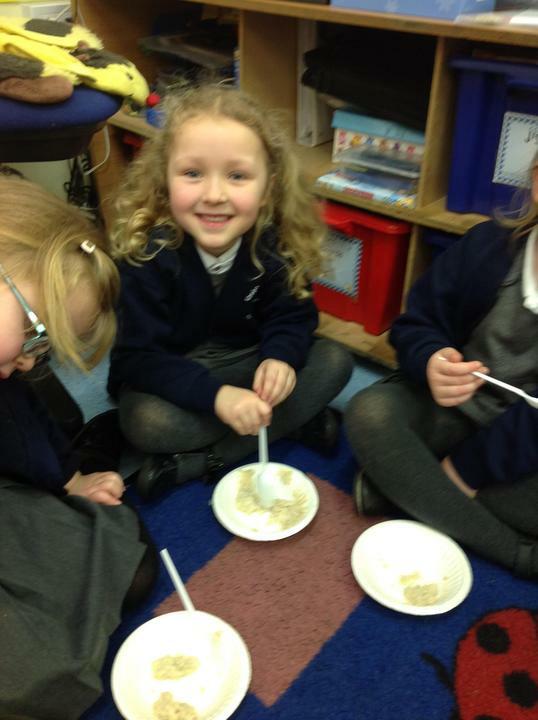 This week, Reception have been learning about 'Goldilocks and the Three Bears'. 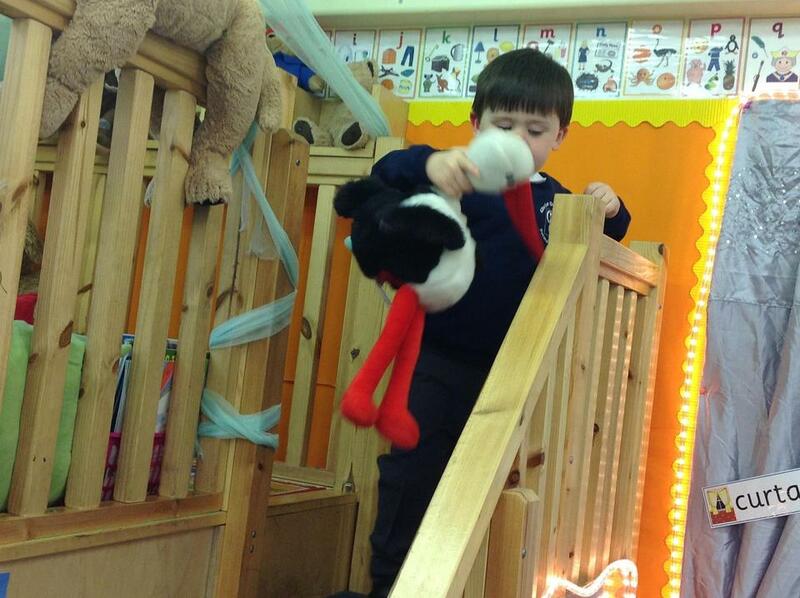 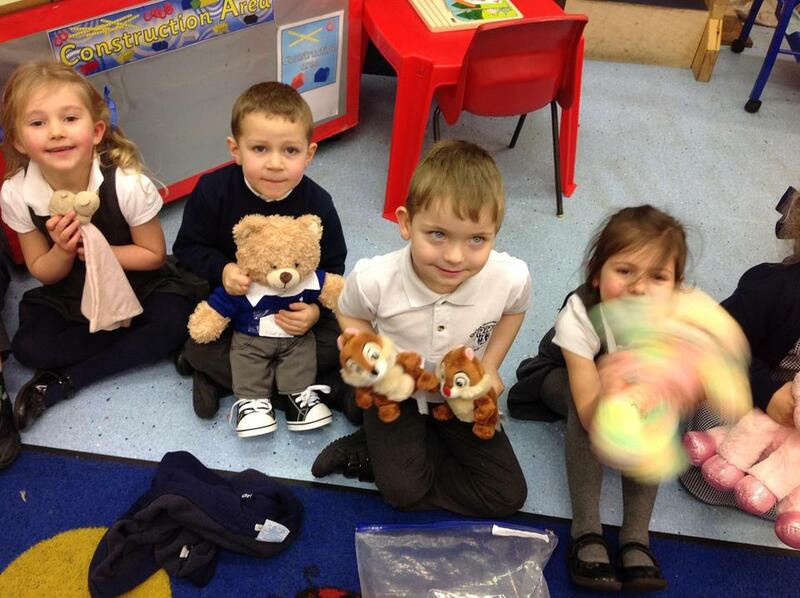 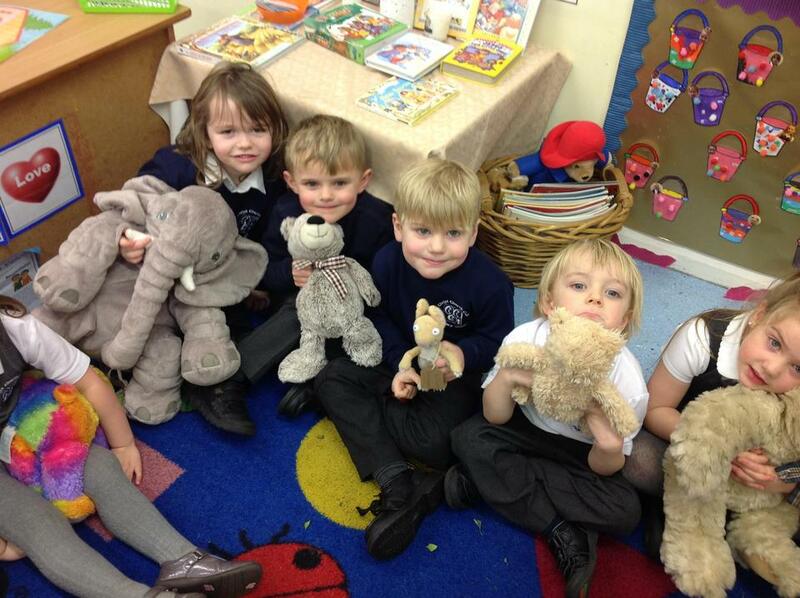 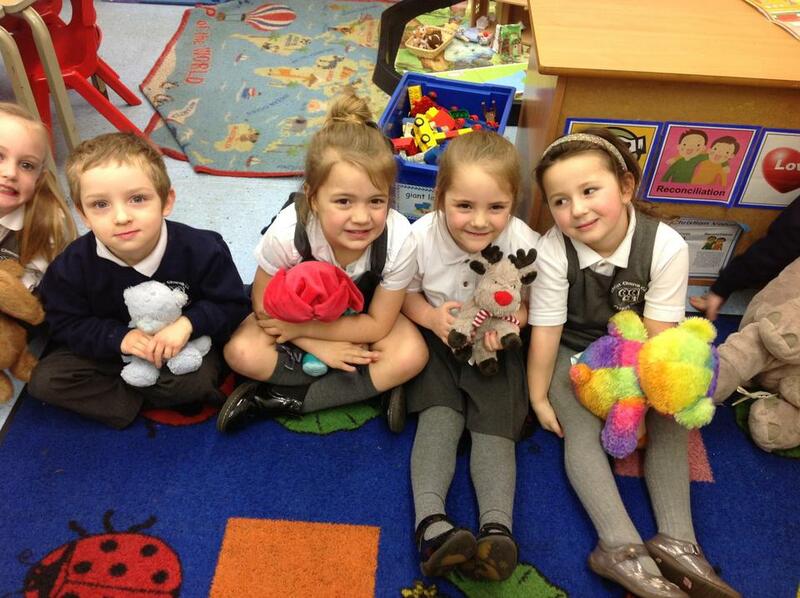 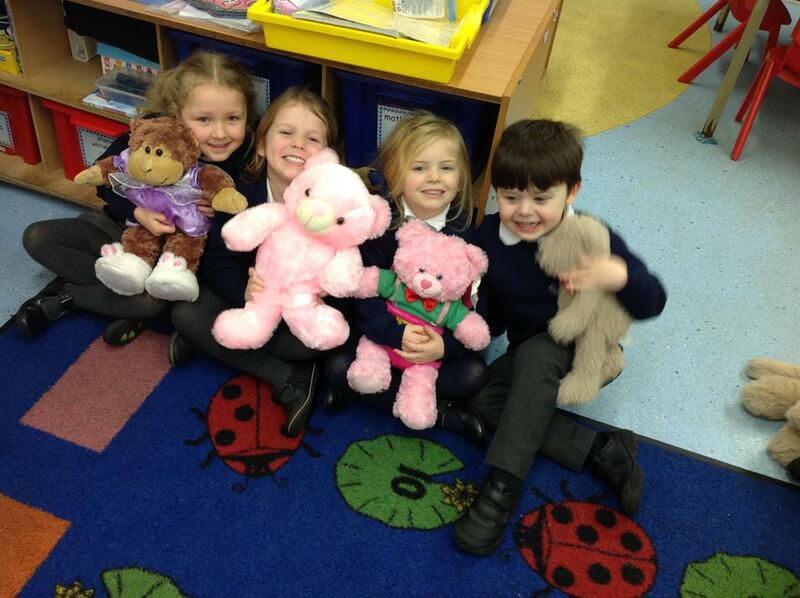 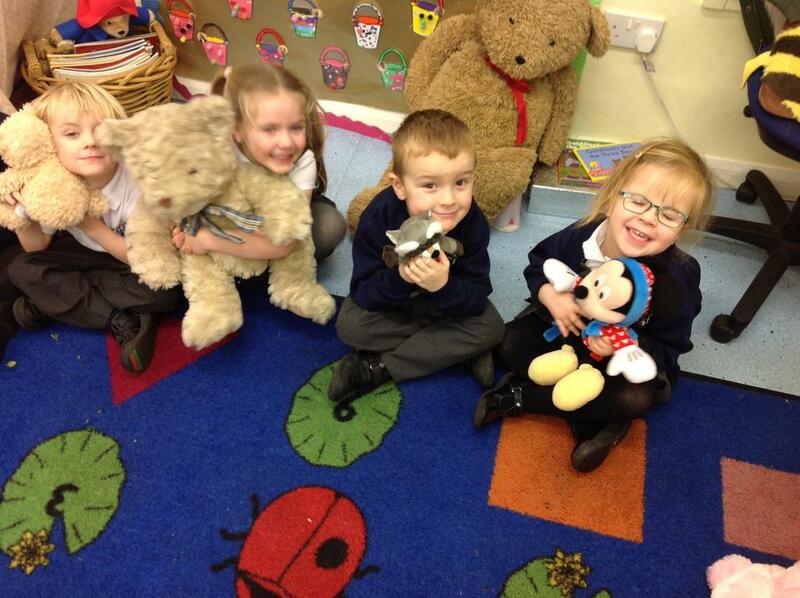 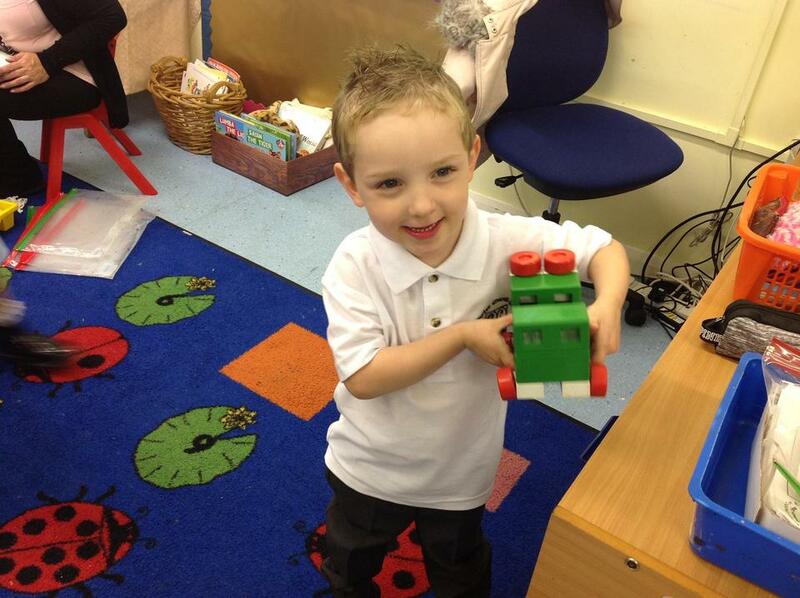 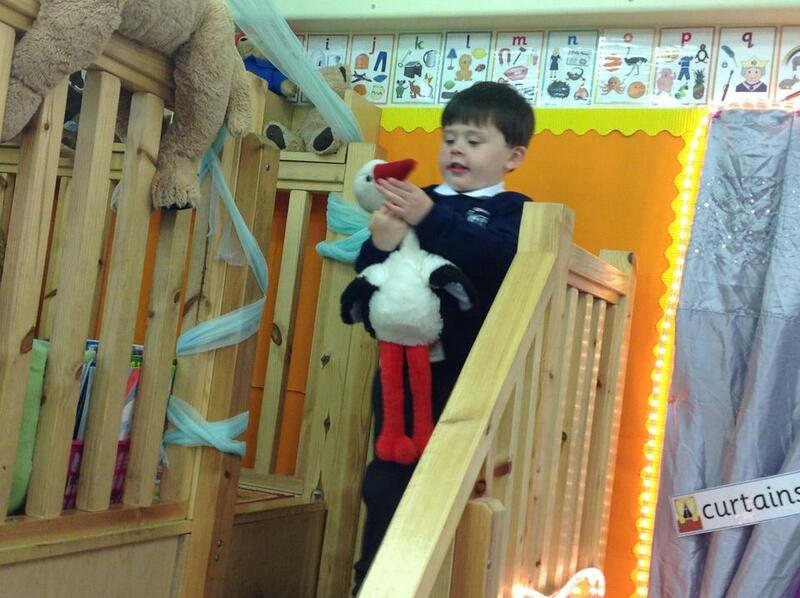 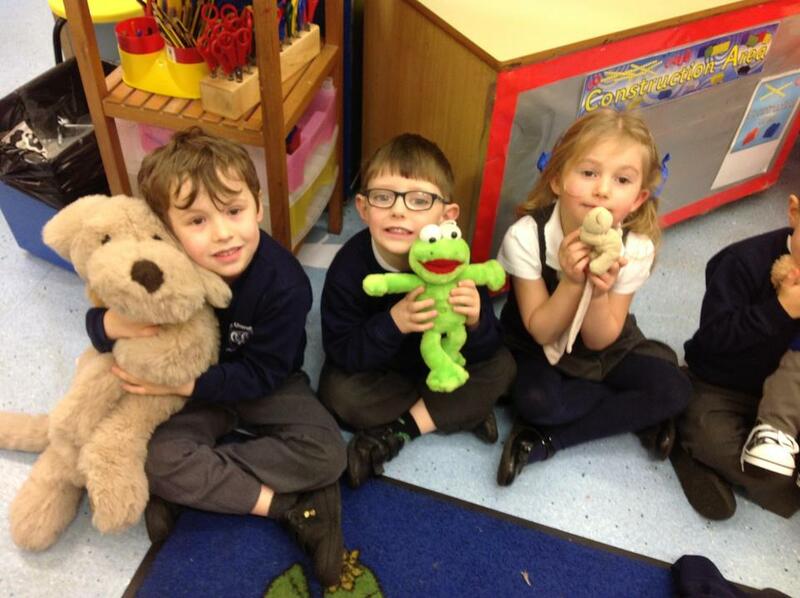 On Friday, Reception brought in their favourite teddy bear to show to the rest of the class. 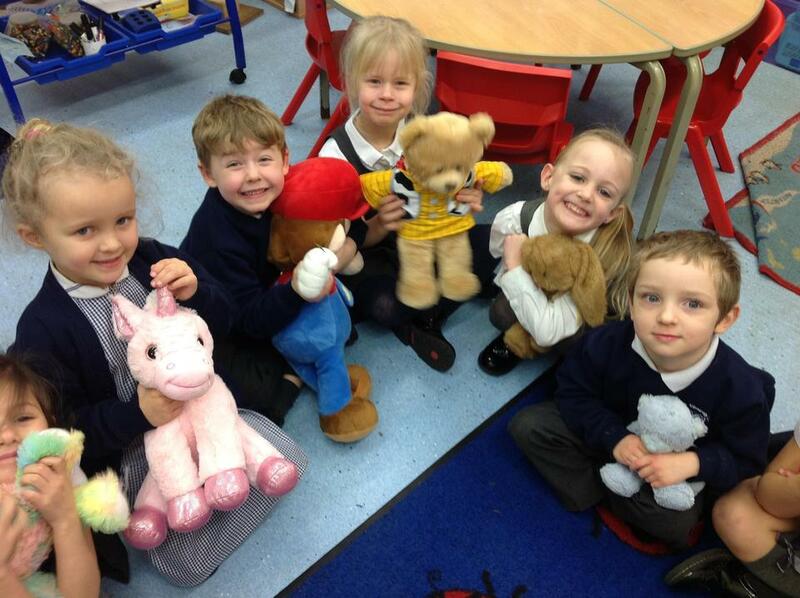 They drew a picture of their teddy bear and wrote words or a sentence to describe their teddy bear in their Literacy books. 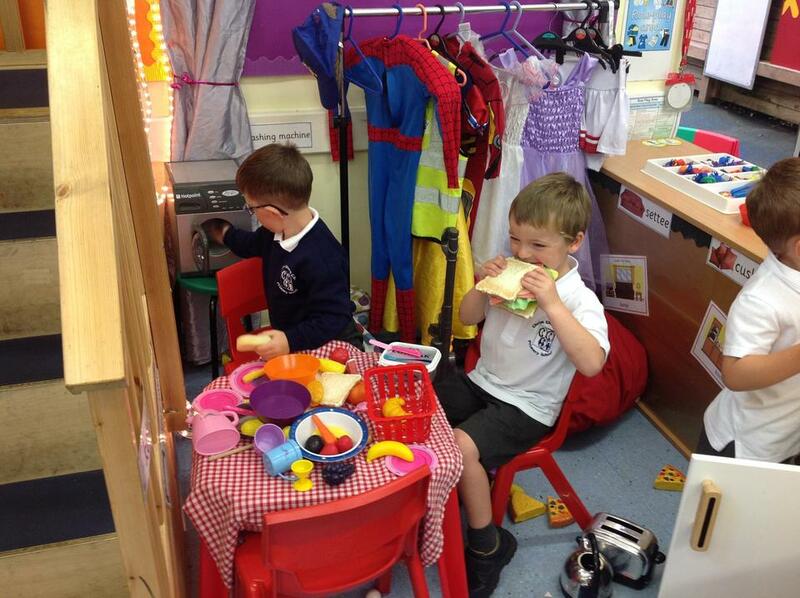 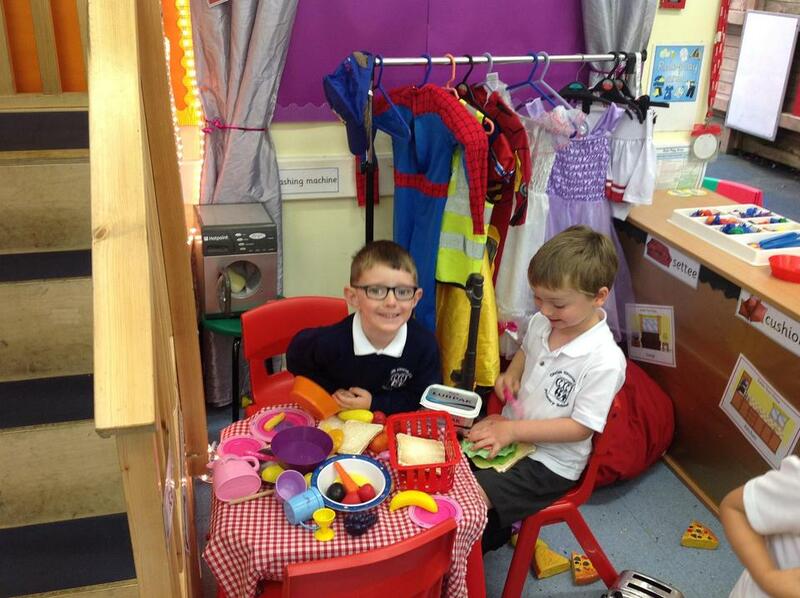 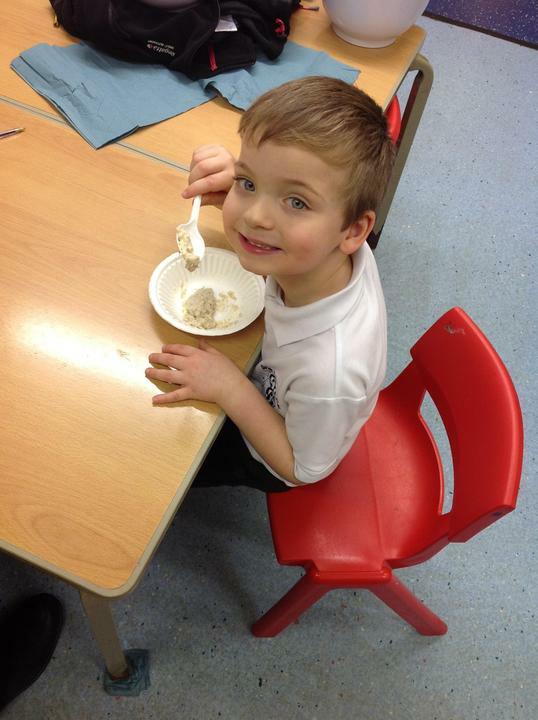 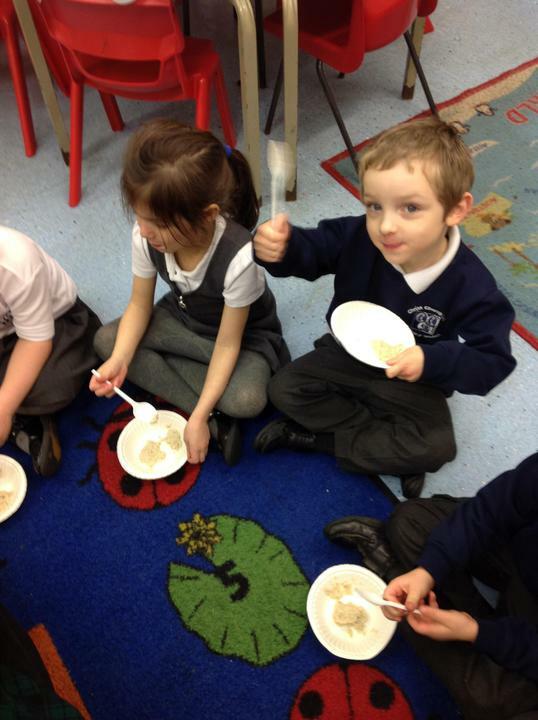 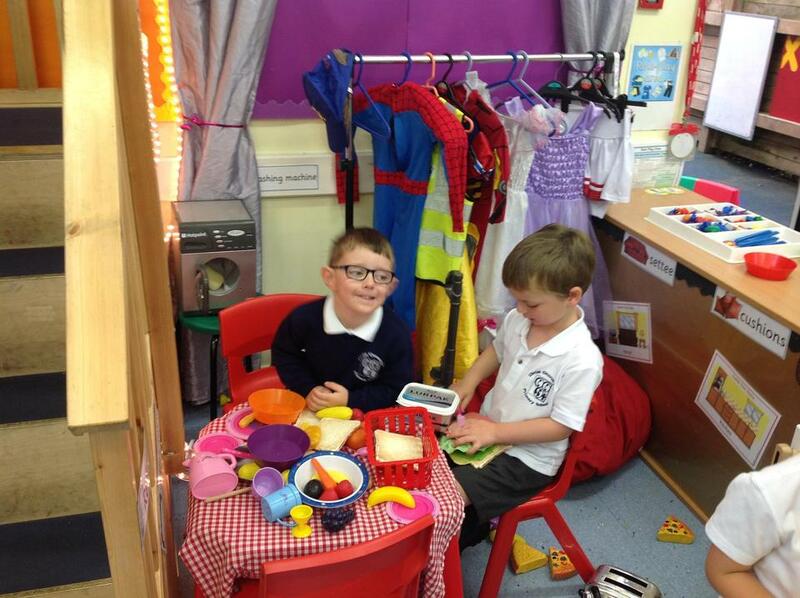 Here are some photographs of Reception Class tasting porridge. 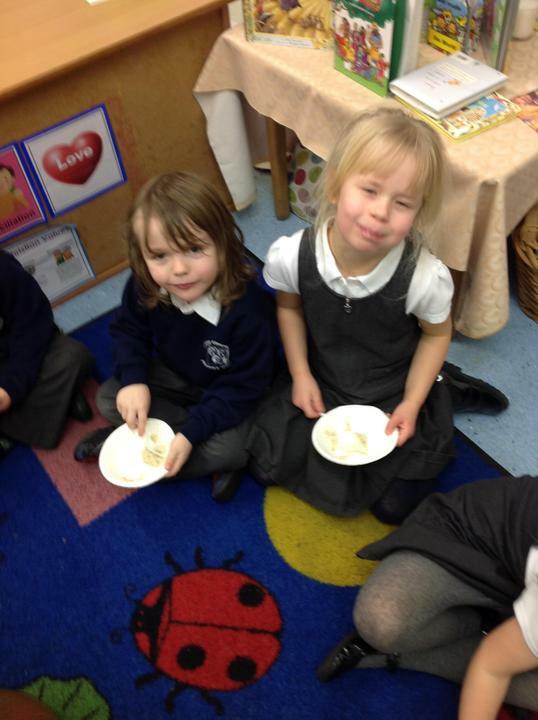 Happy New Year Reception Class! 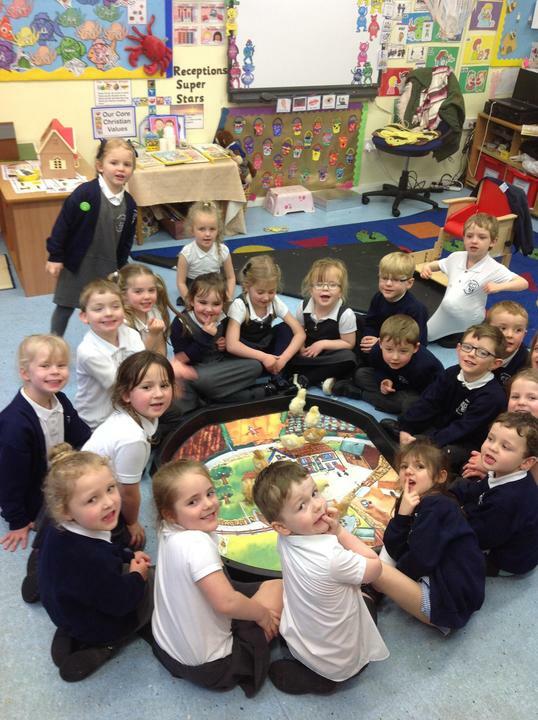 I hope that you have had a lovely Christmas and a happy start to 2018. 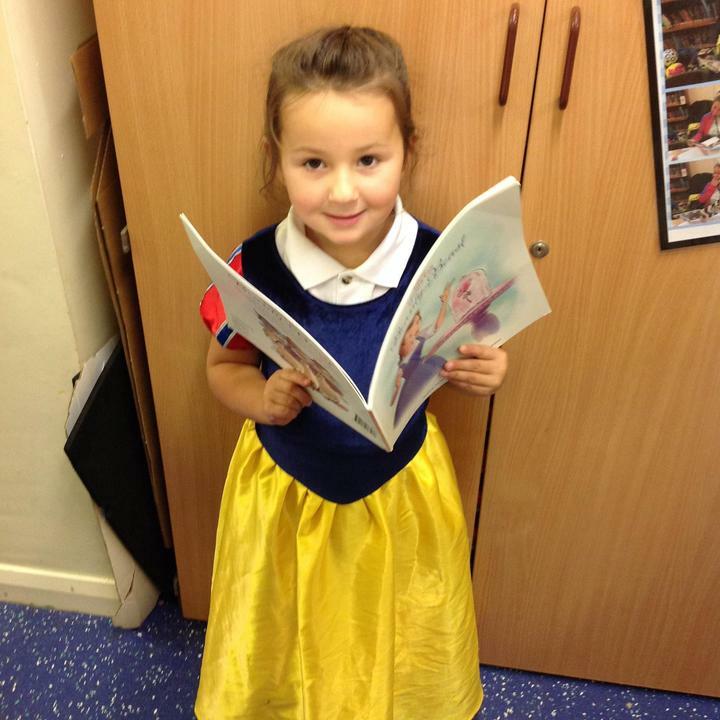 This half term, we will be learning about traditional tales. 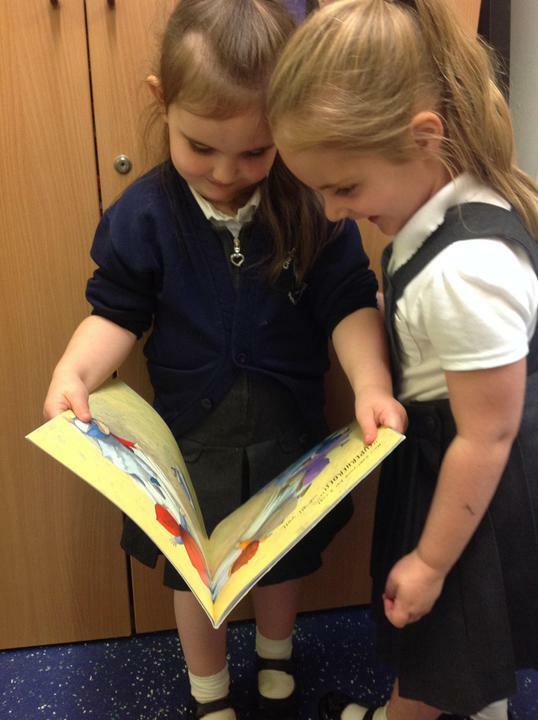 In particular, we will be looking at Goldilocks and the Three Bears, The Three Little Pigs, Little Red Riding Hood and The Gingerbread Man. 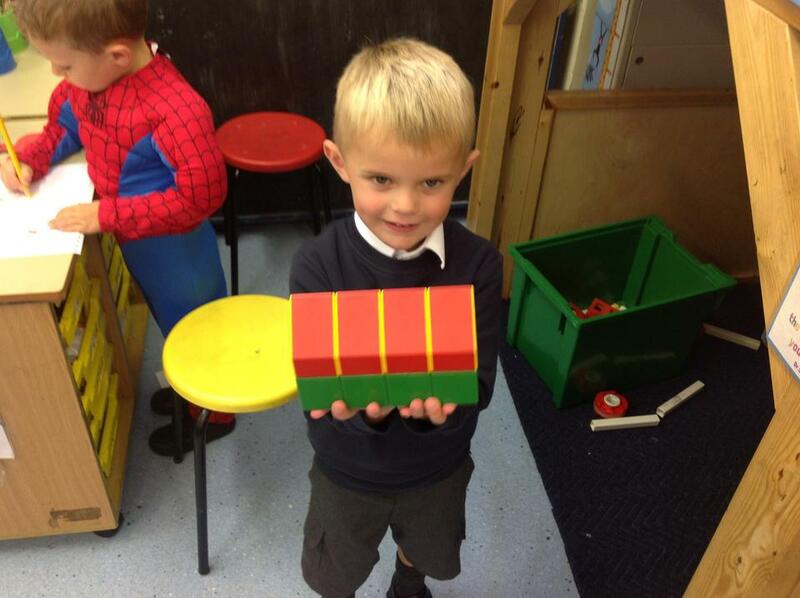 This week, we are learning about 'Diwali'. 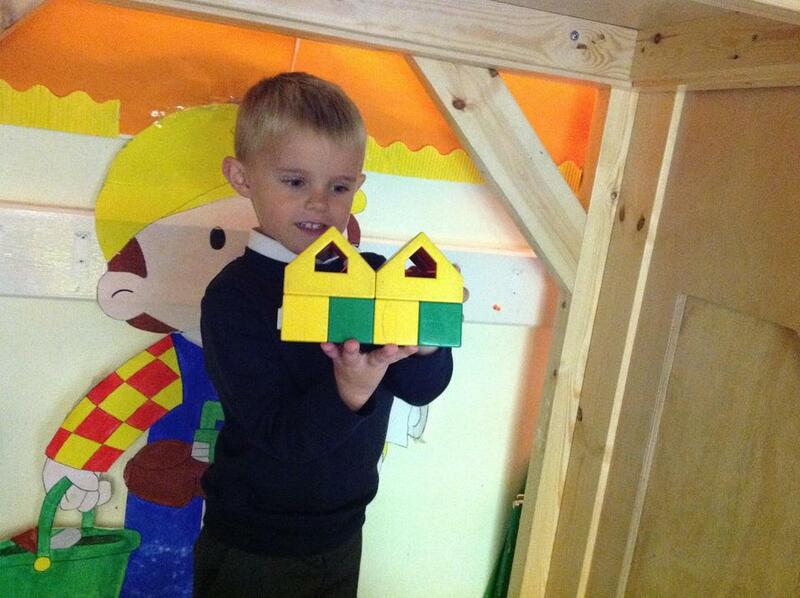 'Diwali' is a festival of lights. 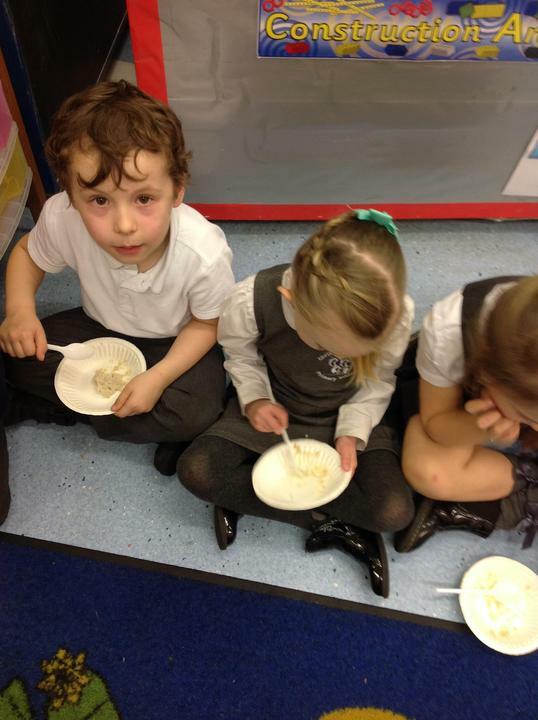 It is celebrated by Hindus every year in October or November. 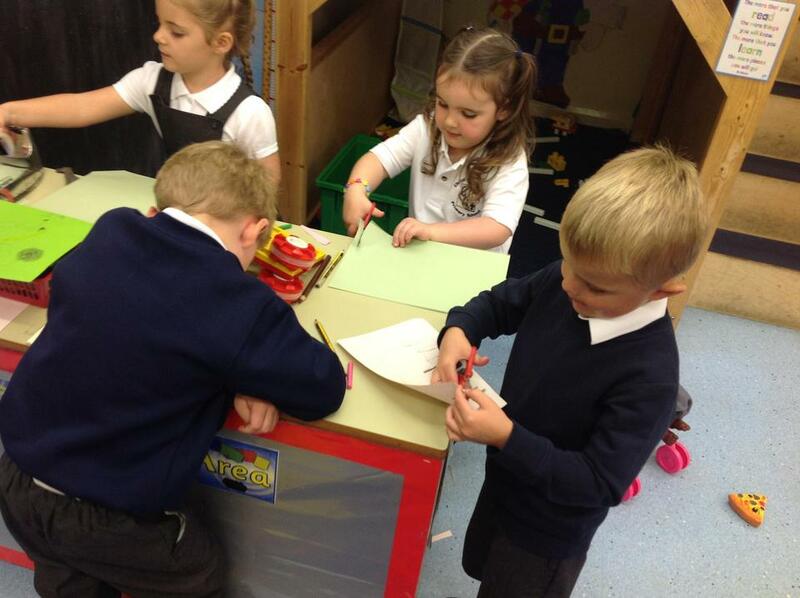 We have learnt about the Diwali story and have started to act it in out in the role- play area in small groups. 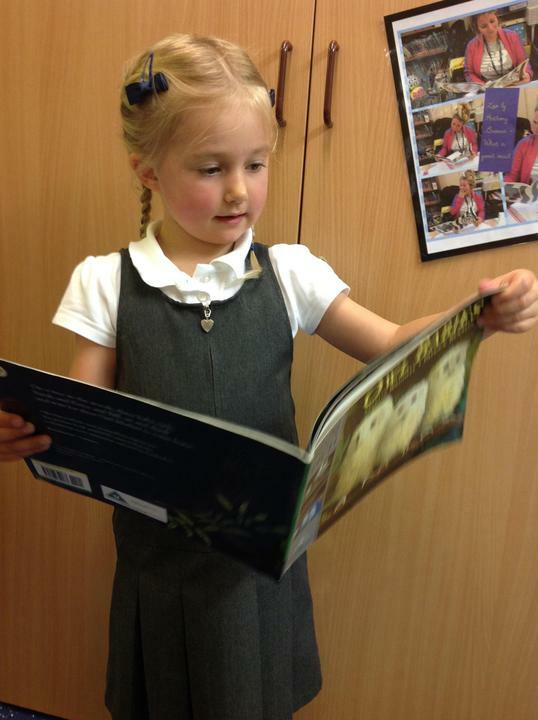 The Diwali story is about Rama ( a Prince) and Sita (his wife). 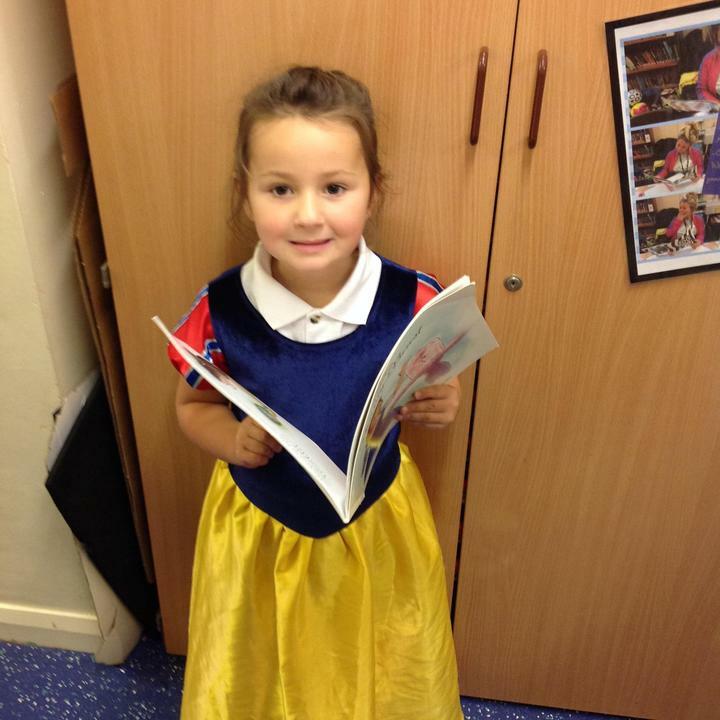 Sita is kidnapped by a terrible demon king called Ravana. 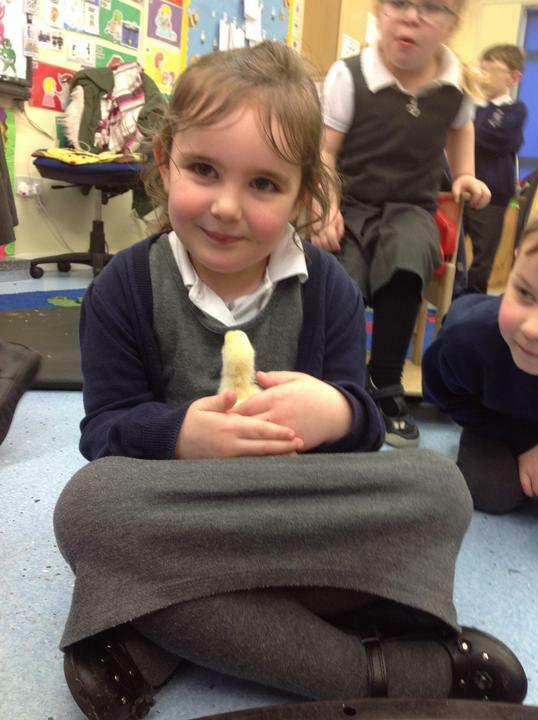 He had 10 heads and 20 arms and was feared throughout the land.Rama rescued Sita and then they were reunited again. 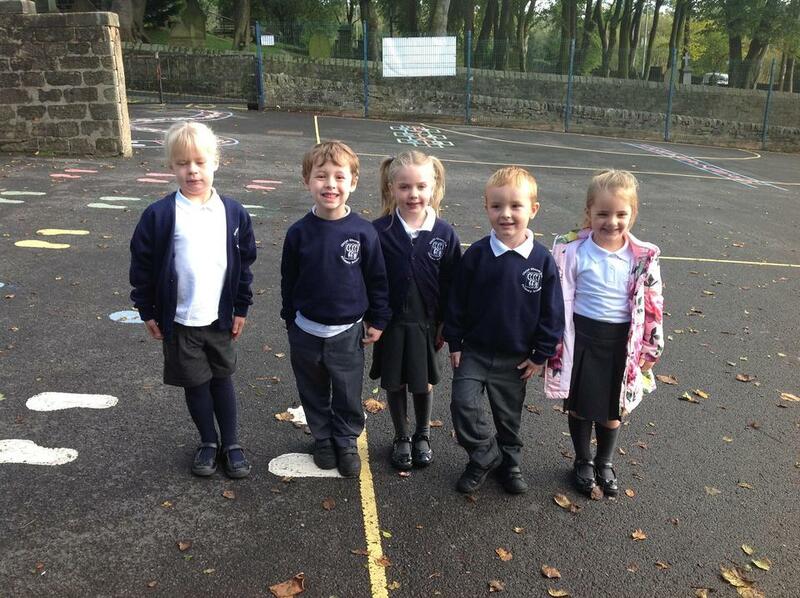 They began their long journey home. 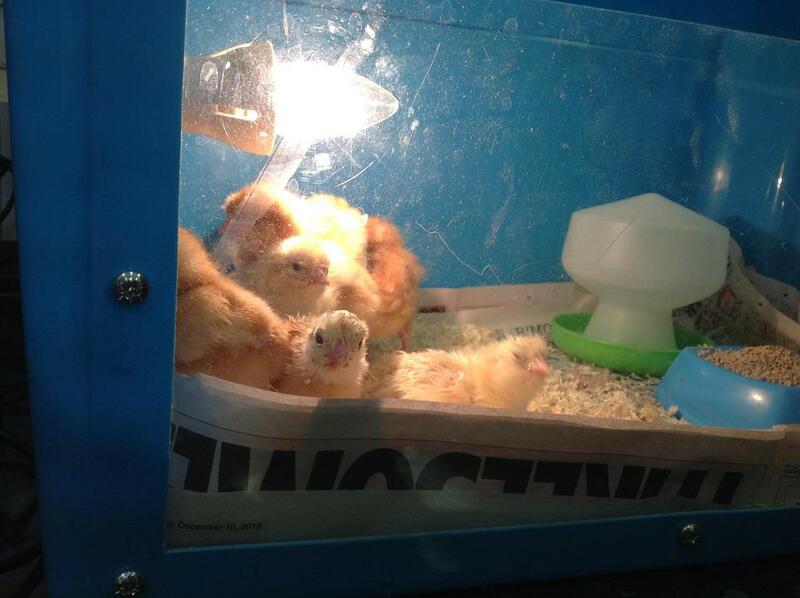 Everybody lit lamps to guide them on their way and welcome them back home. 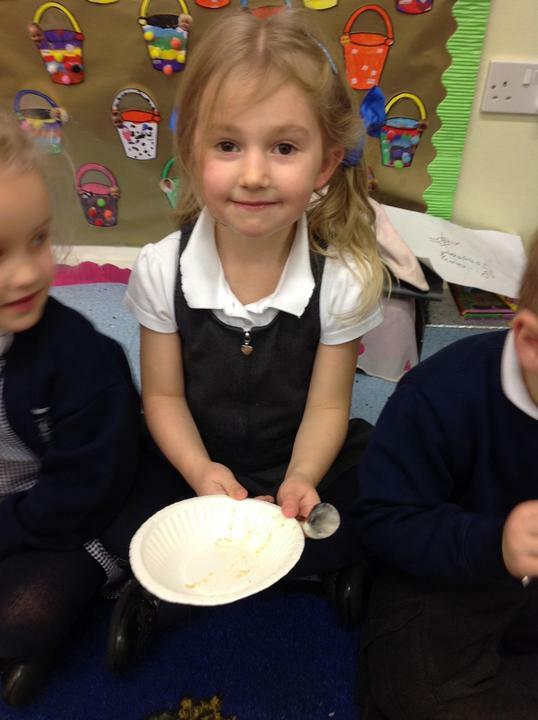 Tomorrow, we will be learning more about how Hindus celebrate Diwali. 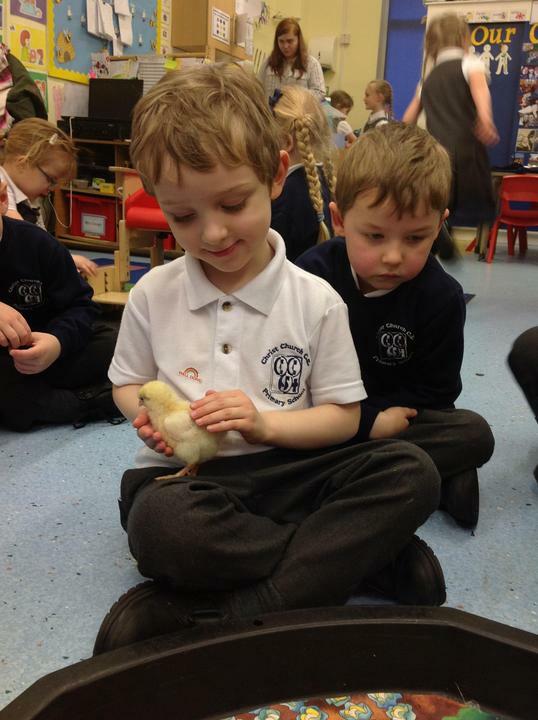 How can we show peace? 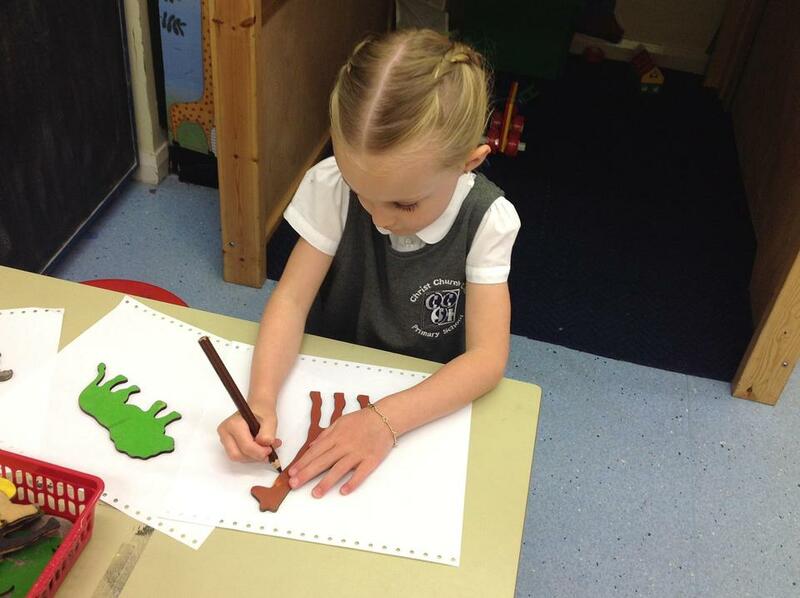 The children then worked together in small groups to draw pictures to show 'peace'. 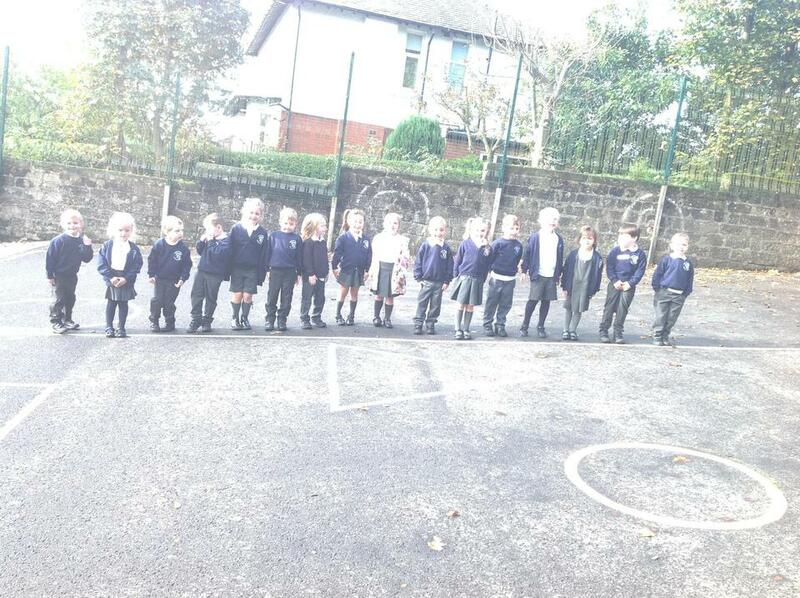 The children drew the peaceful dove from 'Noah's Ark', children and adults praying in church and at a school, people shaking hands and sharing the peace and children and adults being at peace with each other when playing or working together. 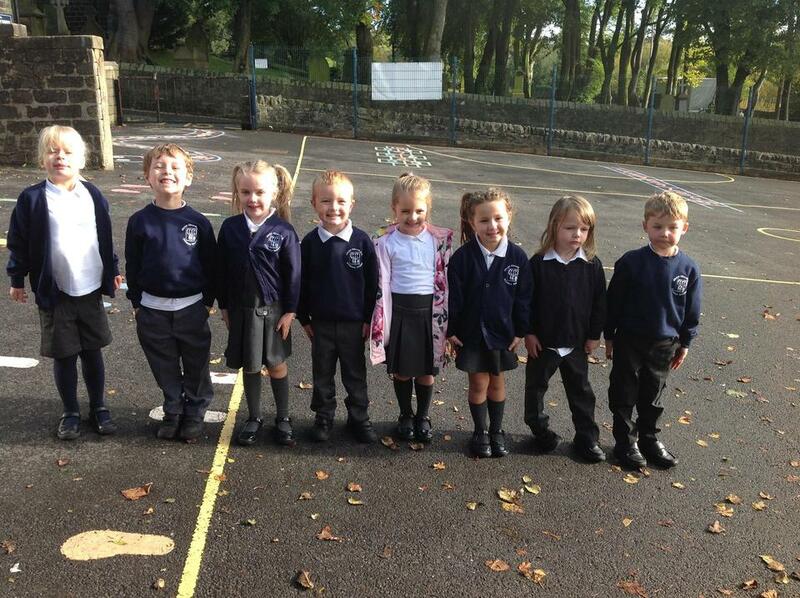 Welcome to Reception Class 2017!! 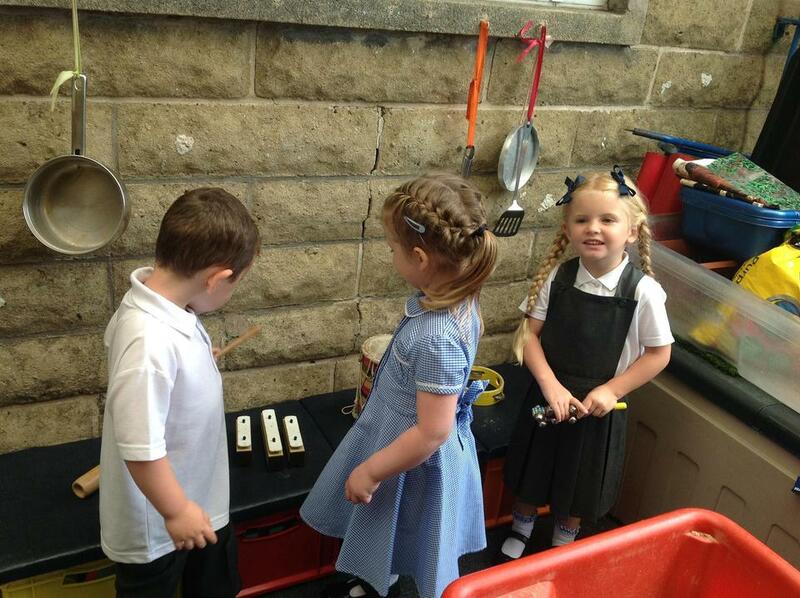 Look at all the sounds that we have learnt so far. 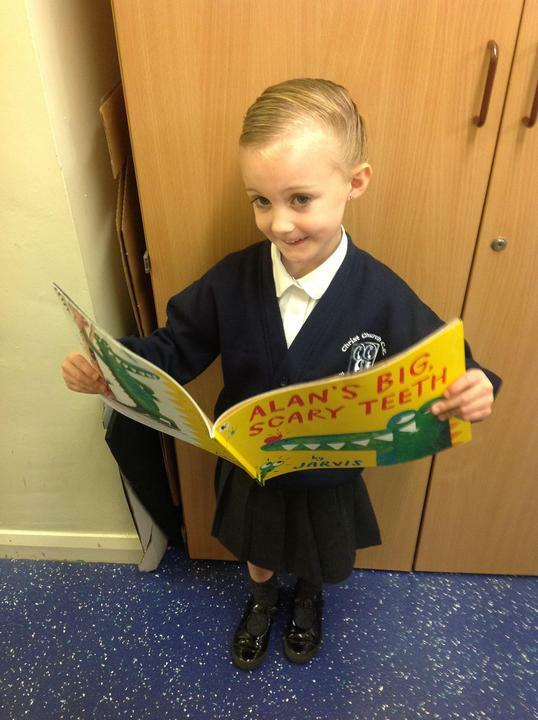 We are on our way to becoming fantastic readers!! 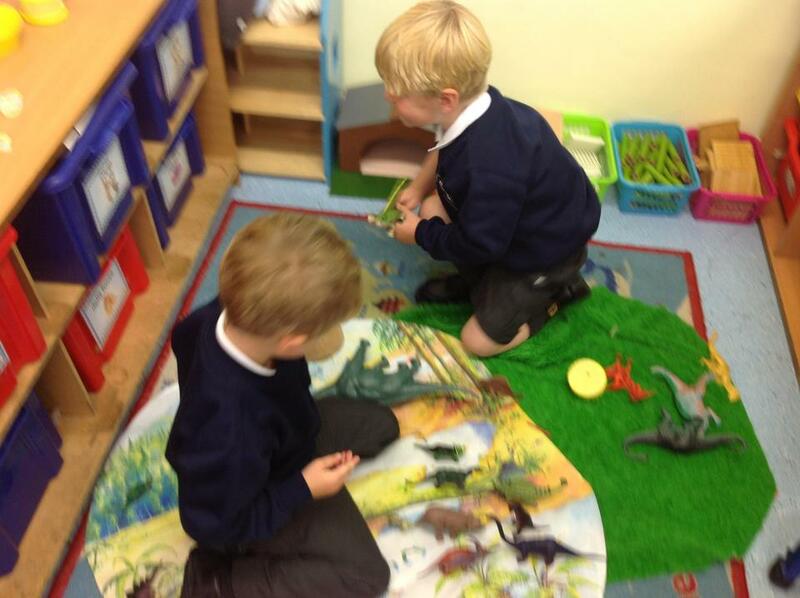 We are now working on blending the sounds together to read words. 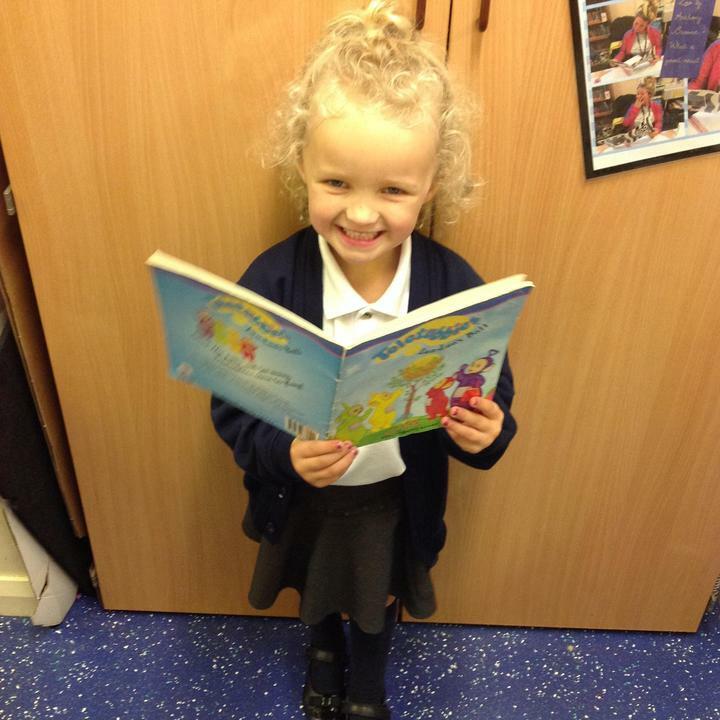 Miss Farnworth is very proud of how well we are doing with our phonics!! 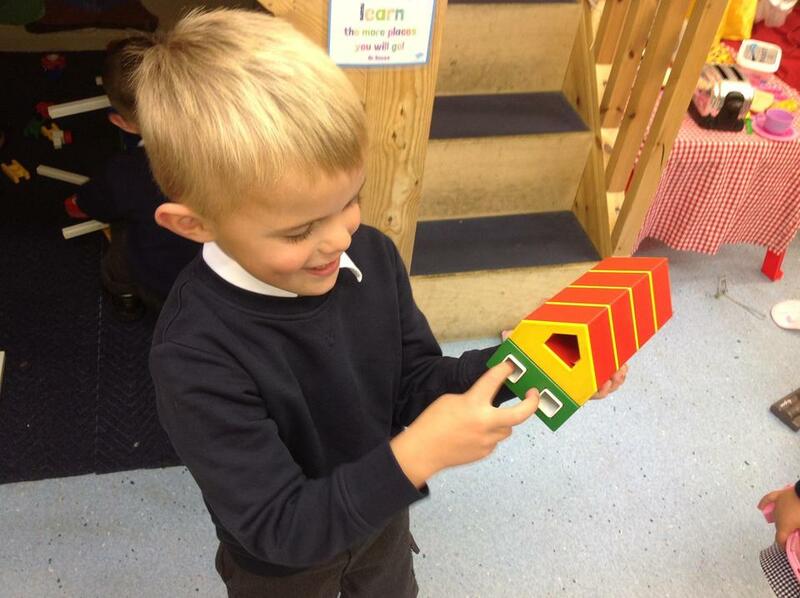 In Maths this week, we have been learning our 2D flat shapes and their properties. 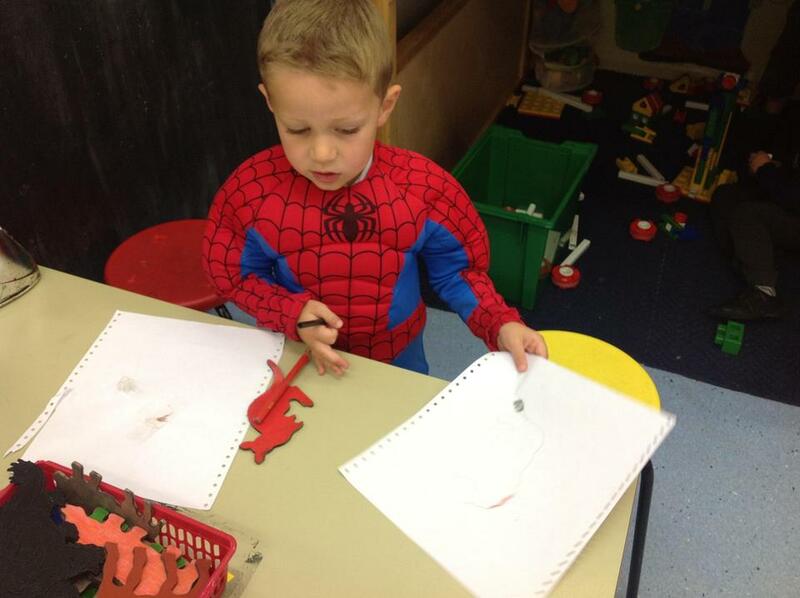 We have been making shape pictures by drawing round 2D shapes, making shape pictures using sticky shapes, printing using 2D shapes and making pictures of ourselves using tap - a - shape. 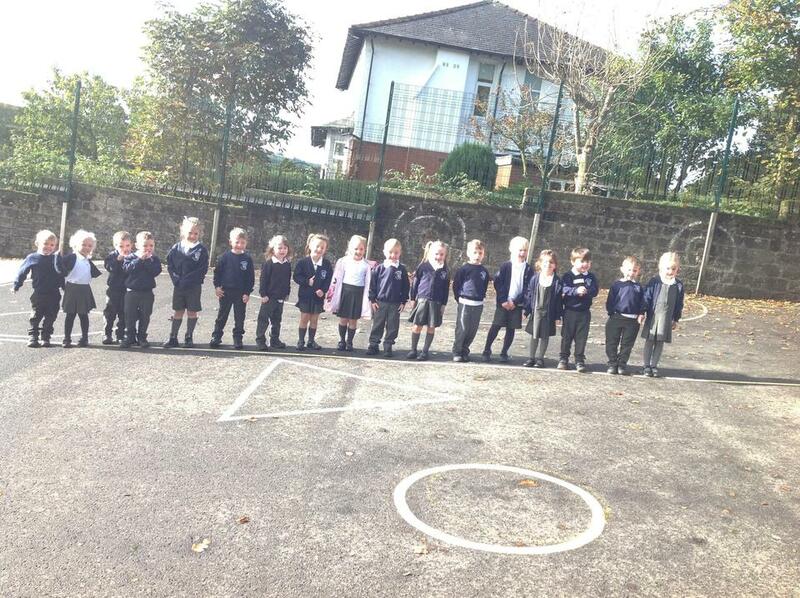 Reception have also used feely bags, played shape games and listened to shape songs to learn the different 2D shape properties. 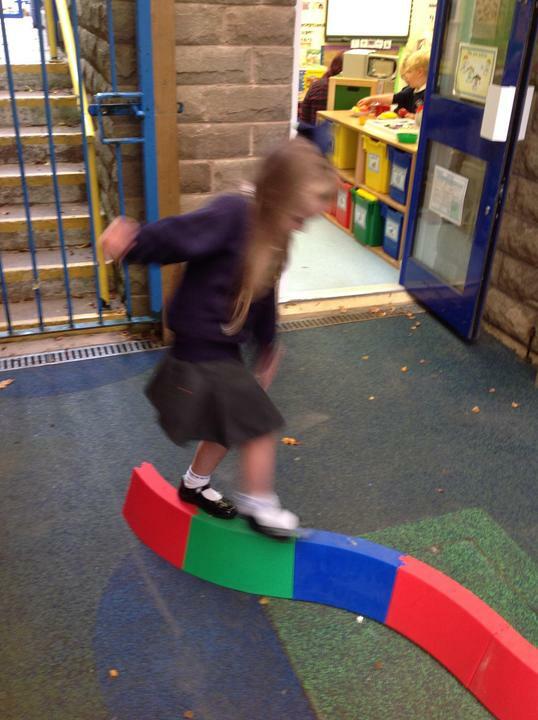 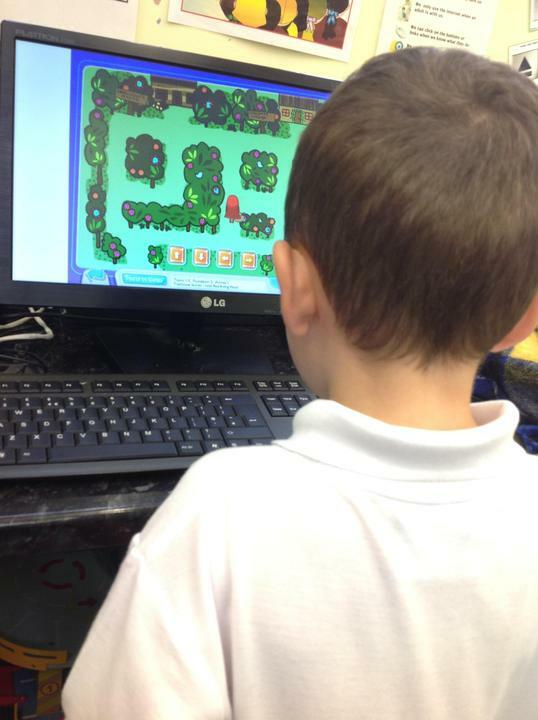 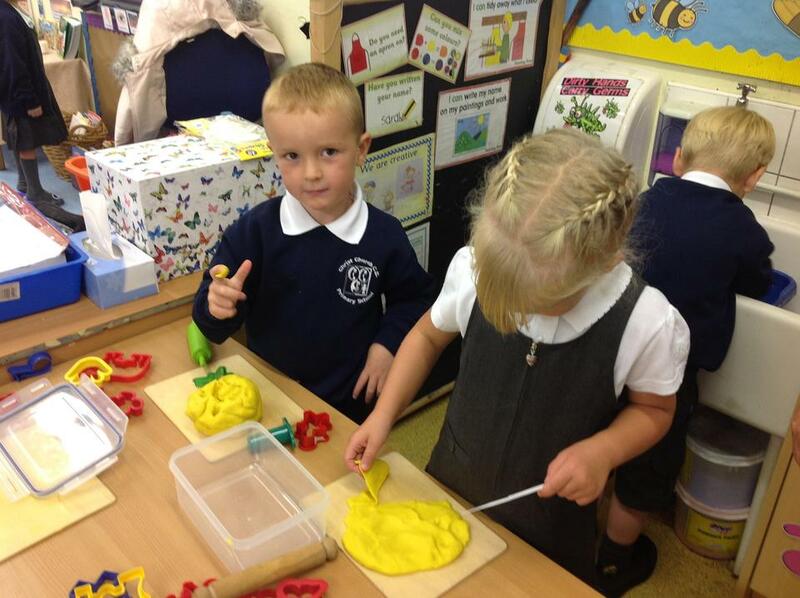 Here are some photographs of our super shape work. 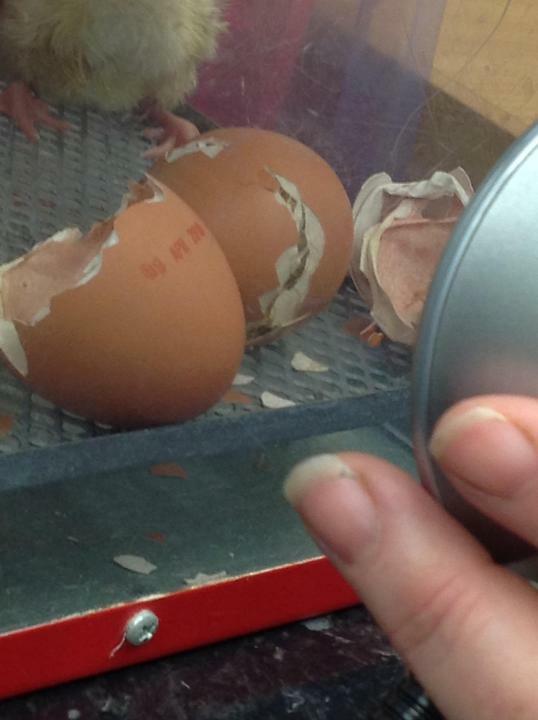 RE - I am Special. 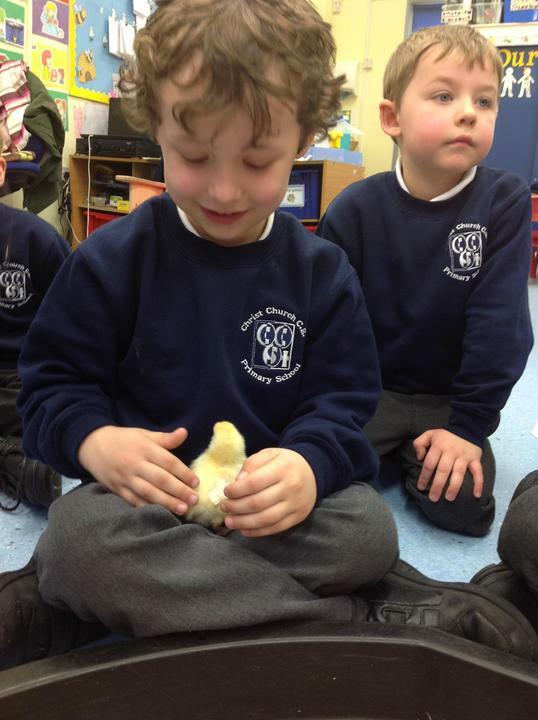 Reception have been learning that God created the world and God created each one of us. 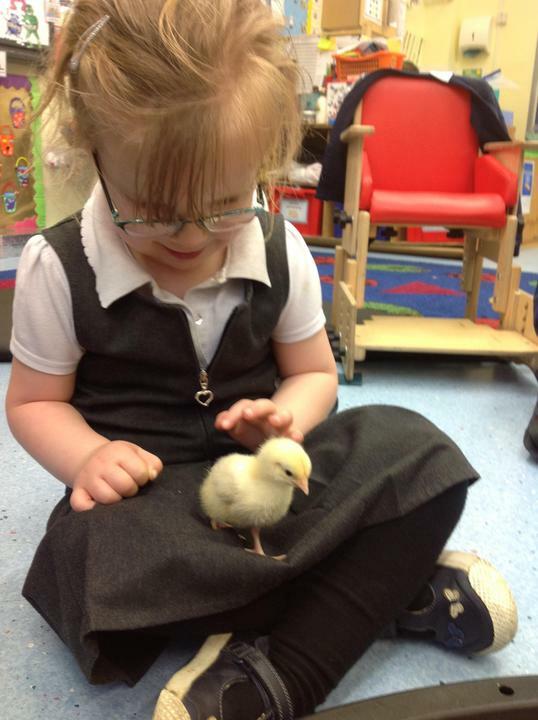 We are all Gods special children. 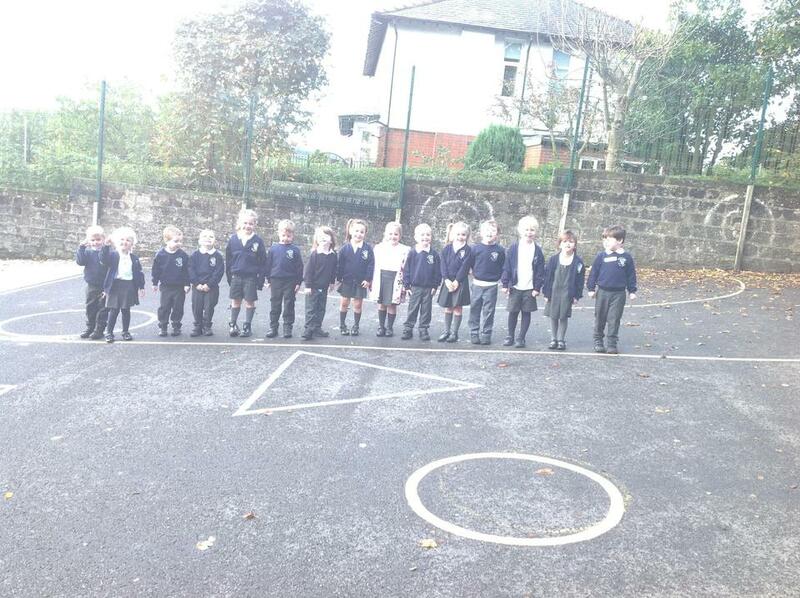 We have made some self - portraits and we talked about how God made us all the same but with some differences which make each one of us special and unique. 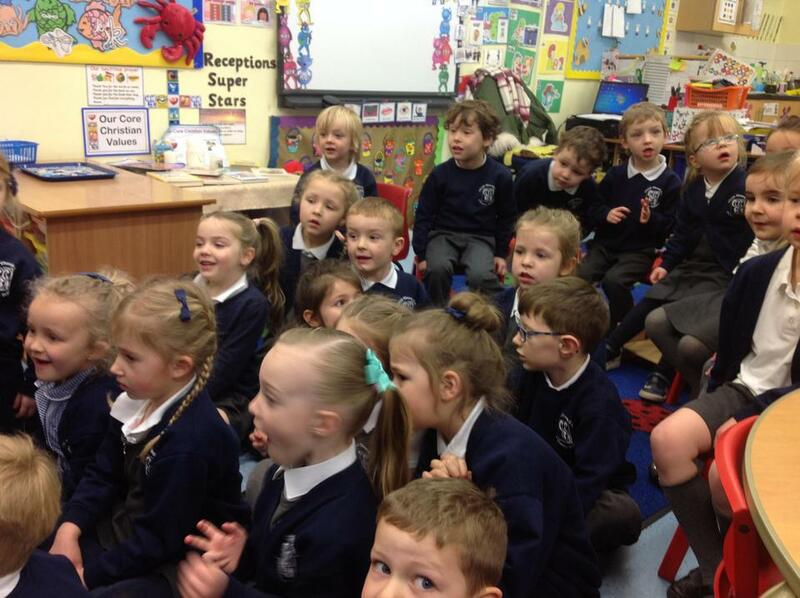 For example, some children have blue eyes, some children have green eyes and some children have brown eyes. 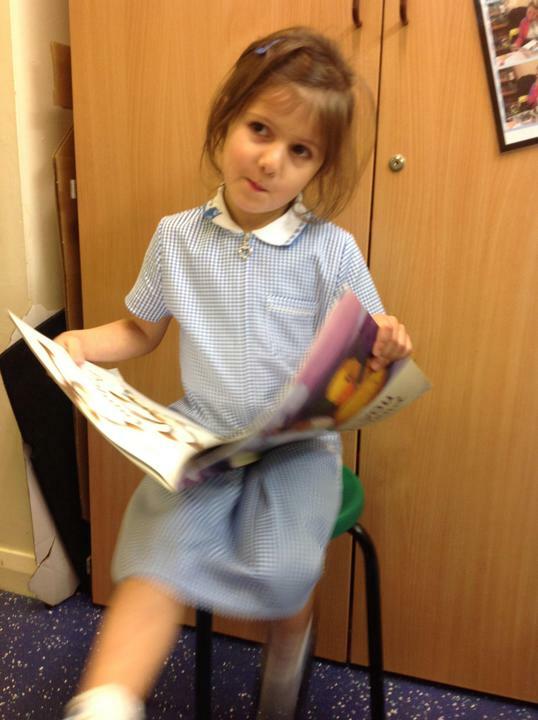 Below are some photographs of our self - portraits. 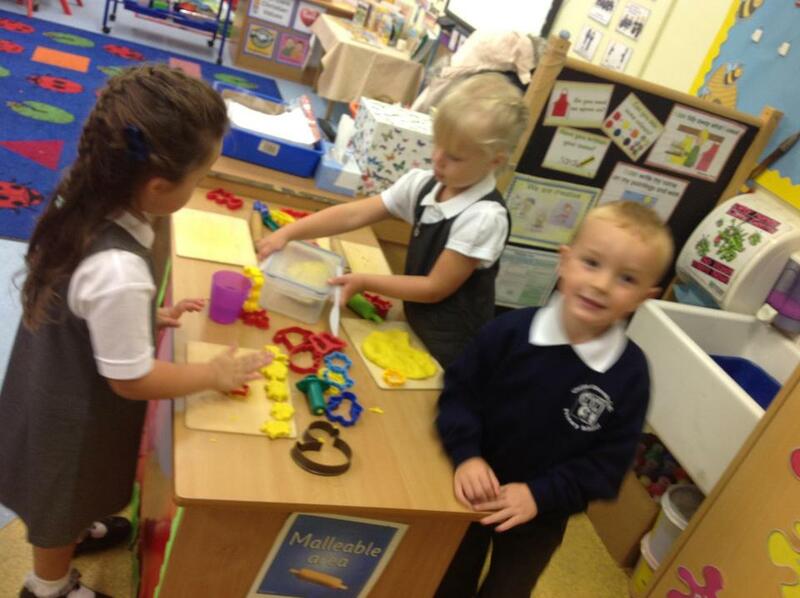 Here is a photograph of our Harvest display. 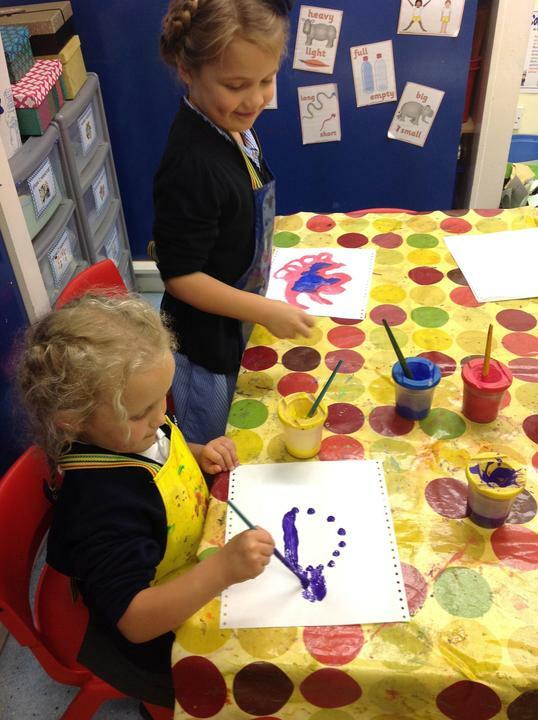 Reception have drawn pictures of their favourite meals. 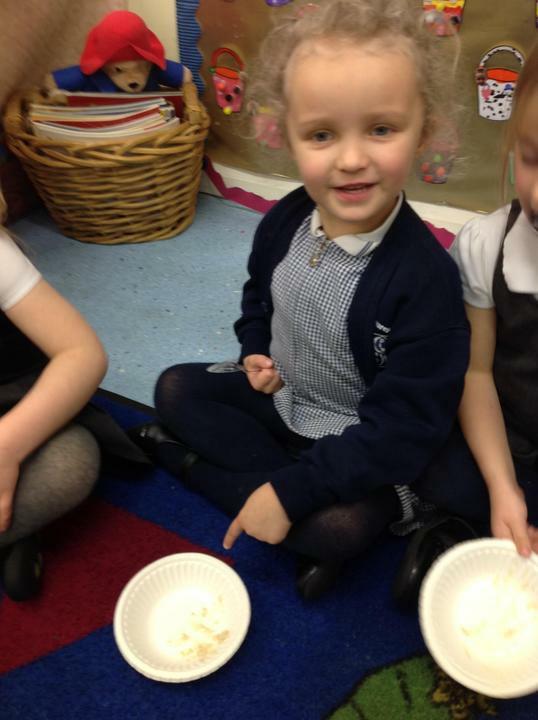 We talked about how we thank God for all our wonderful food at Harvest time. 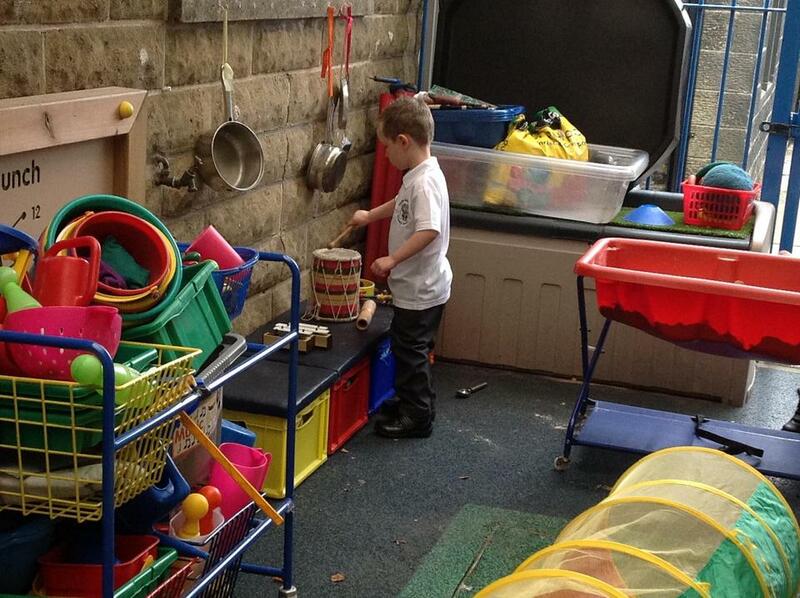 We took part in a Harvest service in church by bringing in food tins to help Colne open door. 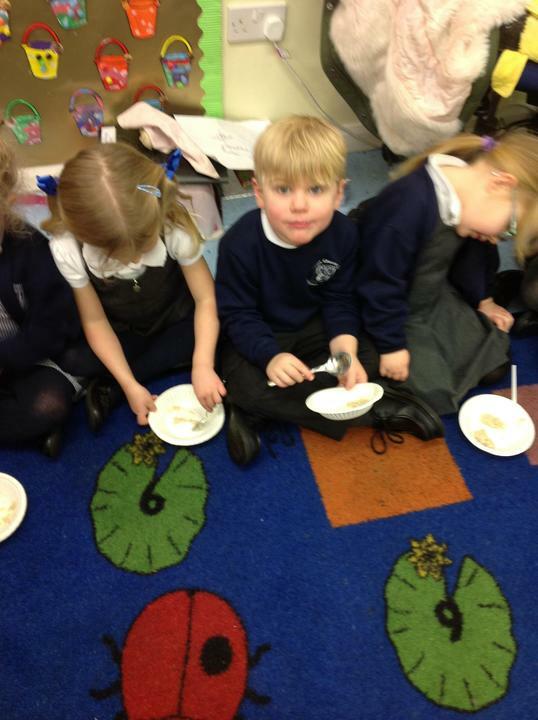 We talked about how God wants us to share our food with others so that everyone gets their fair share of food to eat. 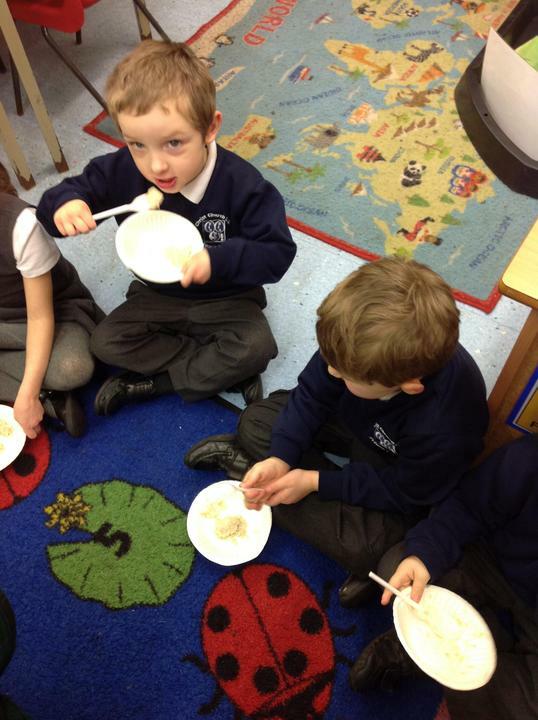 We listened to the Bible story 'Feeding of the 5000'. 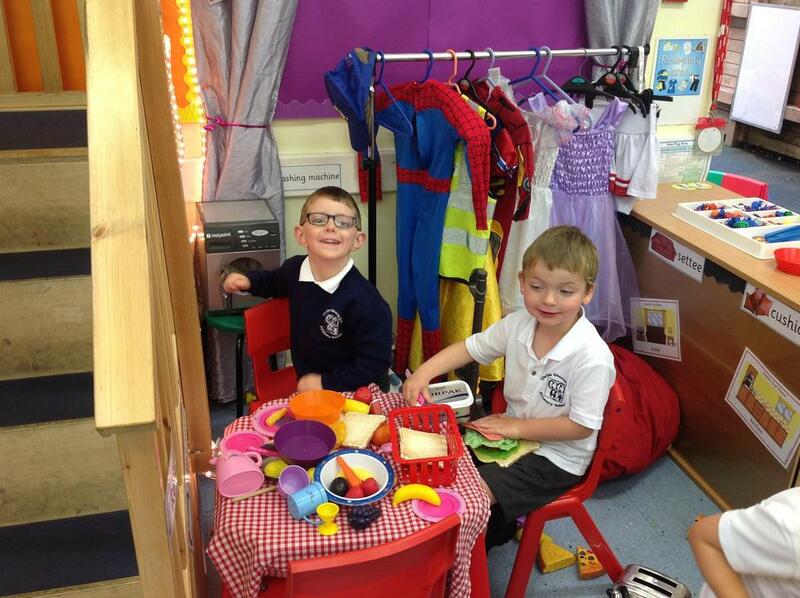 At the end of the story the little boy whispered "Jesus must be special, he fed one, two, three, four, five thousand people with my tea!" 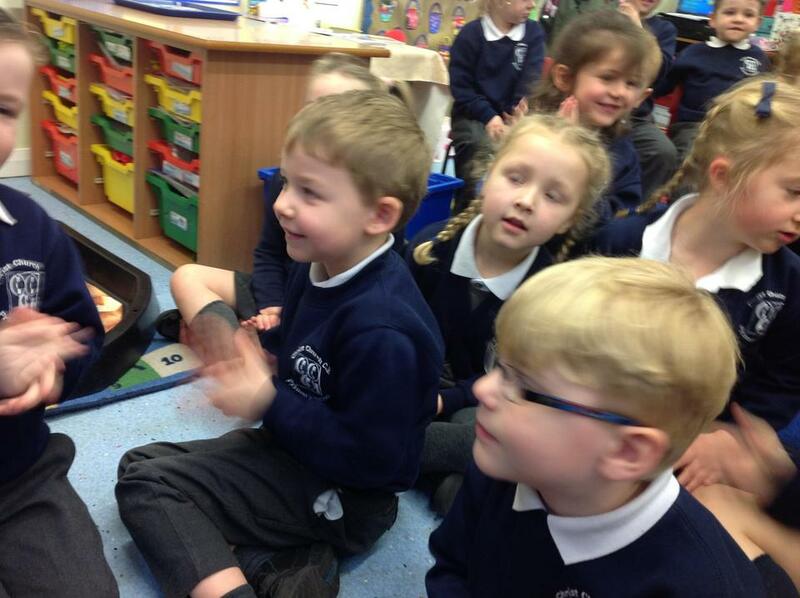 Reception really enjoyed acting out the story and talking about how God wants us to share our food. 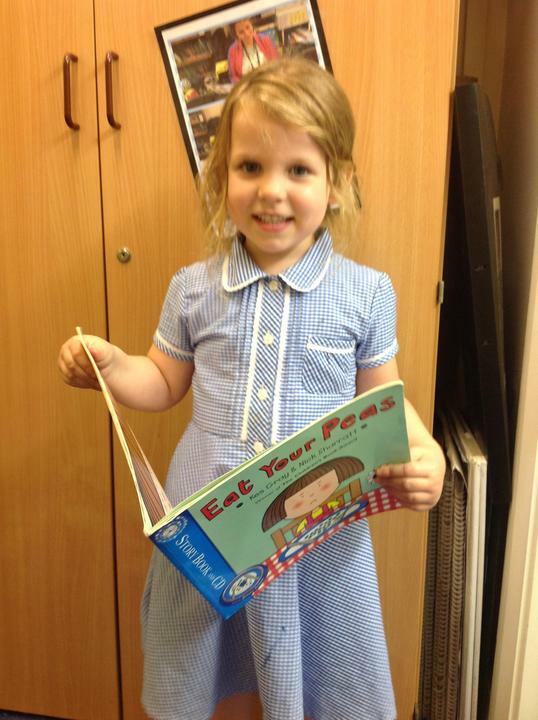 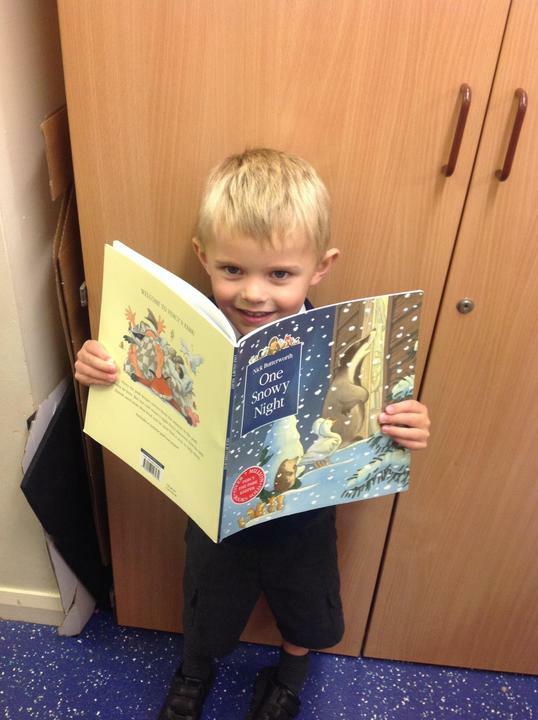 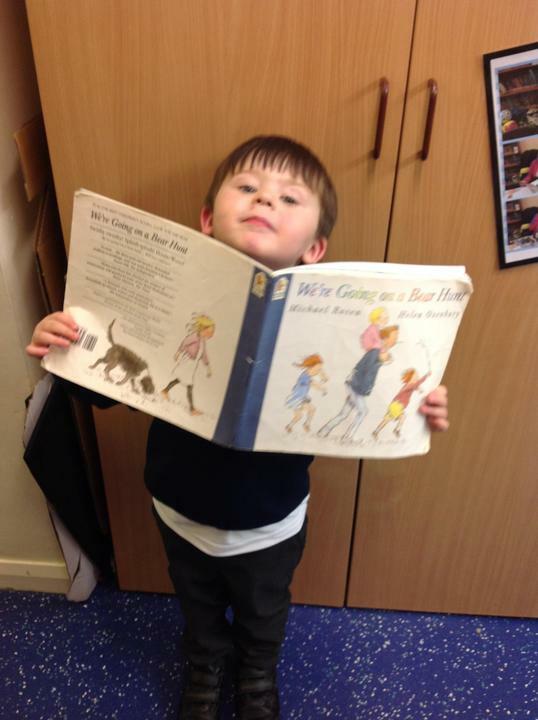 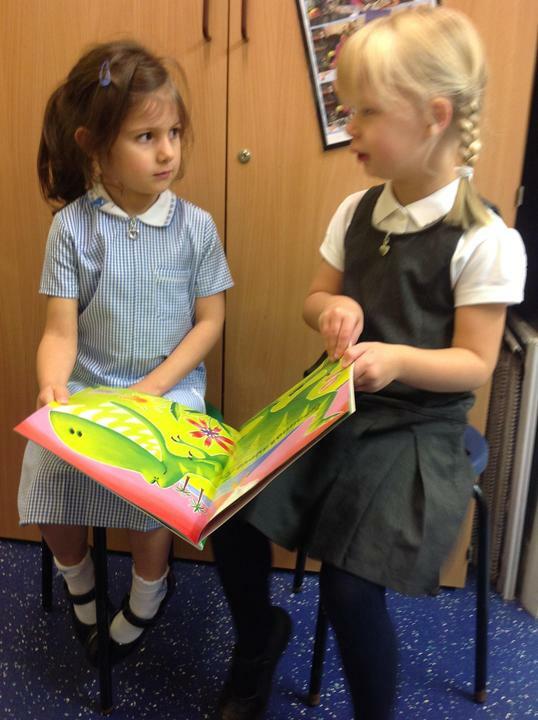 This half - term, Reception have been reading stories by Julia Donaldson. 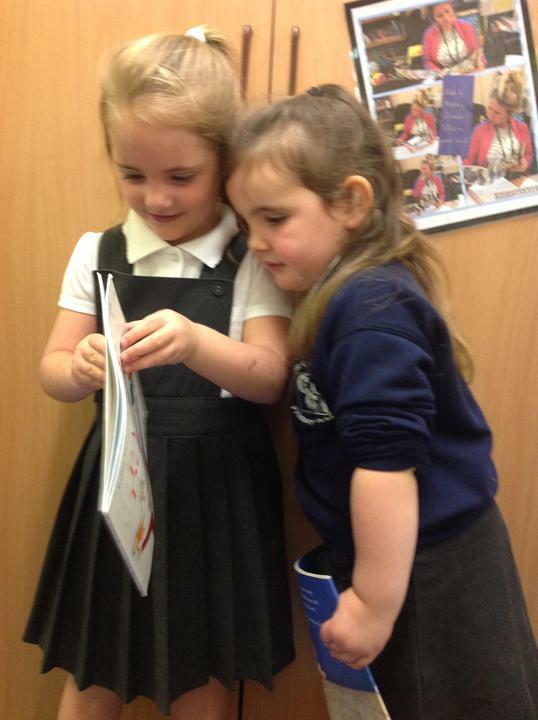 In particular, they have enjoyed reading 'The Gruffalo'. 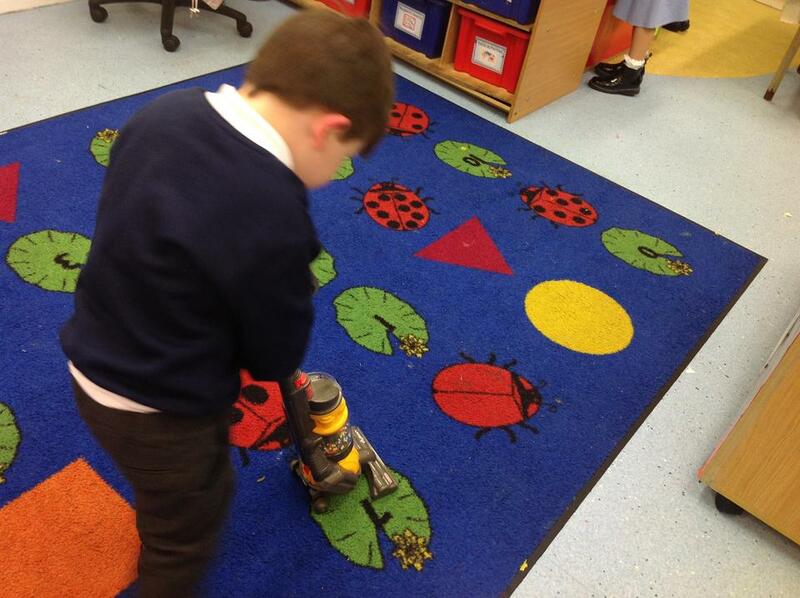 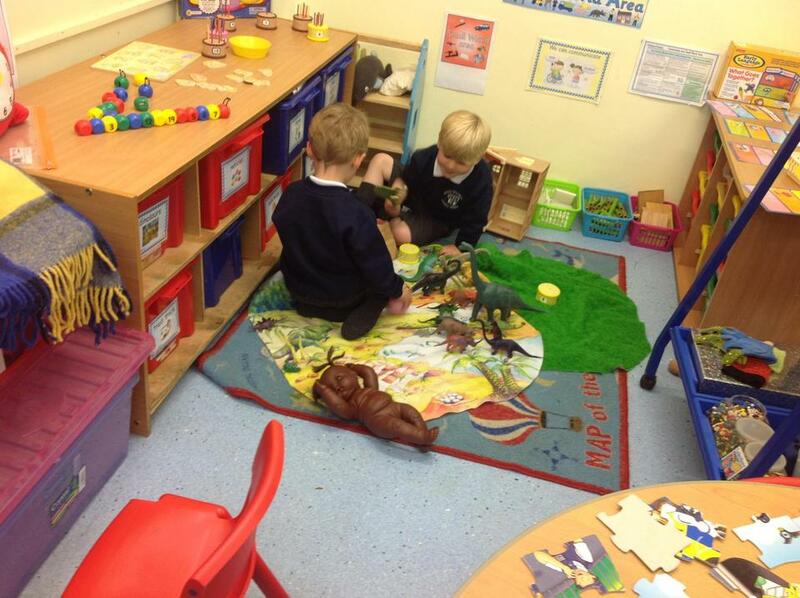 As a result of this, we have started to make a Gruffalo Cave in our classroom. 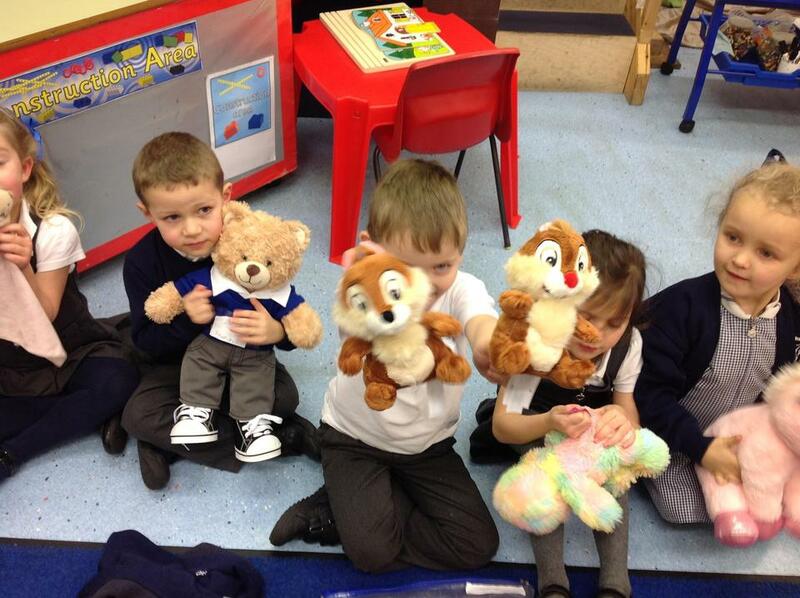 The children are enjoying acting out the story, dressing up as the different characters and using puppets to retell the story. 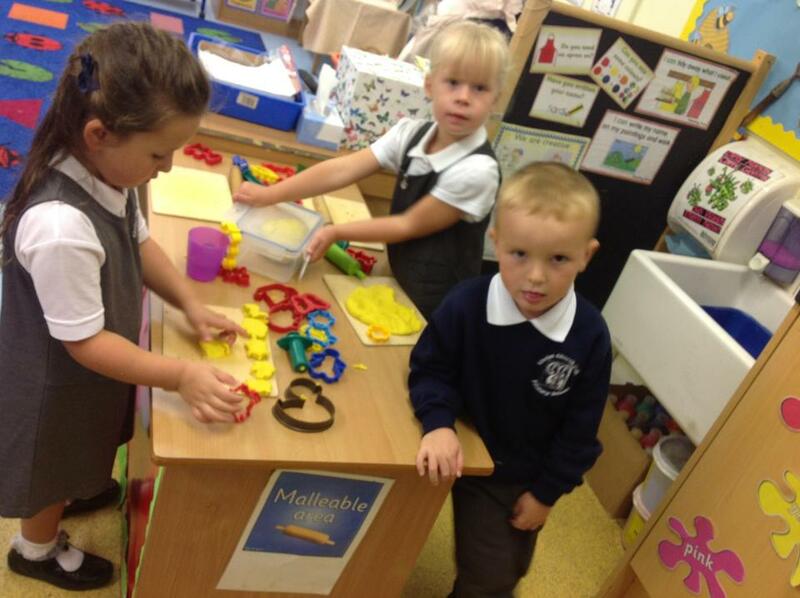 This week in Maths, Reception have been learning to count, order and recognise numbers to 20. 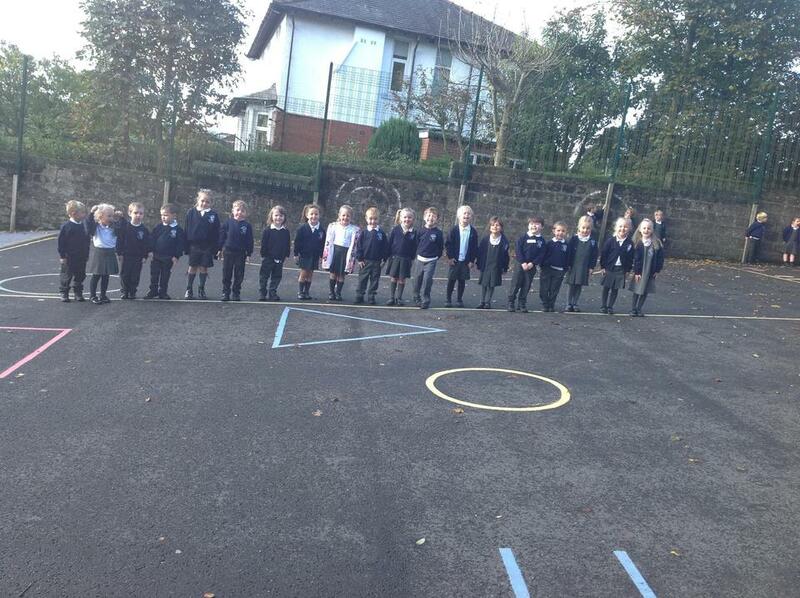 Today, we made a number line using ourselves. 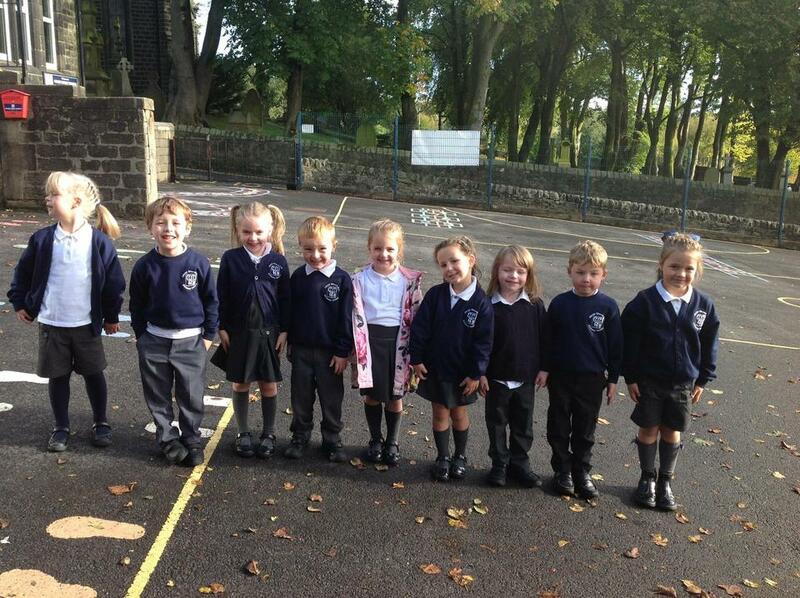 We started with one child for the number 1, then two children for the number 2 and so on. 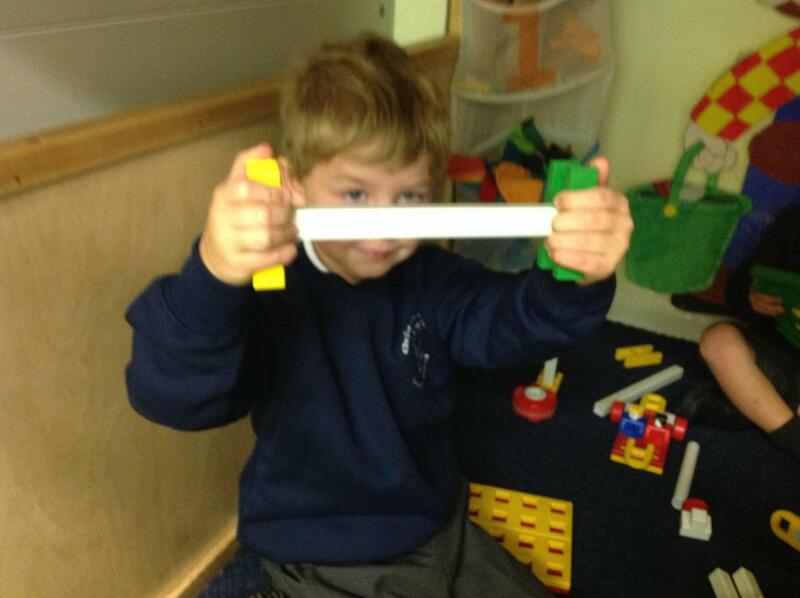 Here are some pictures of our number line. 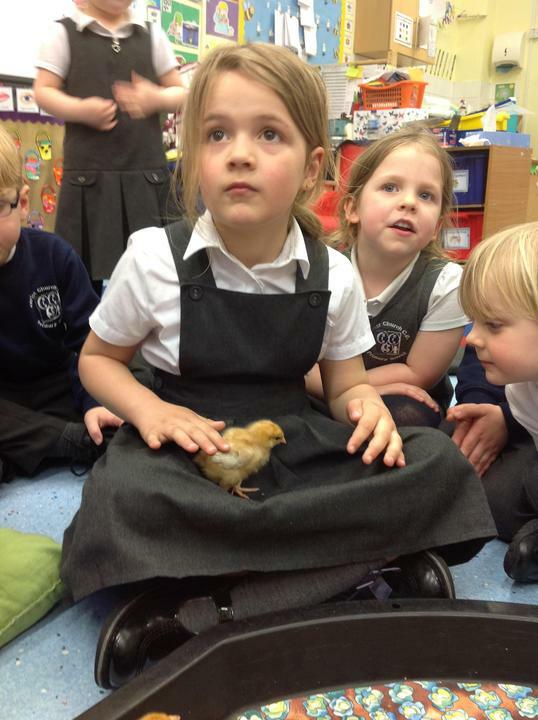 In whole - school worship, we talked about how God created a wonderful world for us to live in. 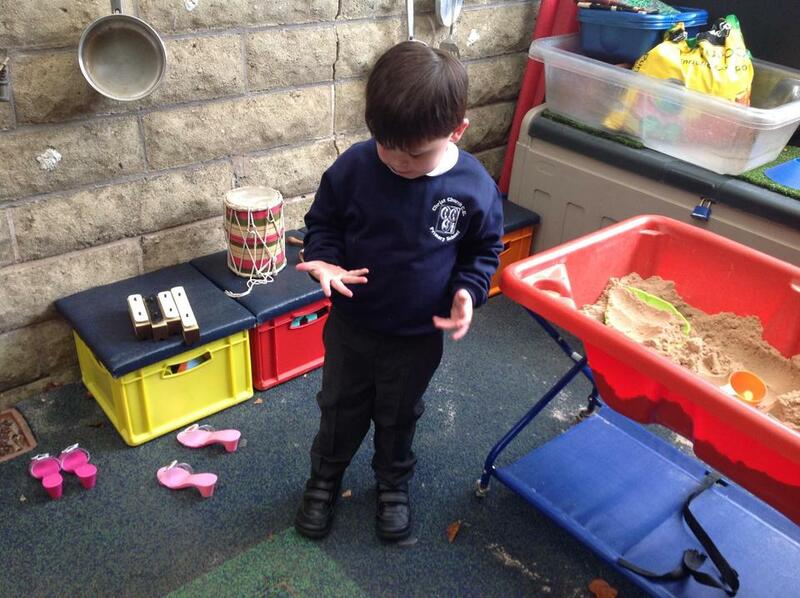 We discussed how he gave us five senses to help us enjoy it. 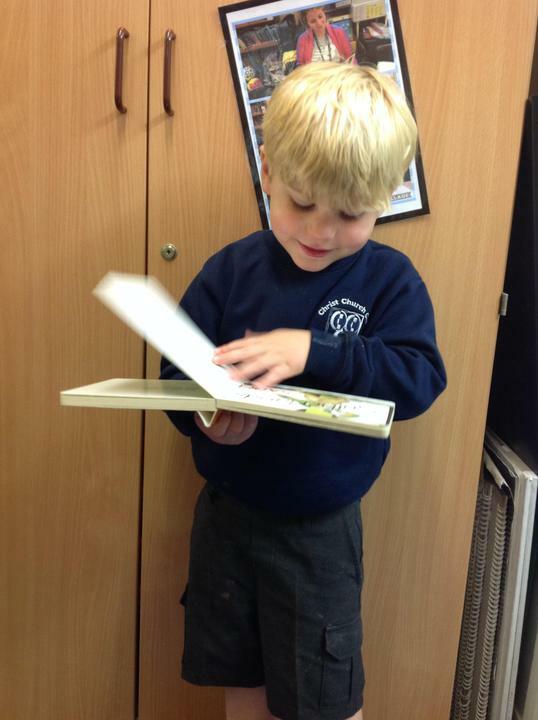 Mr Peers then read a story called 'Lucy's Picture'. 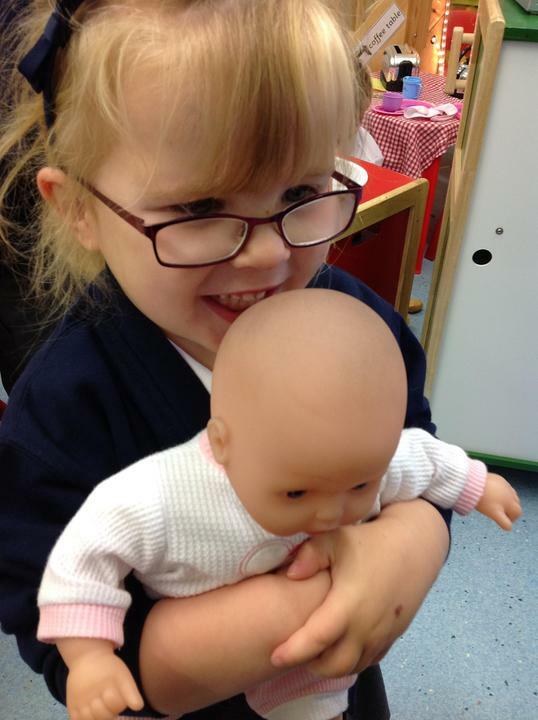 Lucy created her picture in a way that her grandfather, who was blind, could enjoy. 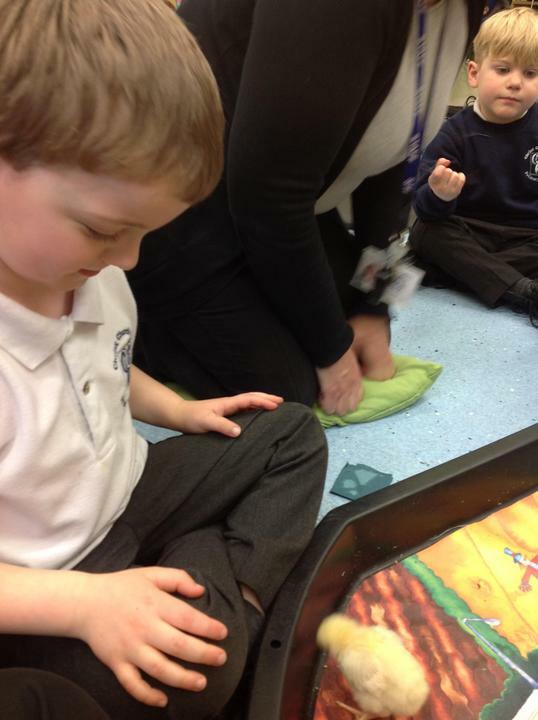 In class worship, we decided to make our own sensory picture just like Lucy's picture. 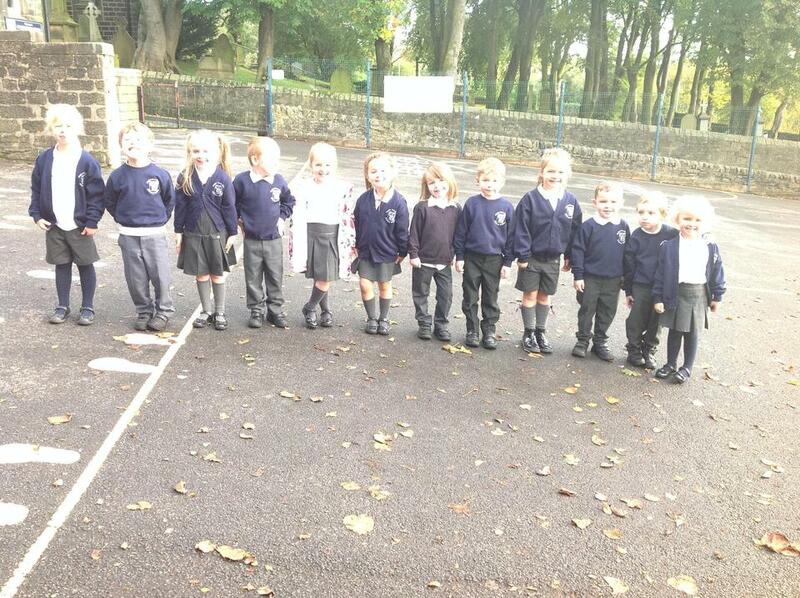 We went on a walk around school and collected objects that we thought would represent an Autumn picture. 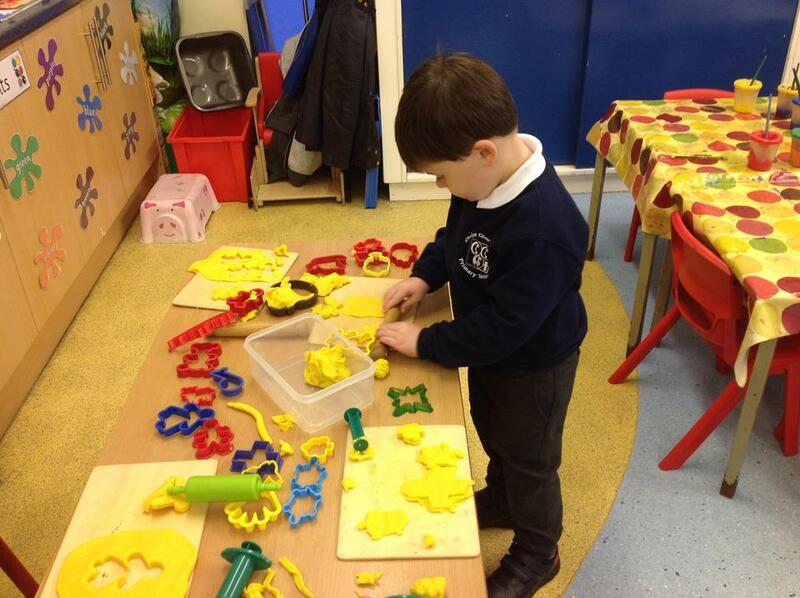 We then worked together to make a sensory picture that would be enjoyable for someone who is blind. 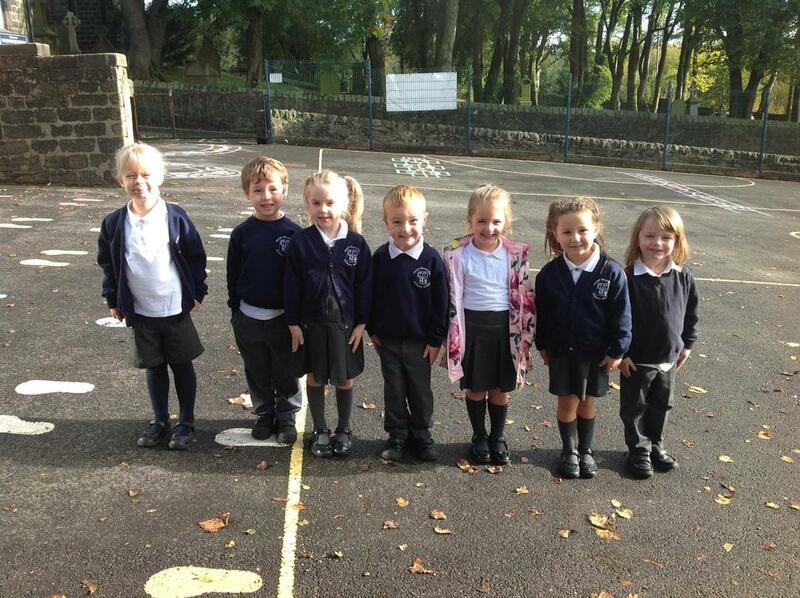 Below is a photograph of our Autumn picture. 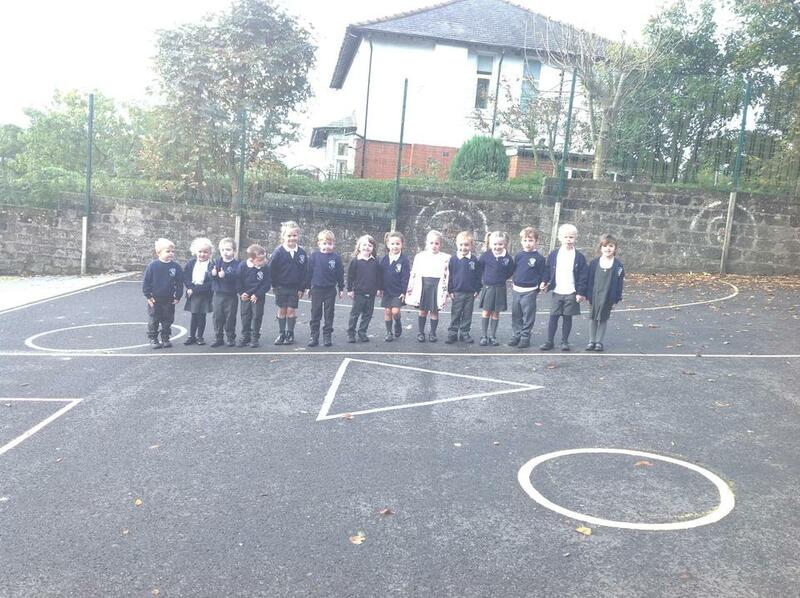 This week in Maths, we have been learning how to make two step and three step repeating patterns. 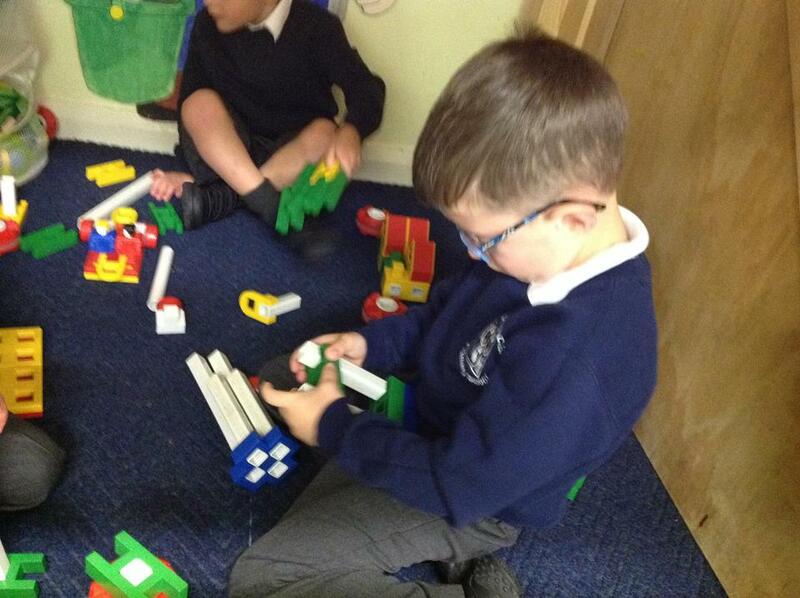 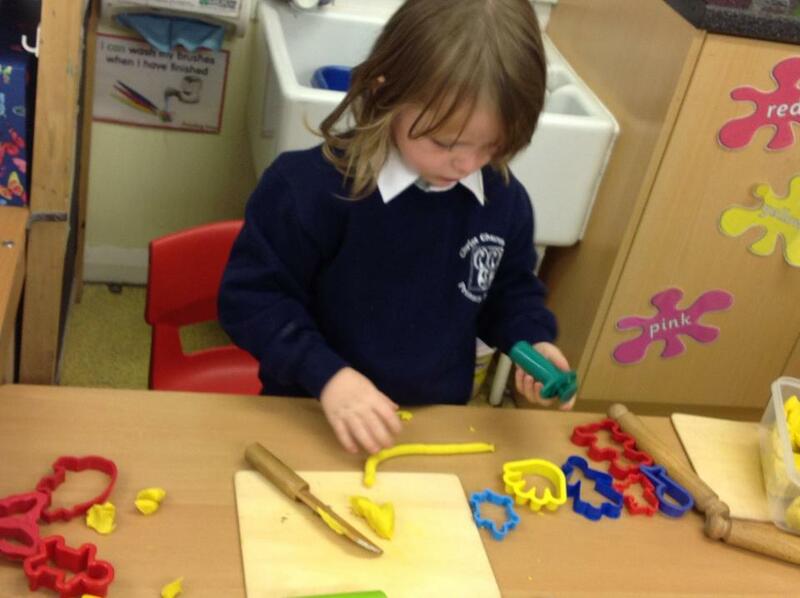 We have been making patterns using different objects. 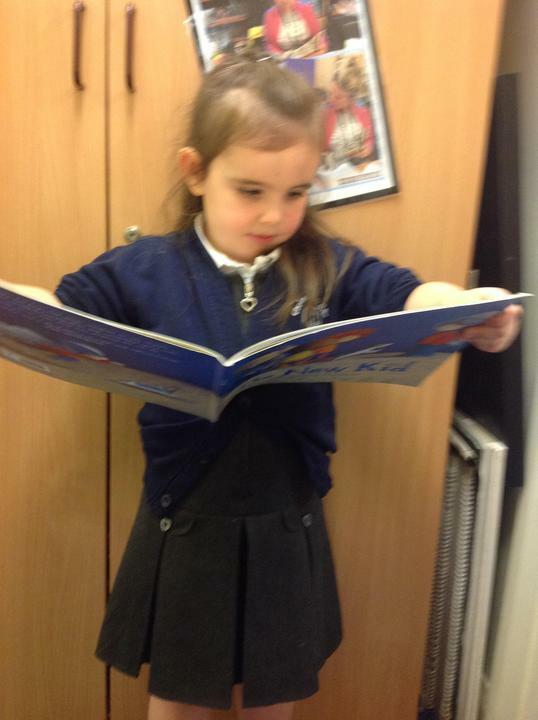 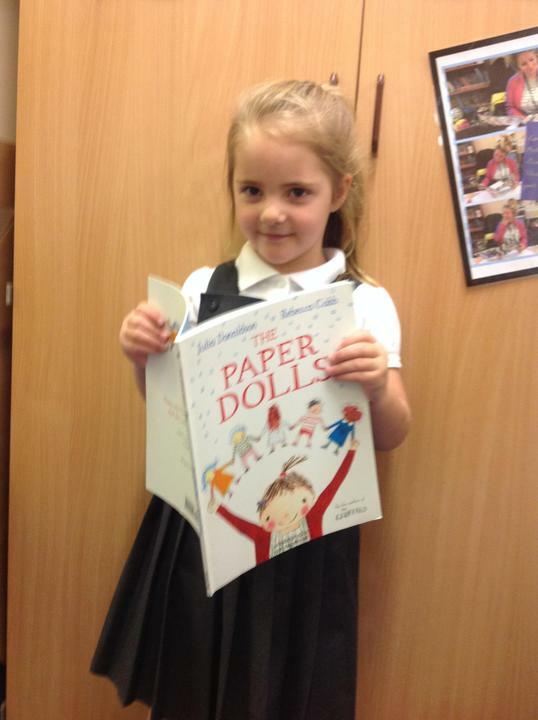 Today, Reception all brought in their favourite story book from home. 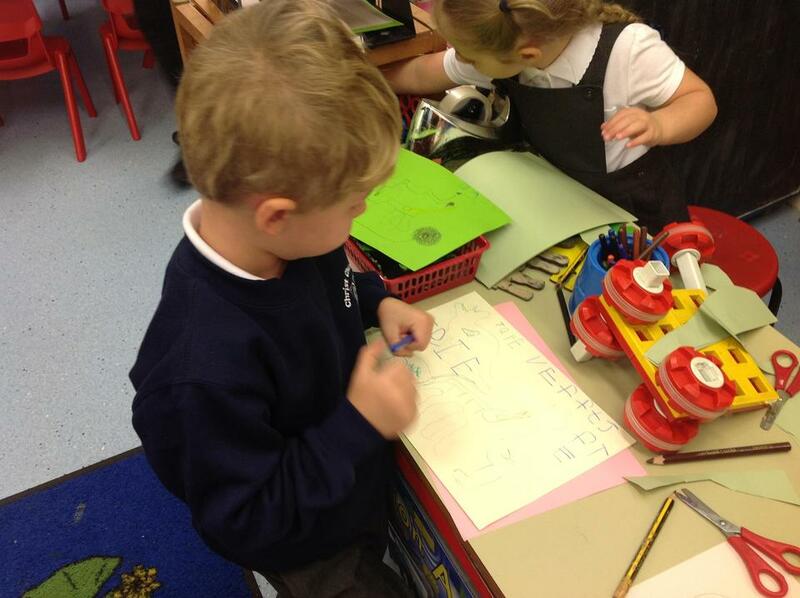 The children all drew a picture to show their favourite part of their story book. 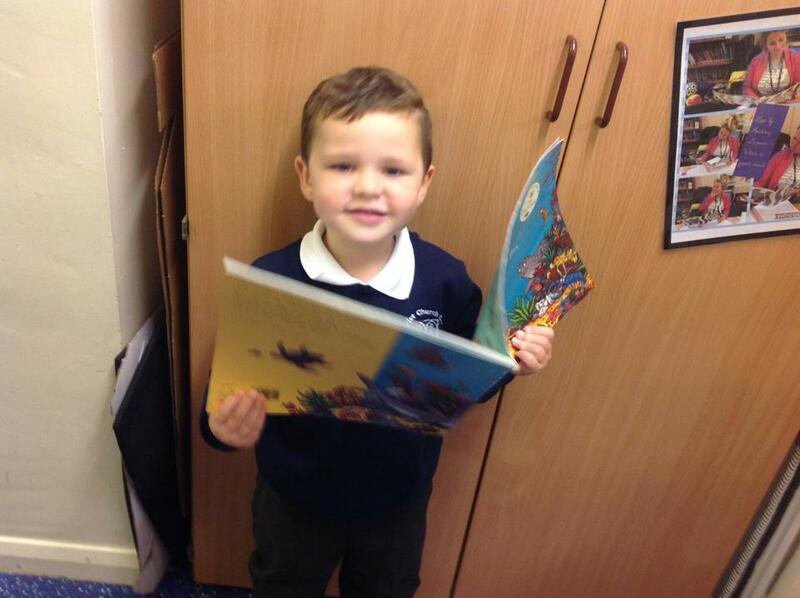 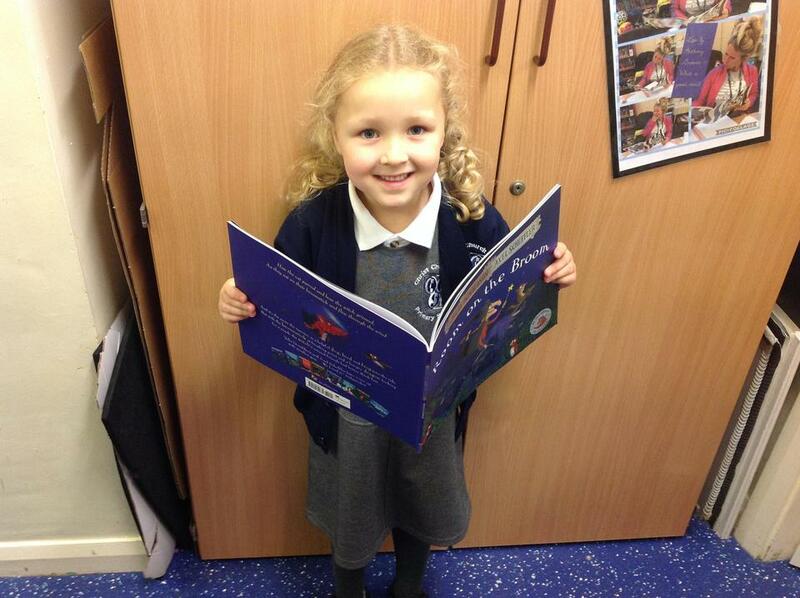 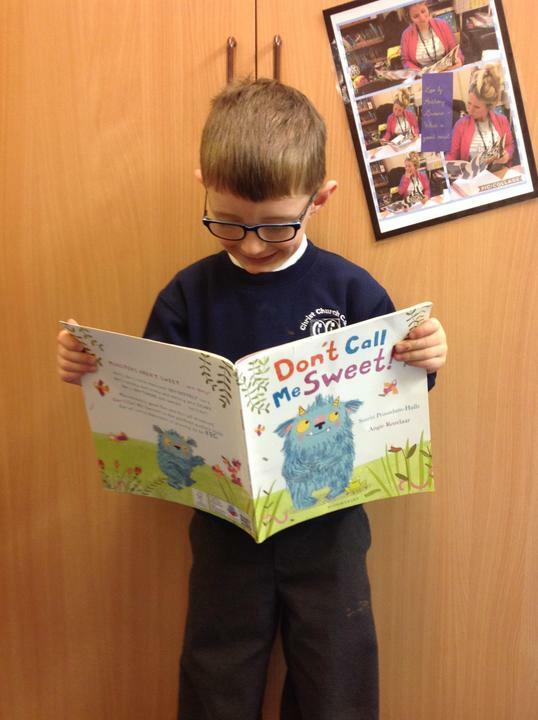 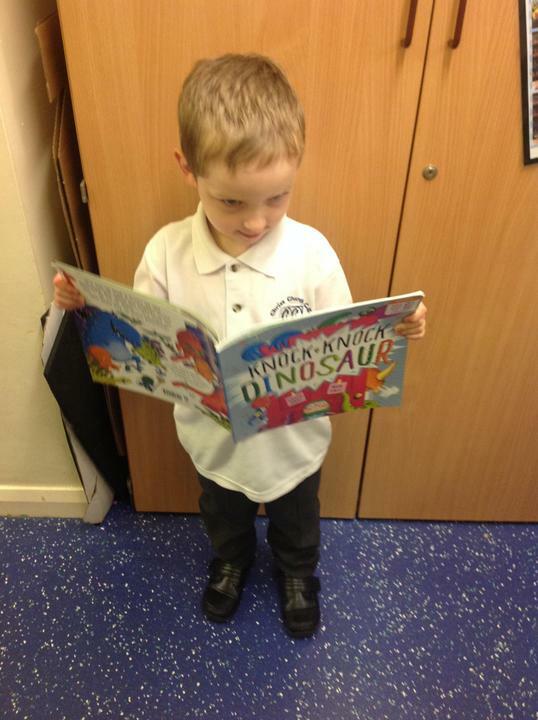 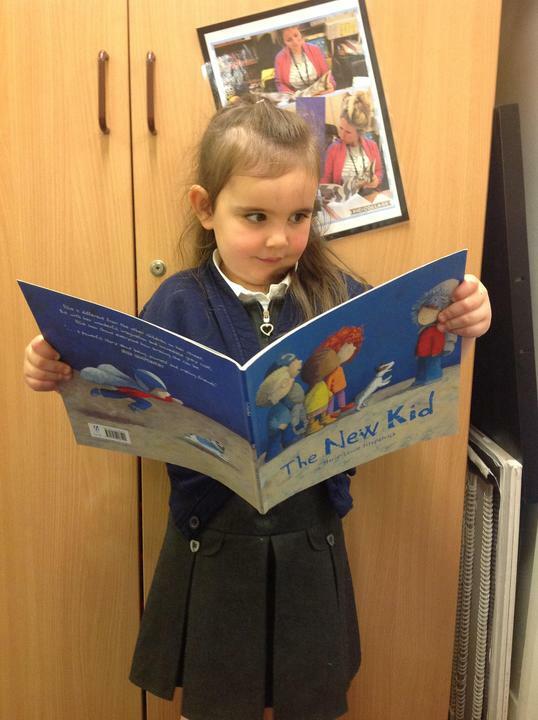 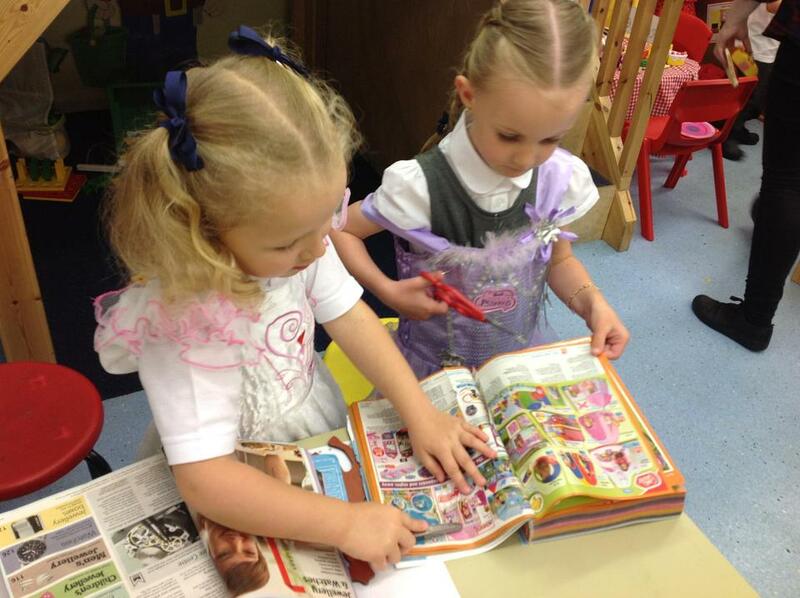 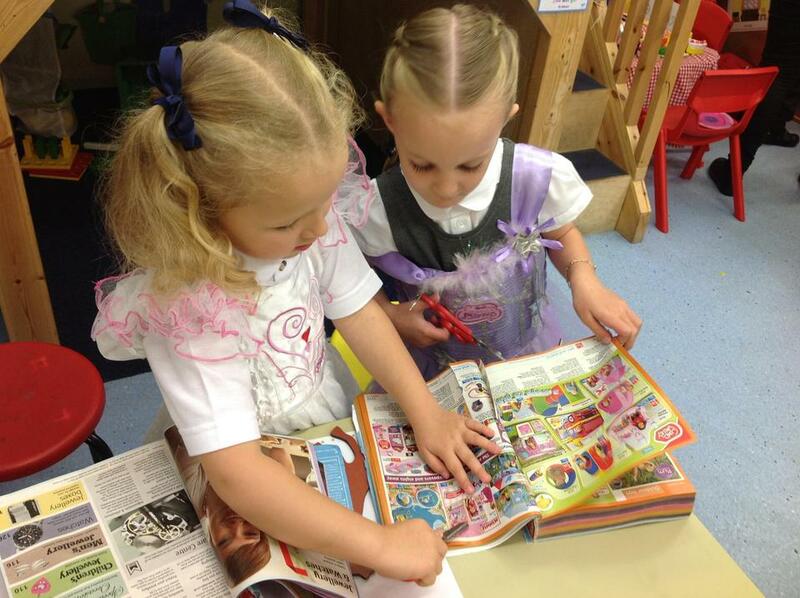 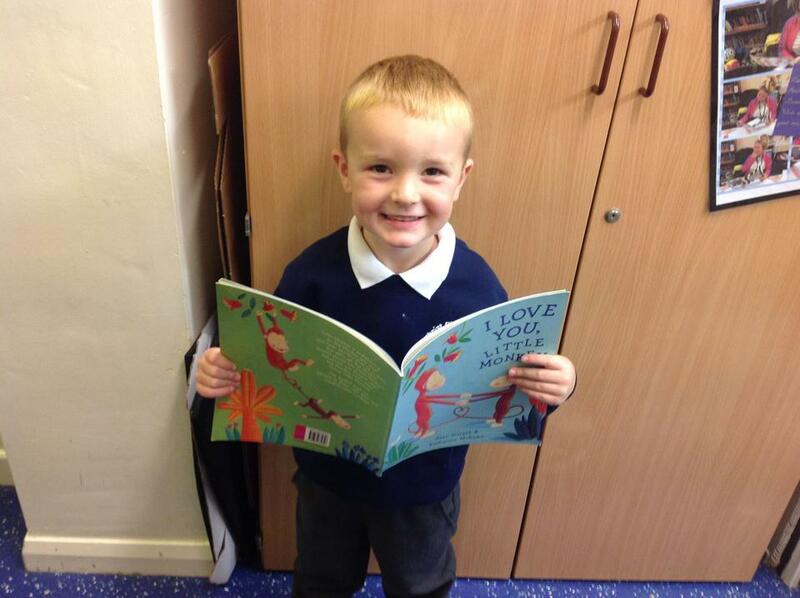 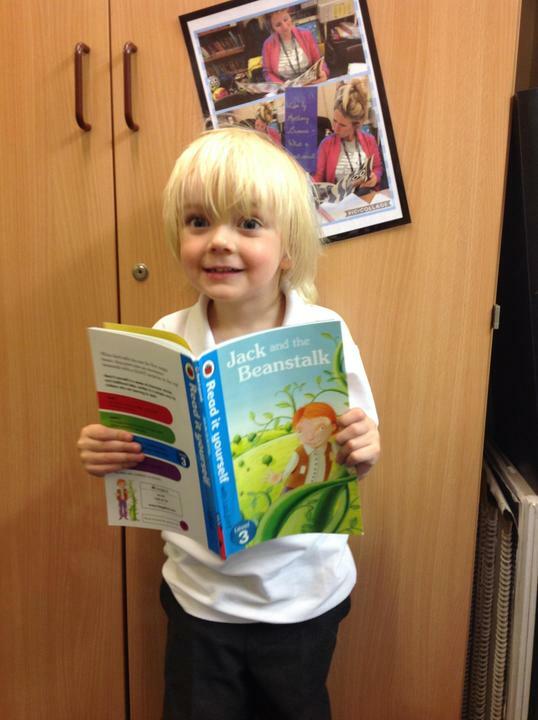 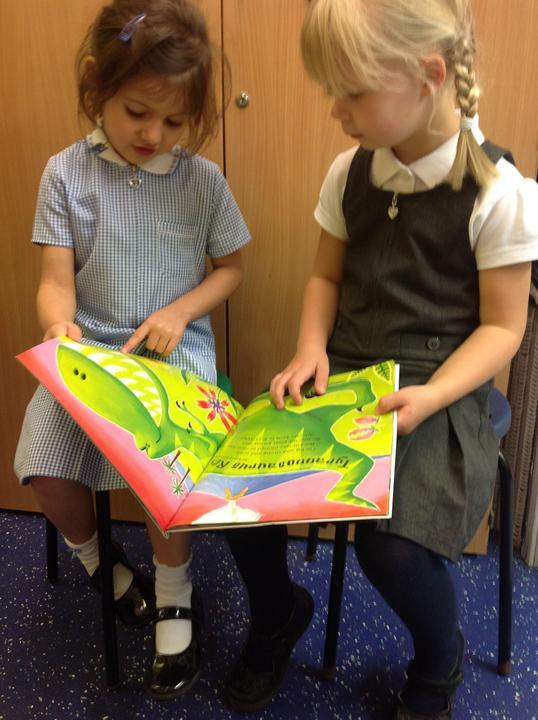 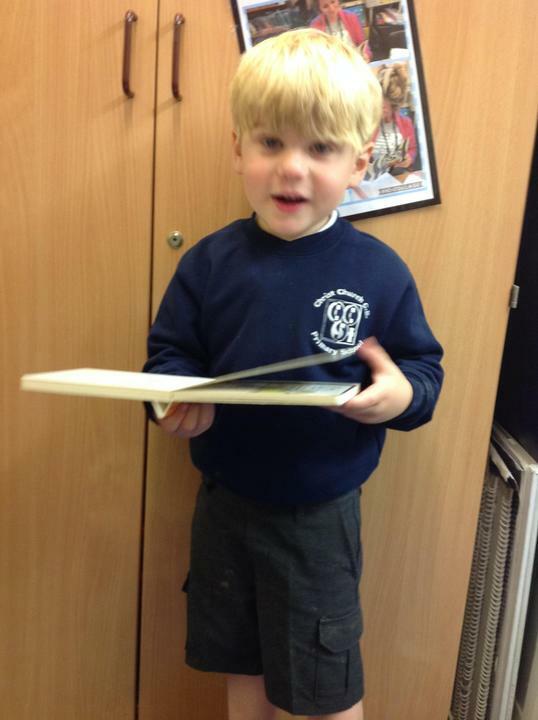 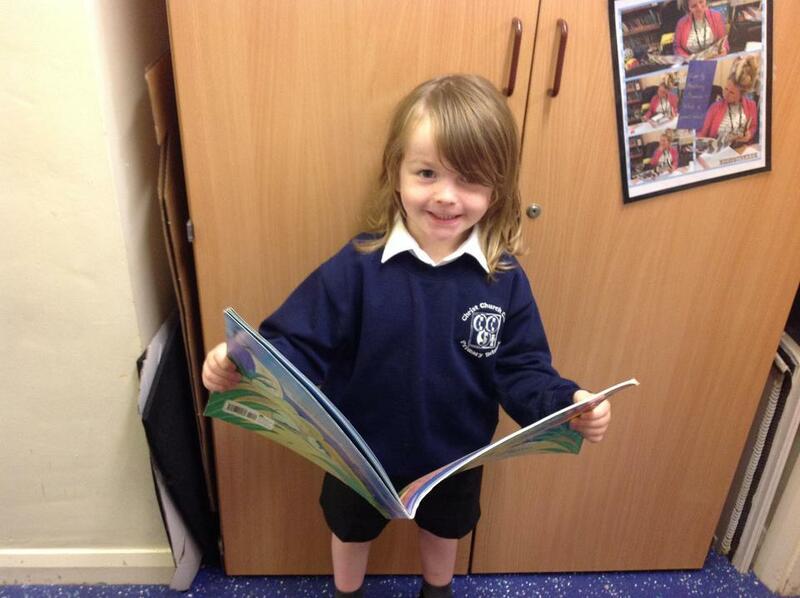 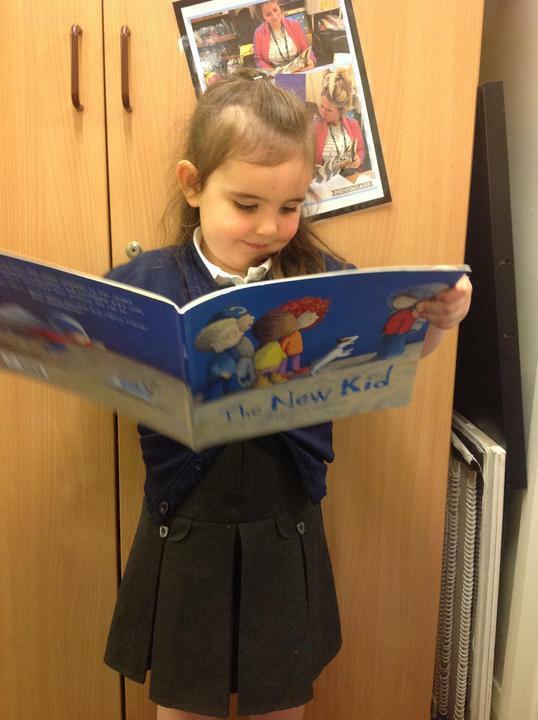 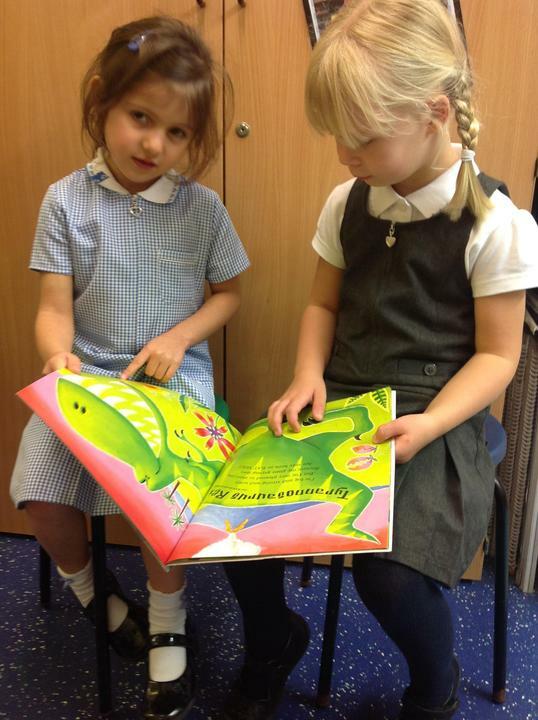 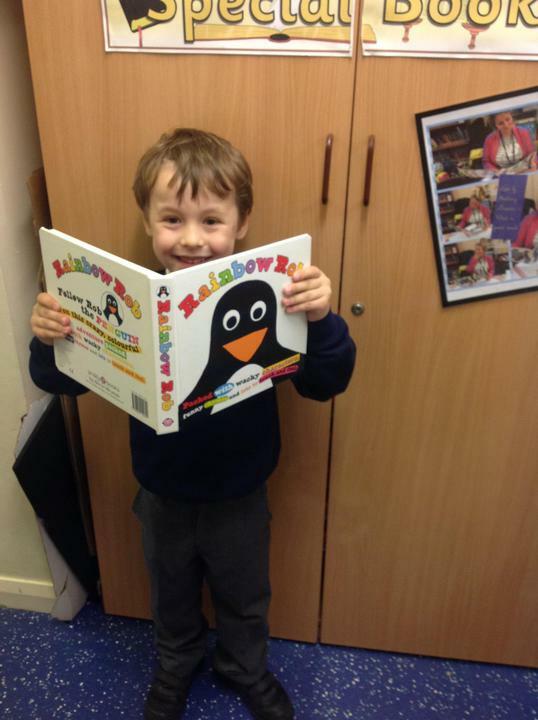 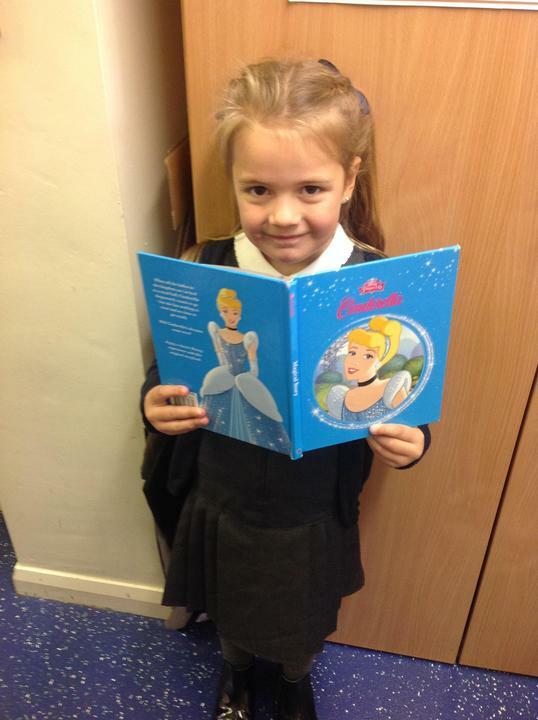 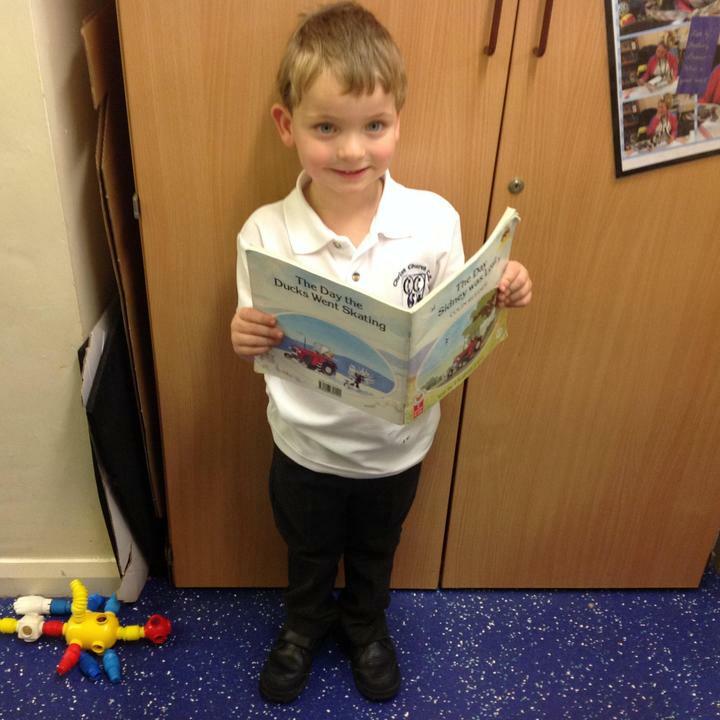 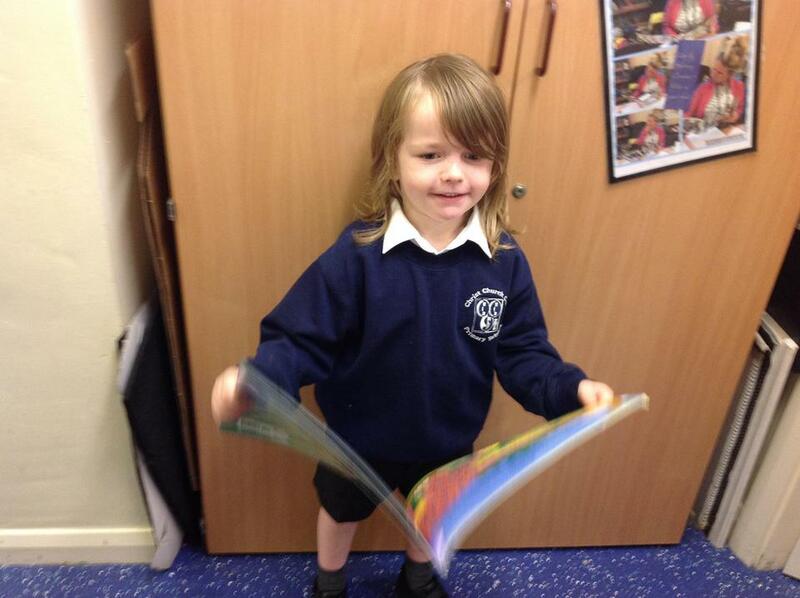 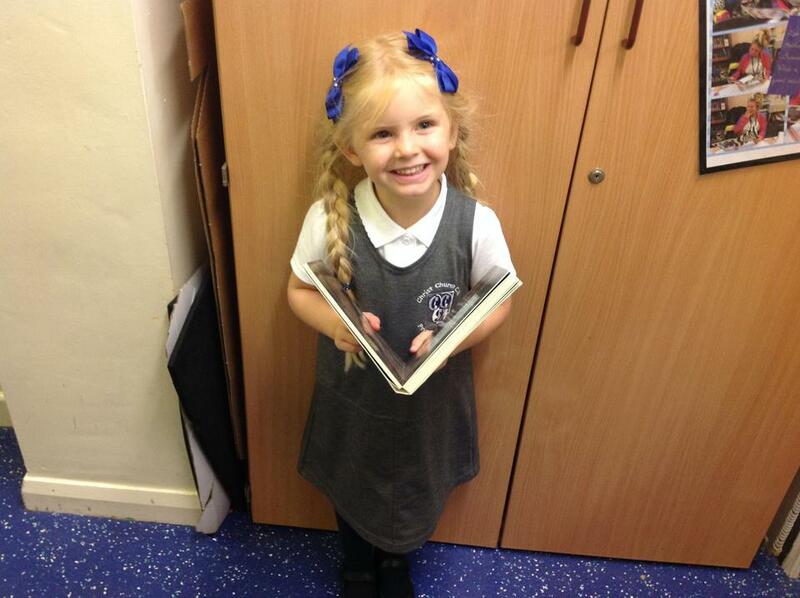 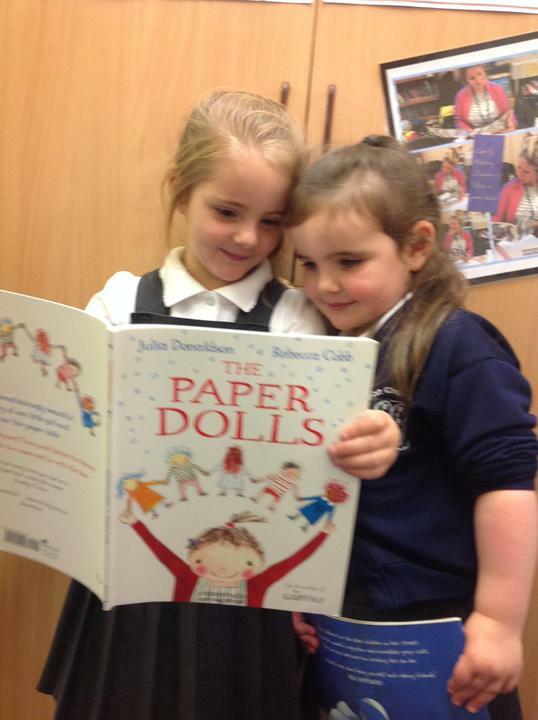 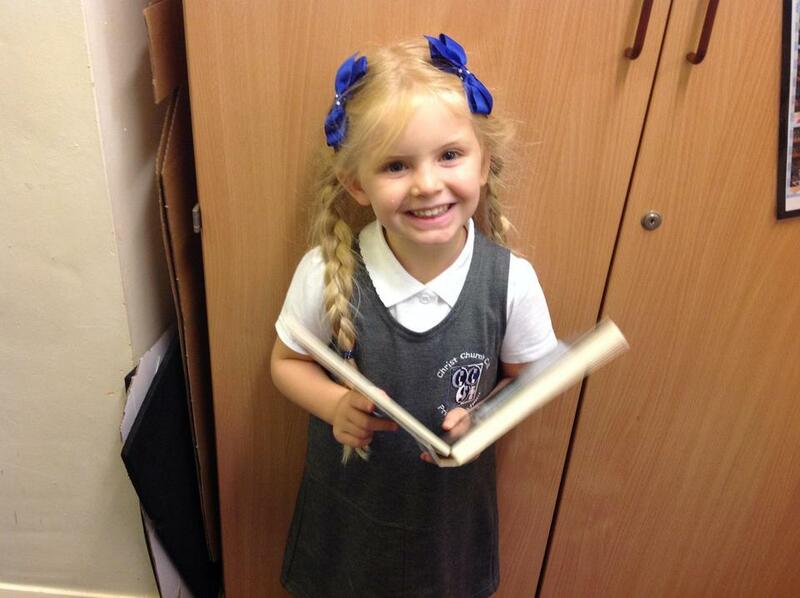 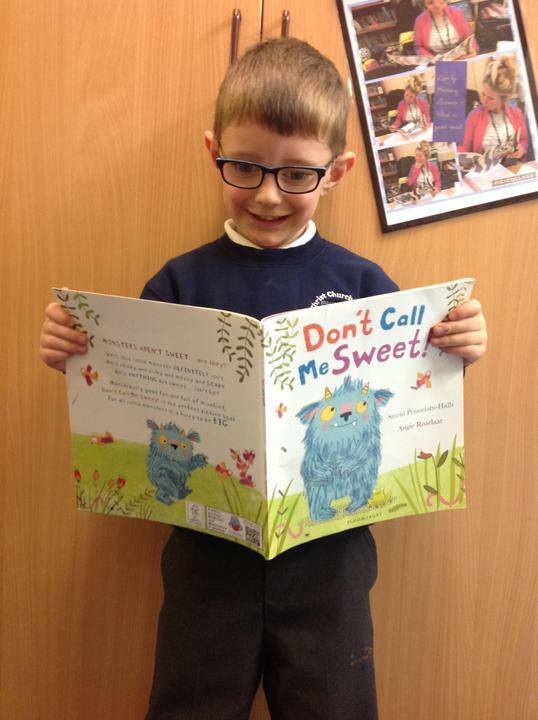 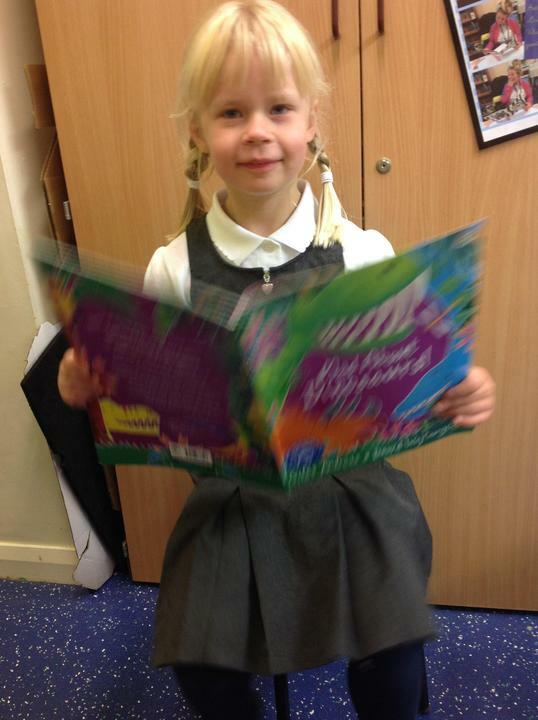 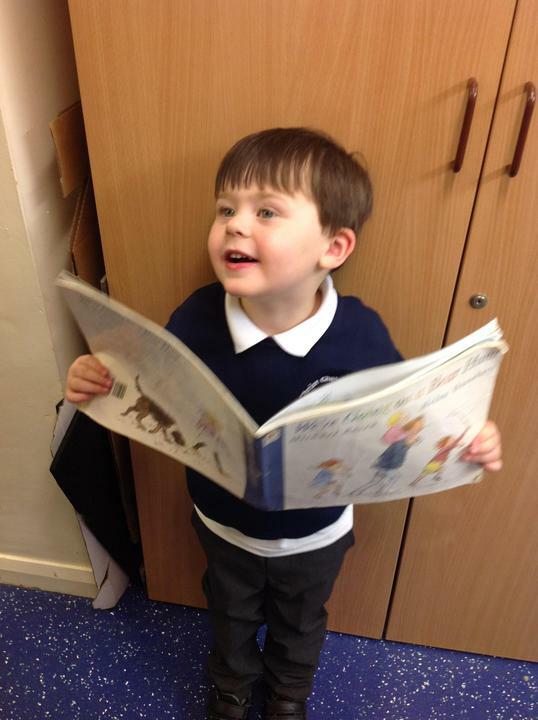 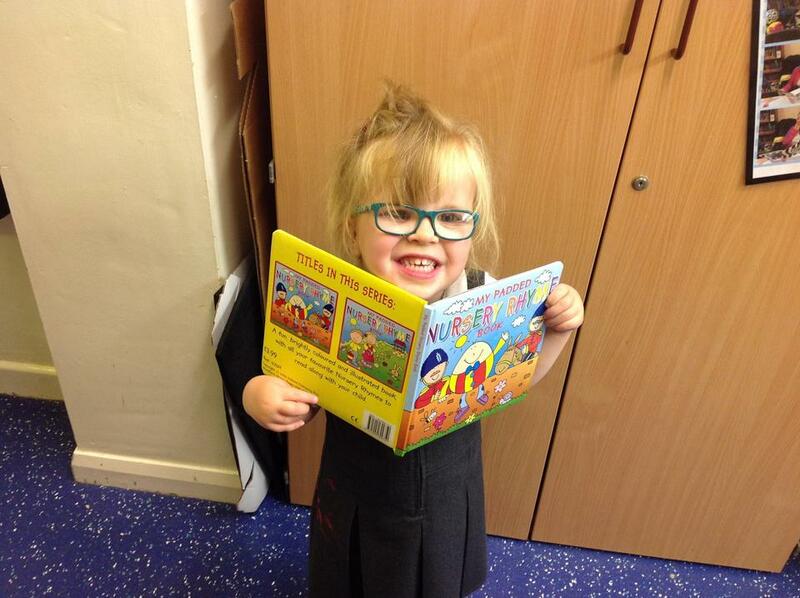 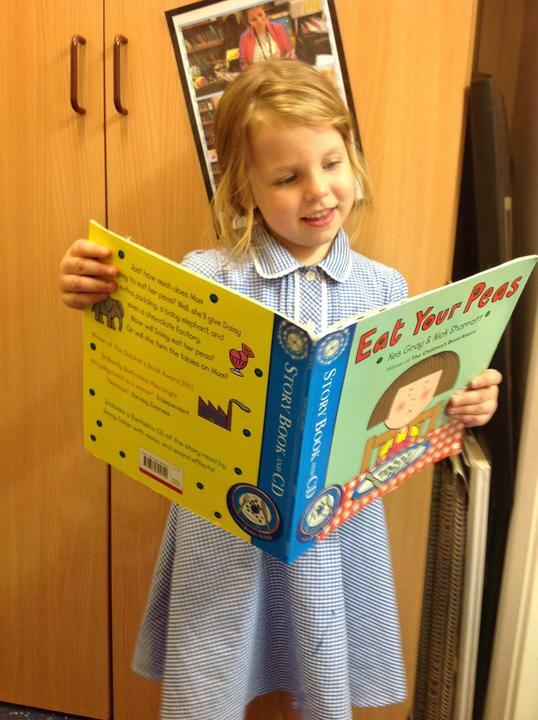 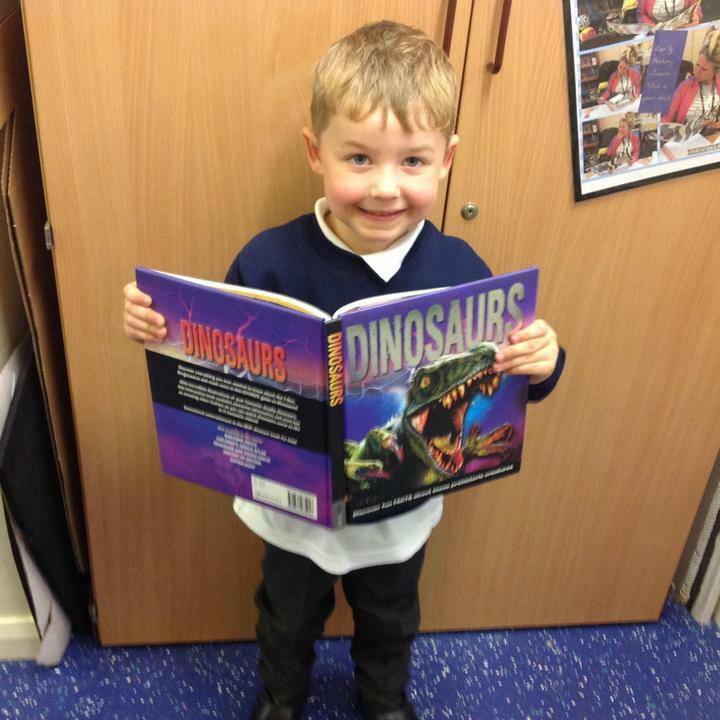 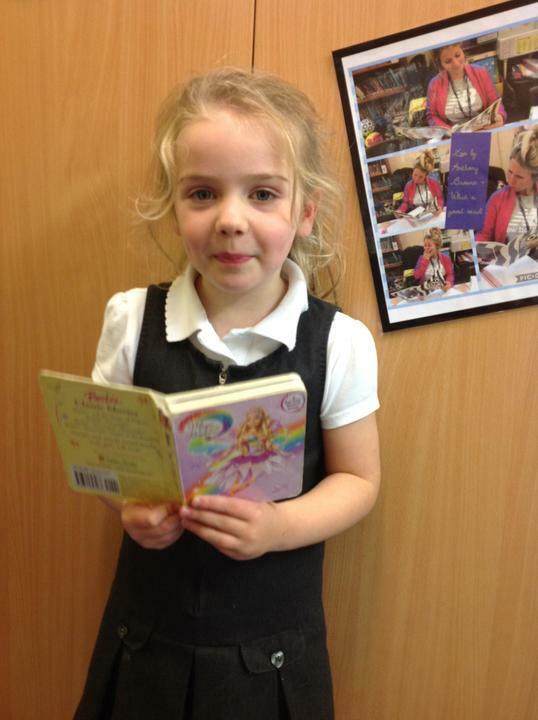 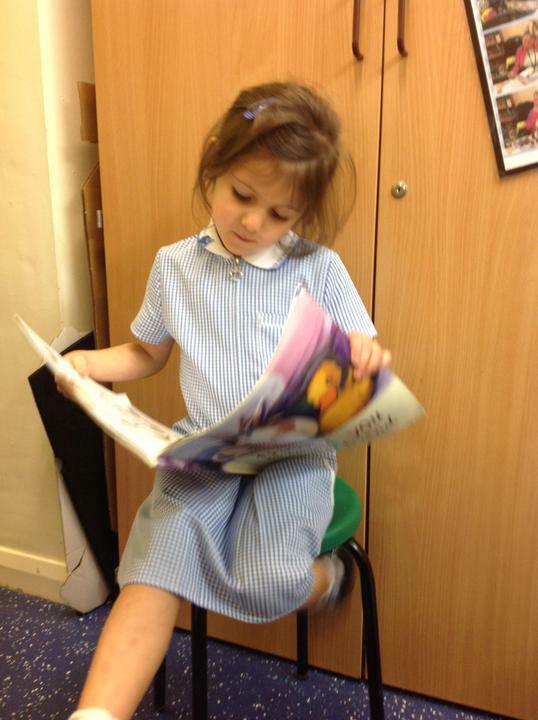 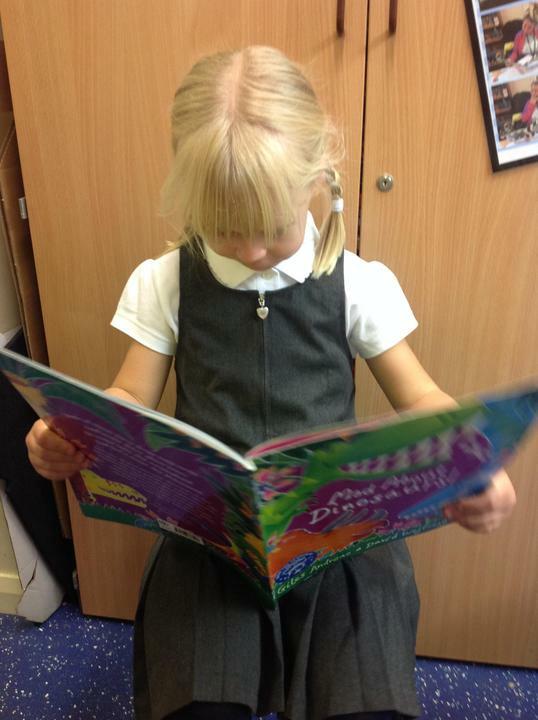 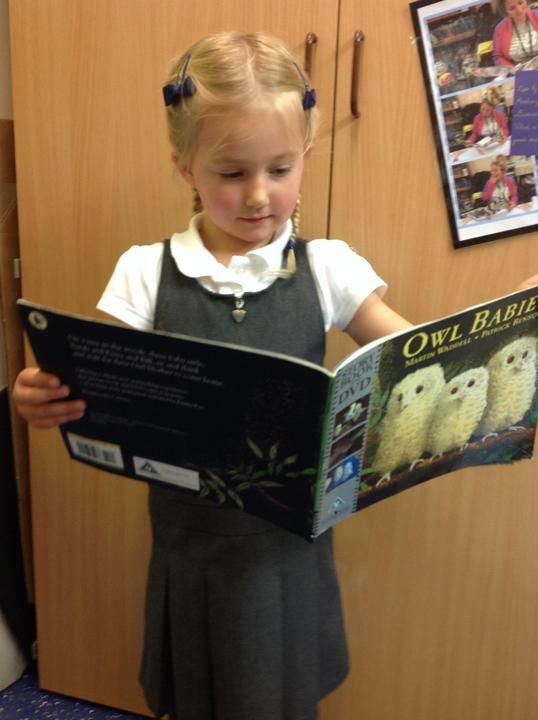 Here are some photographs of the children reading their favourite story books. 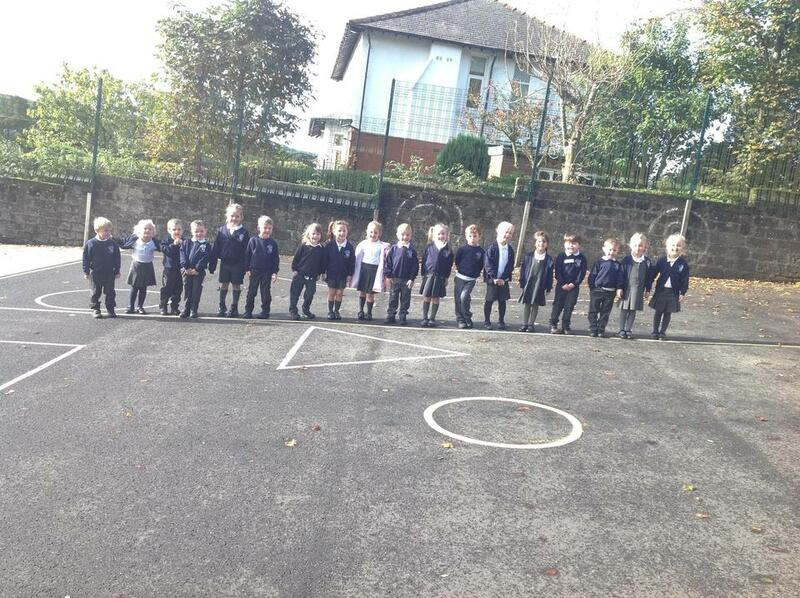 A big welcome to Reception Class 2017!!! 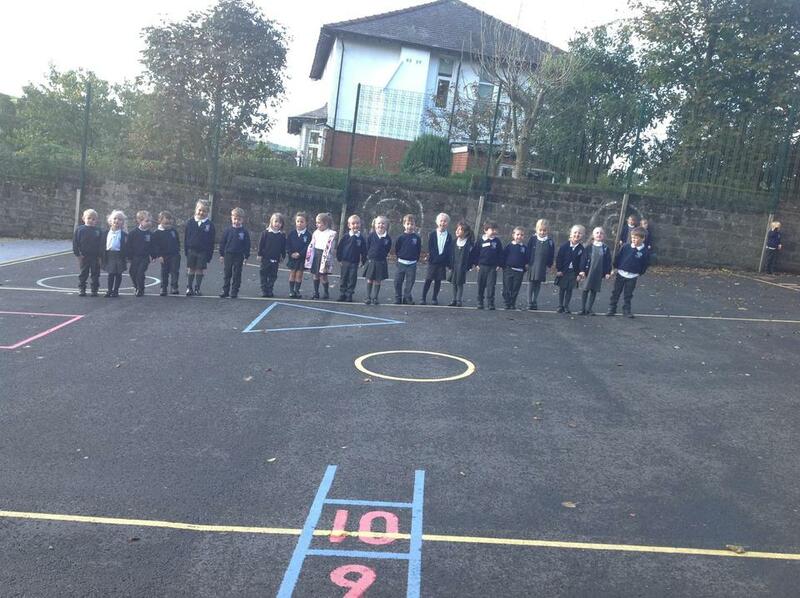 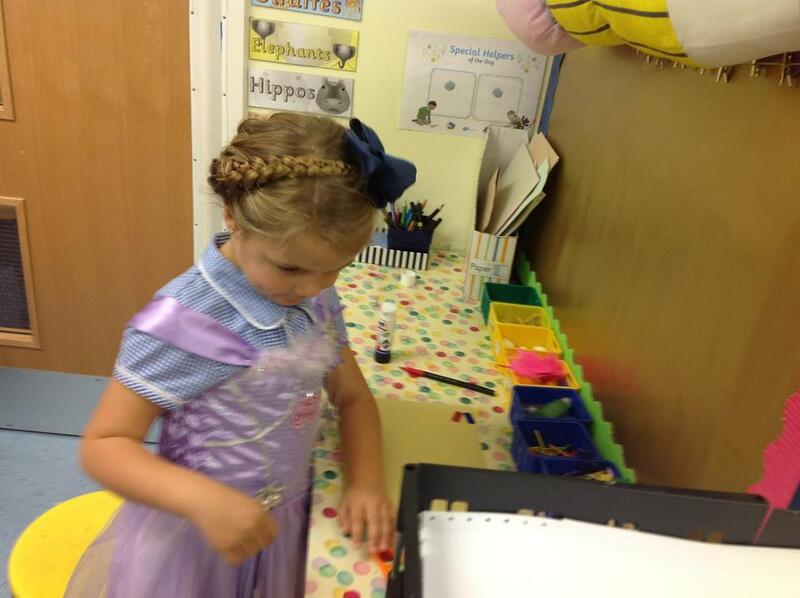 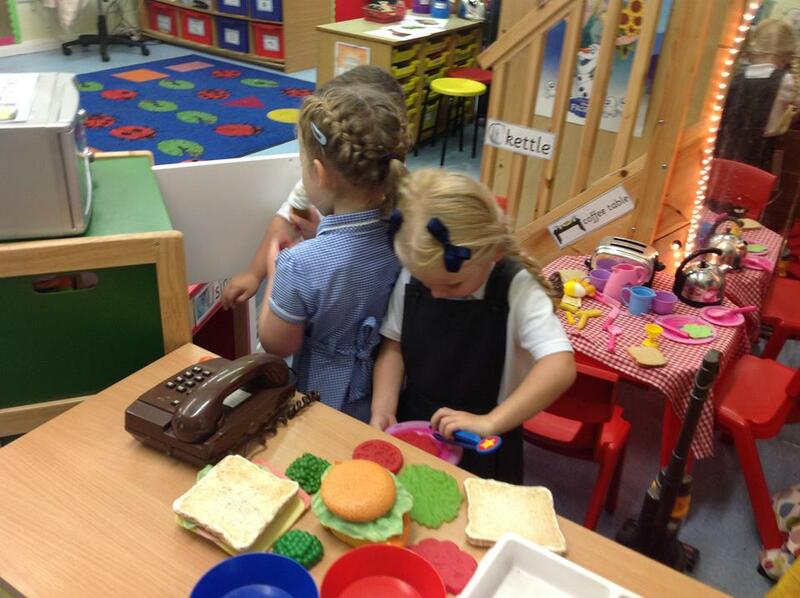 Reception have had a lovely first day at school. 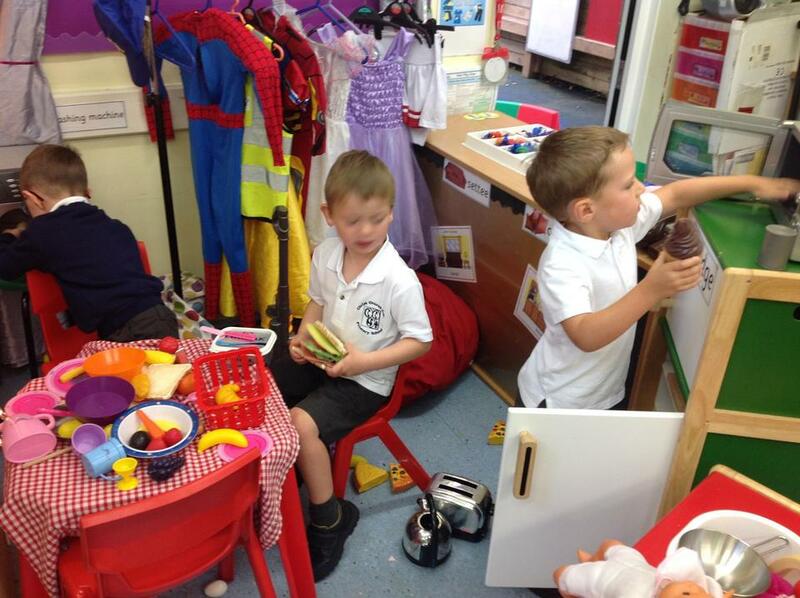 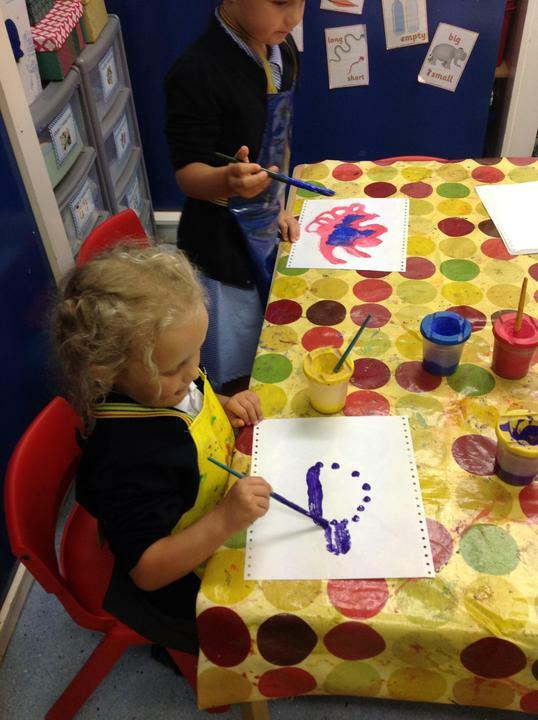 They have been busy making new friends, building vehicles, painting beautiful pictures, dressing up as different characters and playing in the outdoor area. 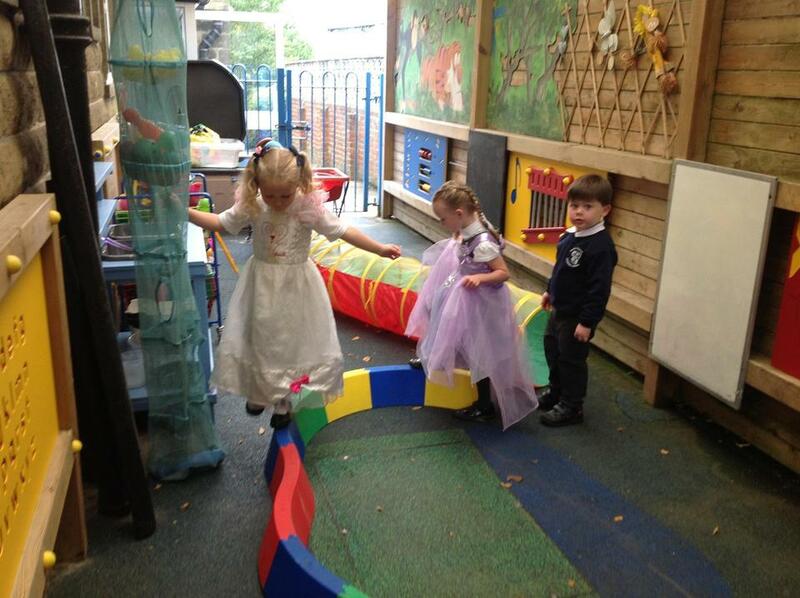 They even got to have a play on the big playground! 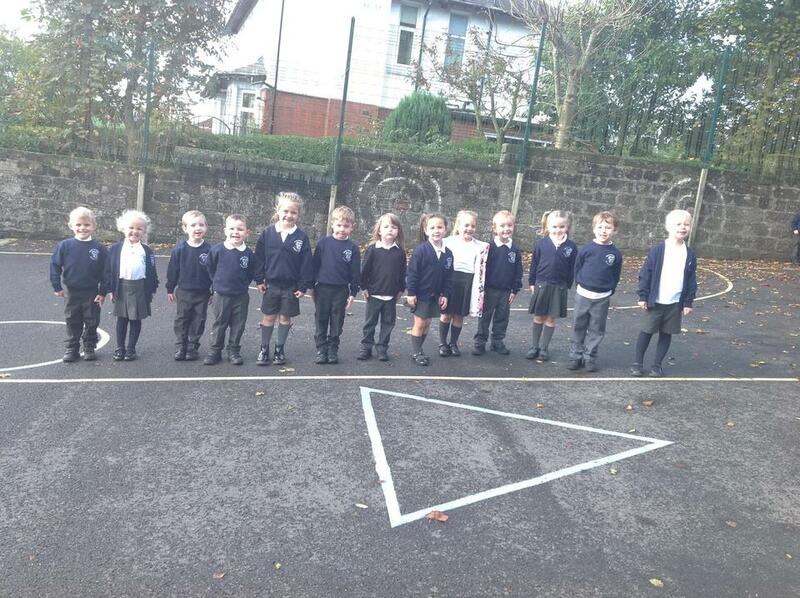 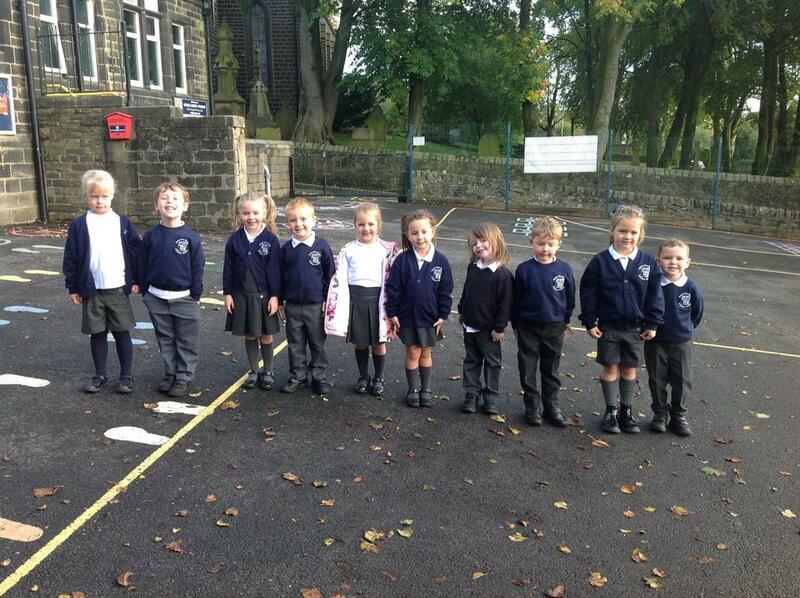 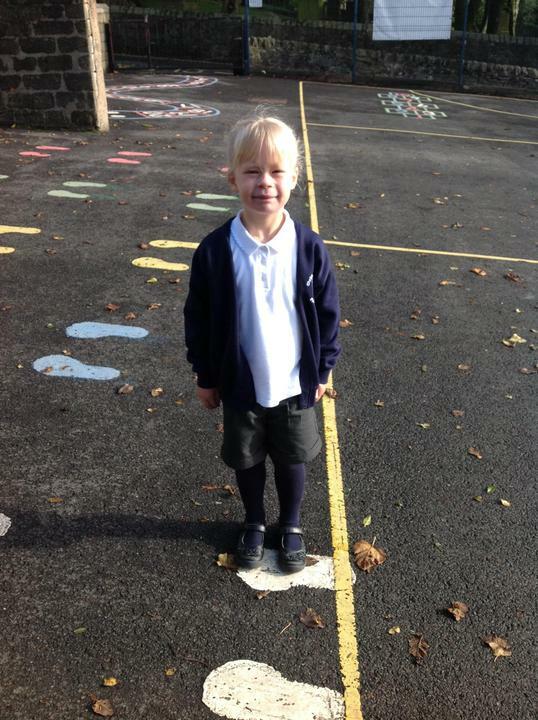 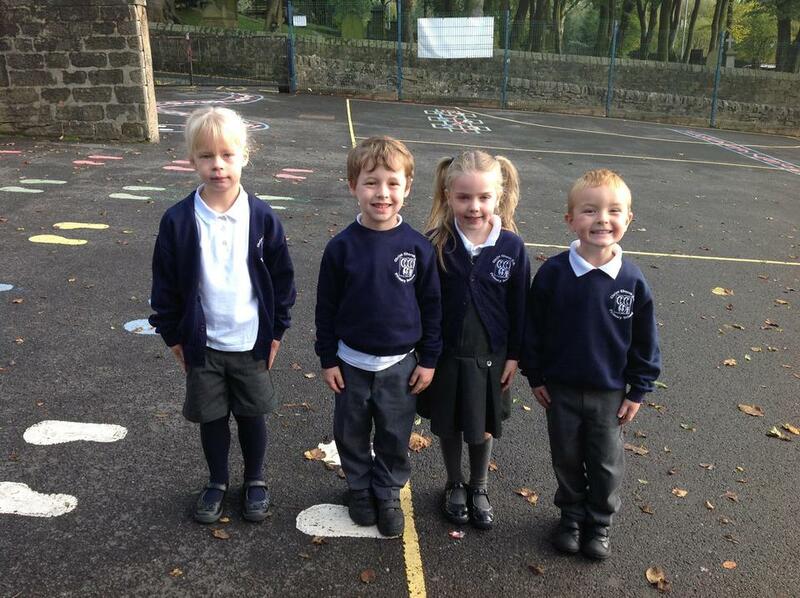 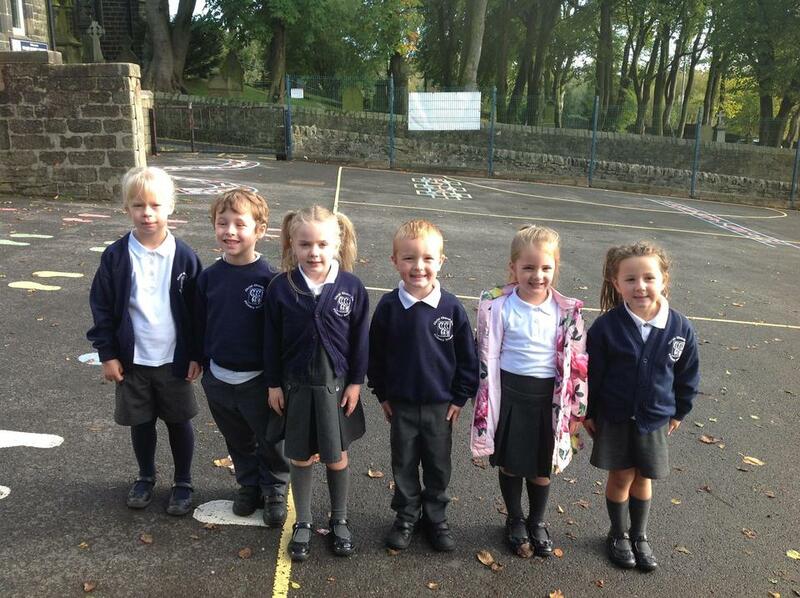 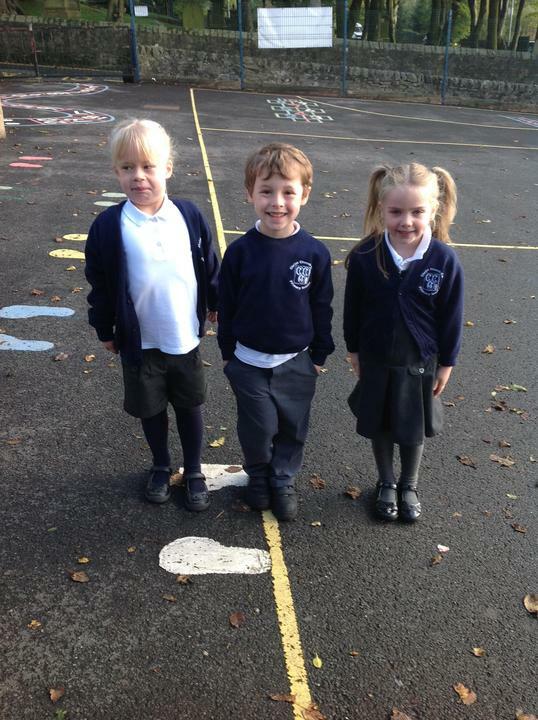 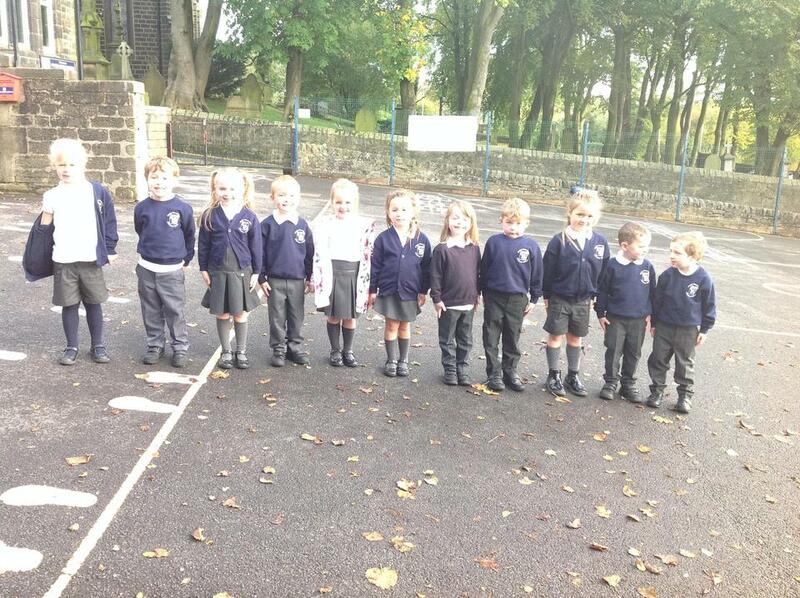 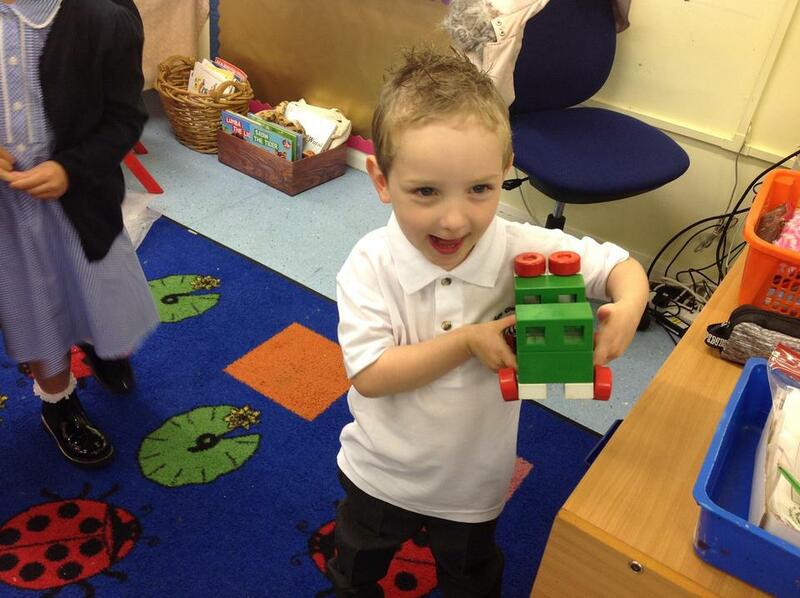 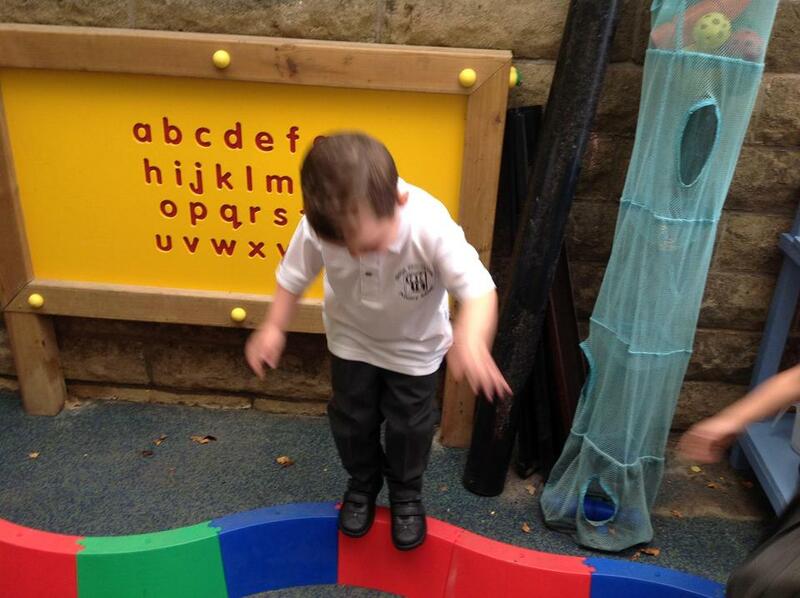 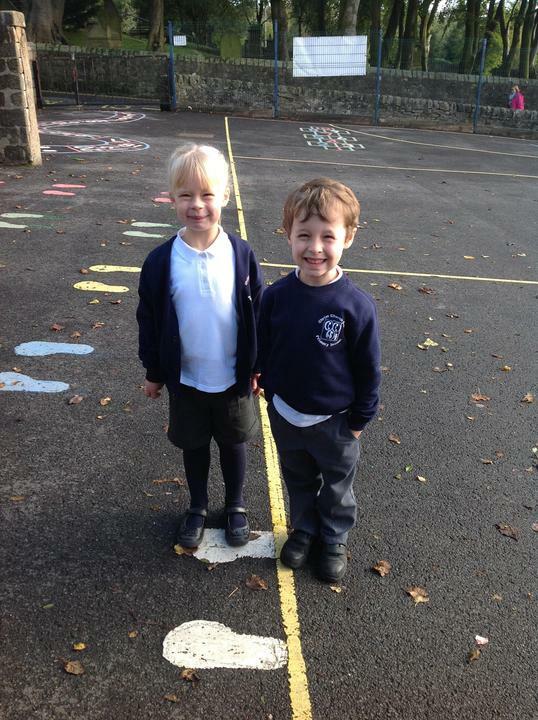 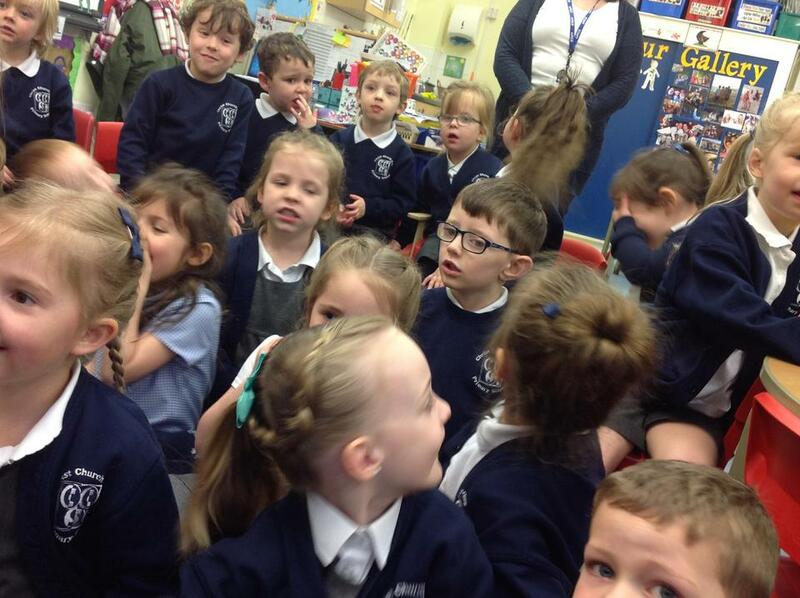 Here are some photographs from their first day at school. 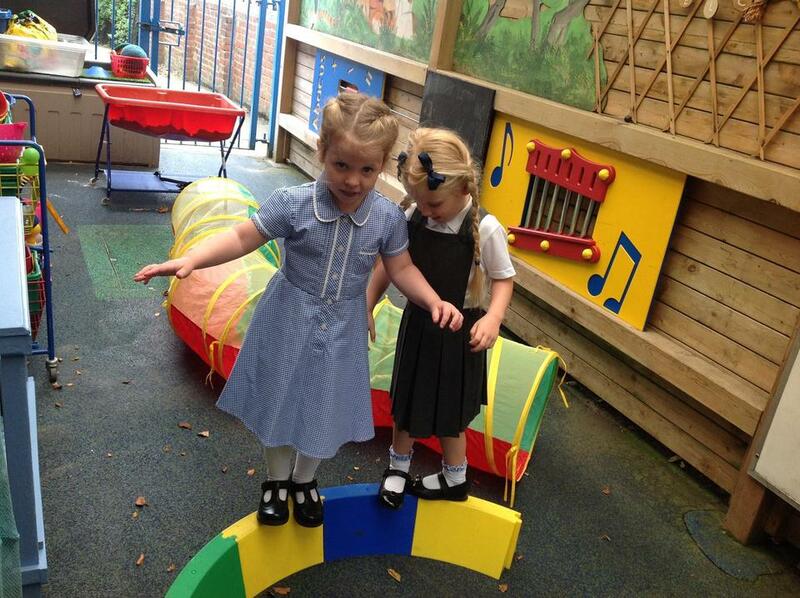 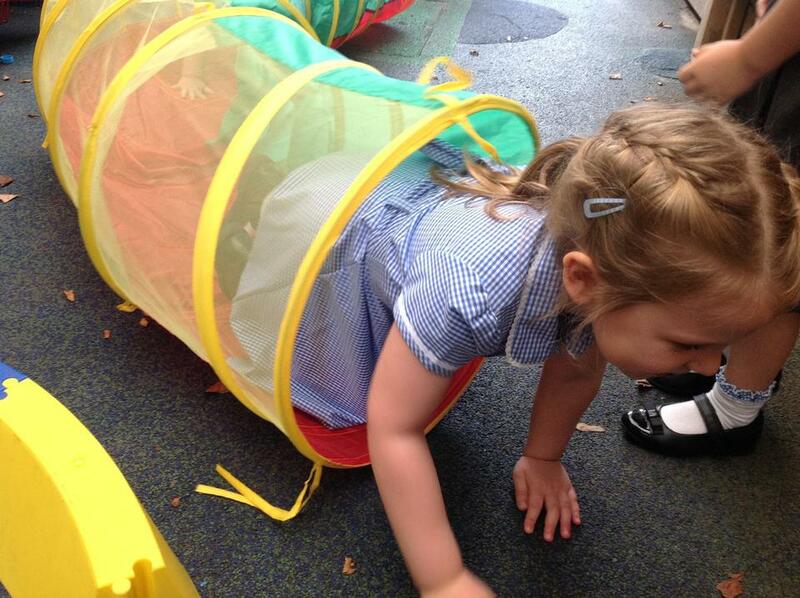 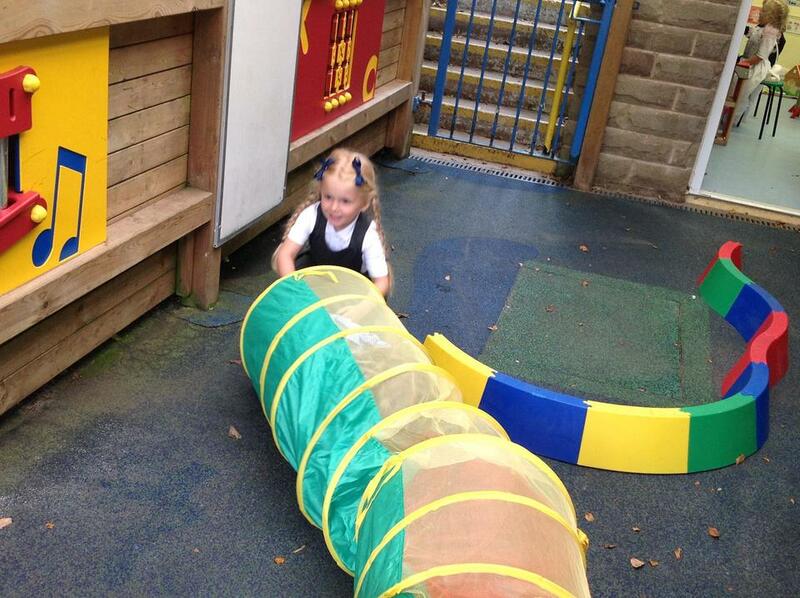 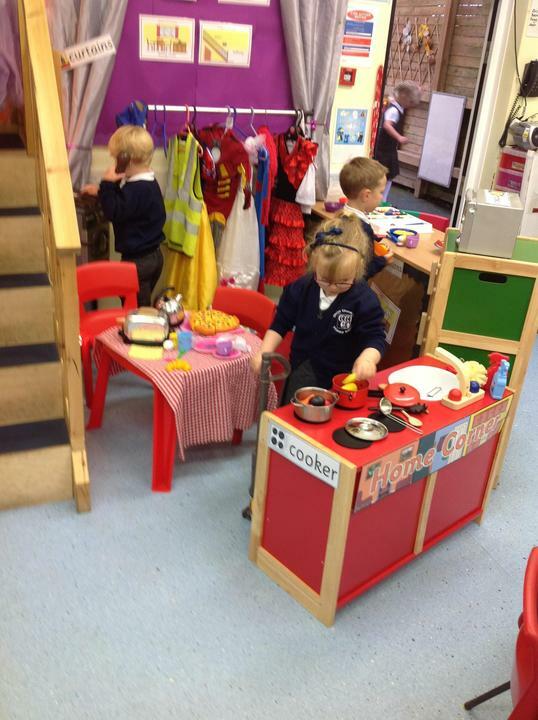 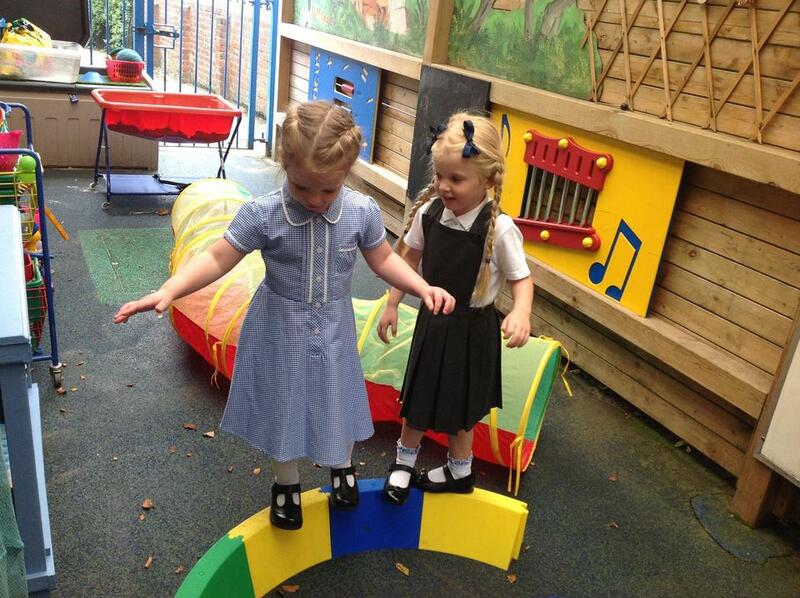 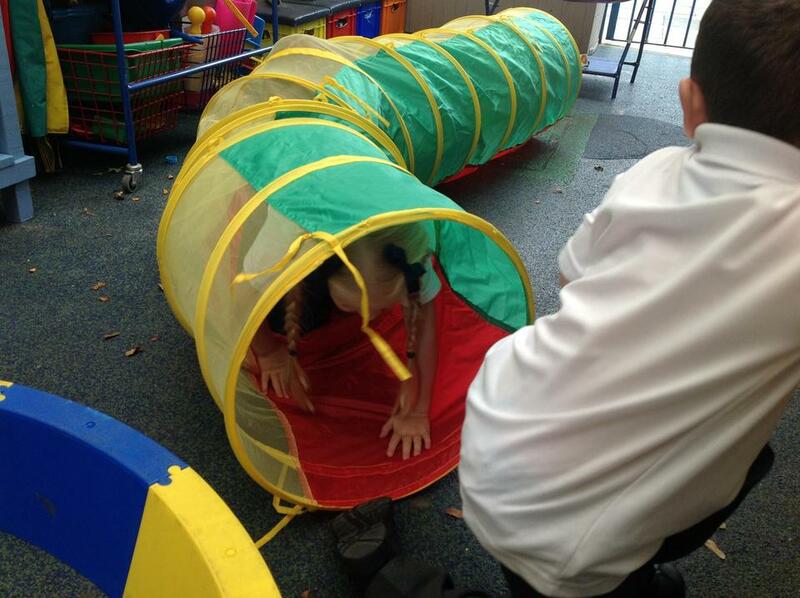 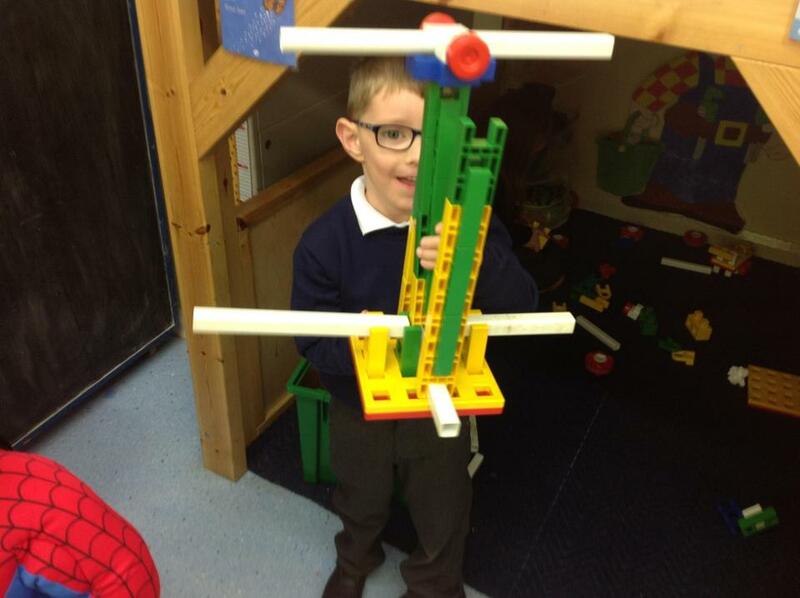 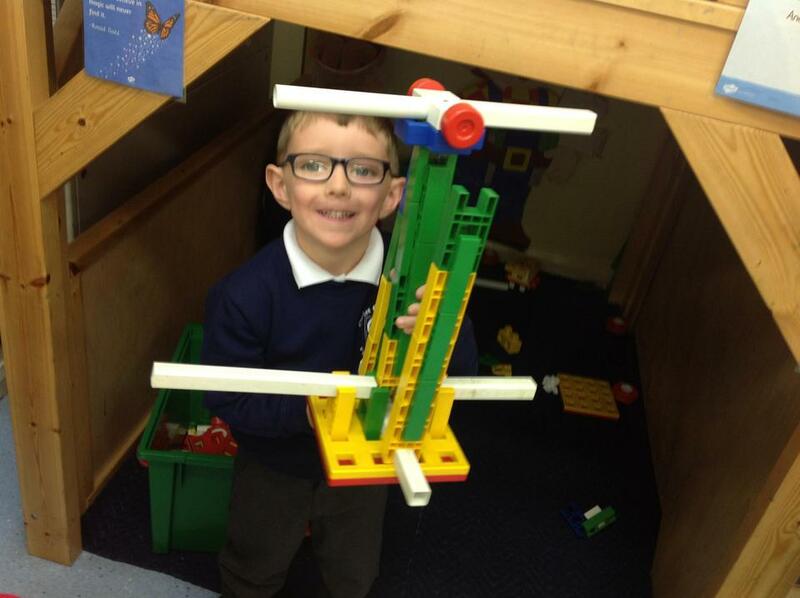 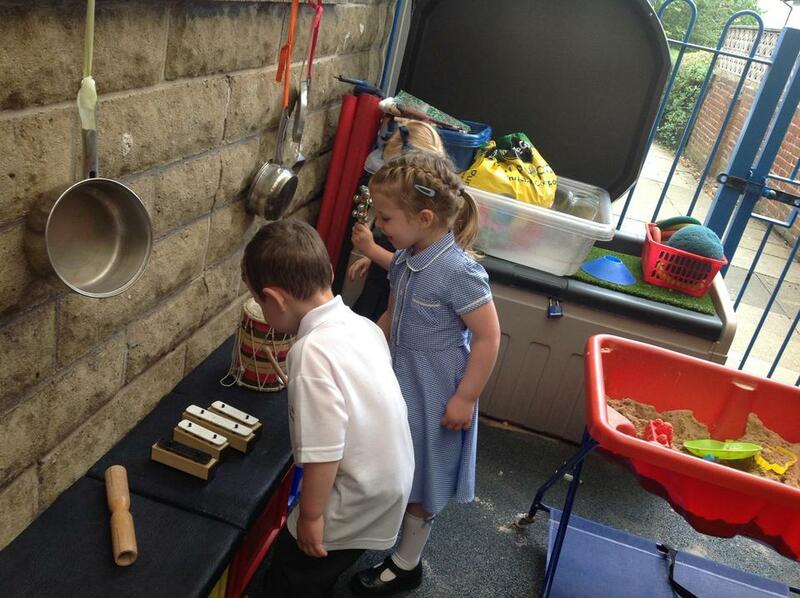 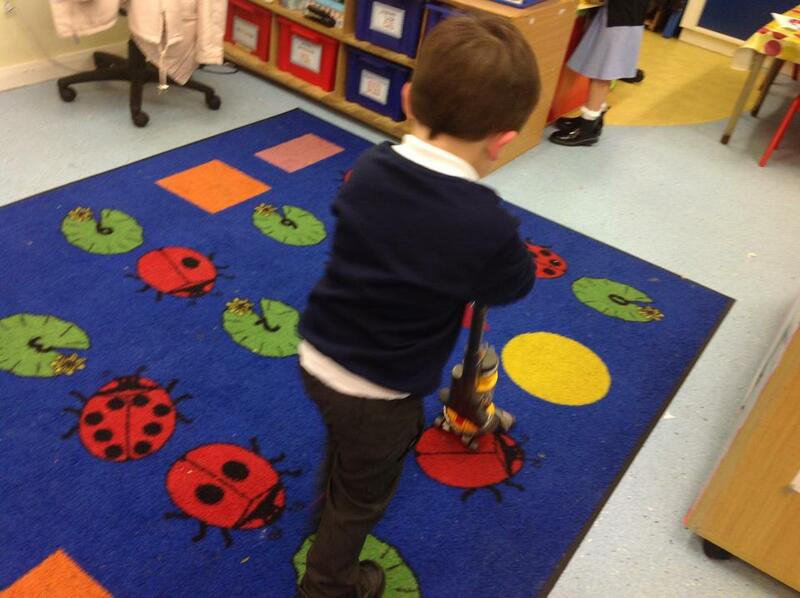 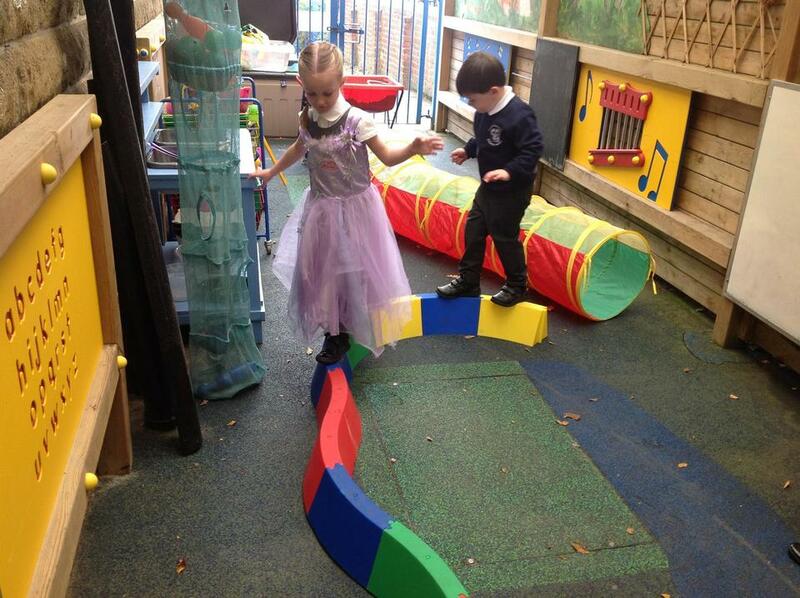 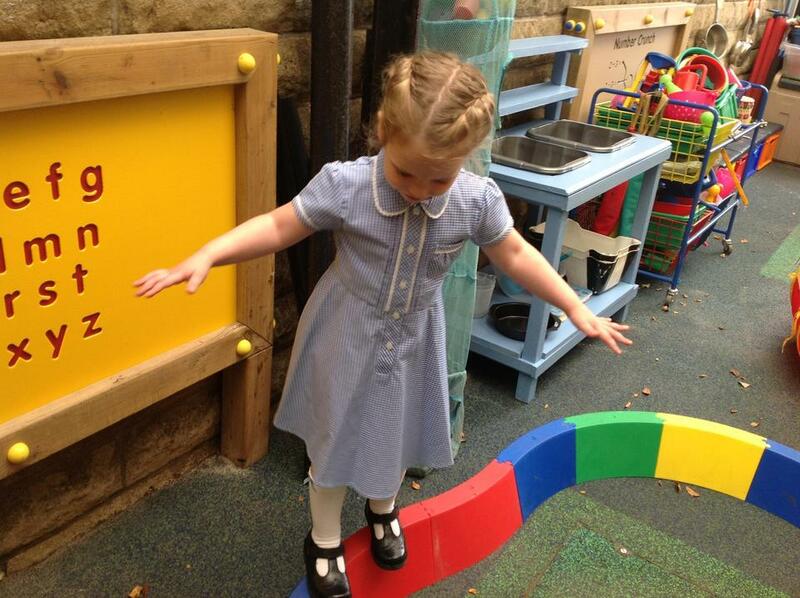 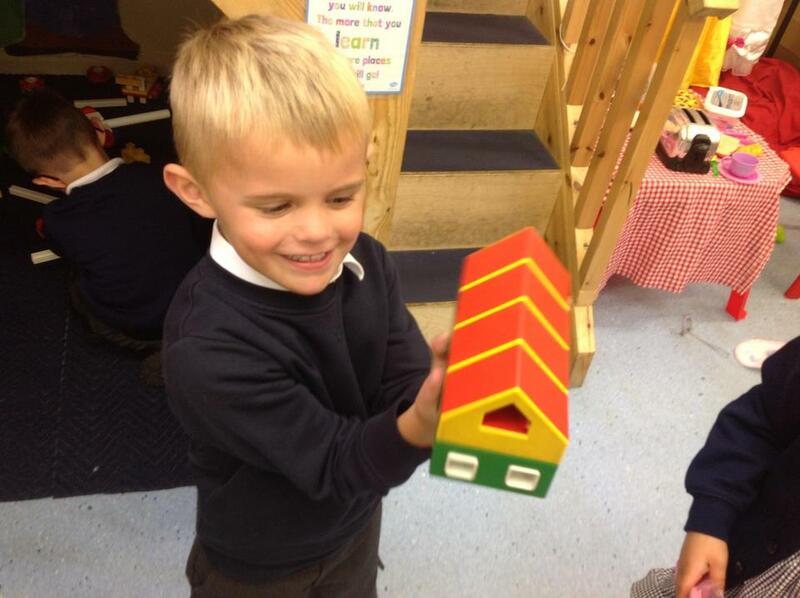 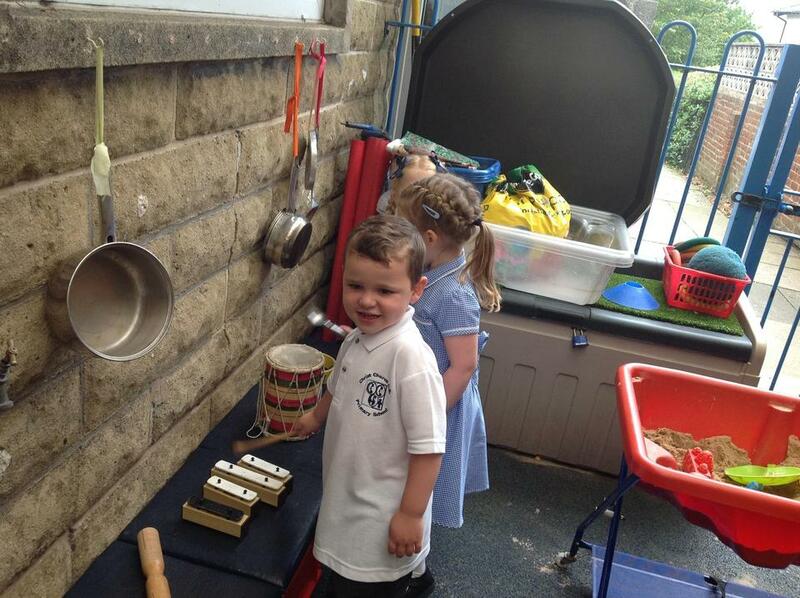 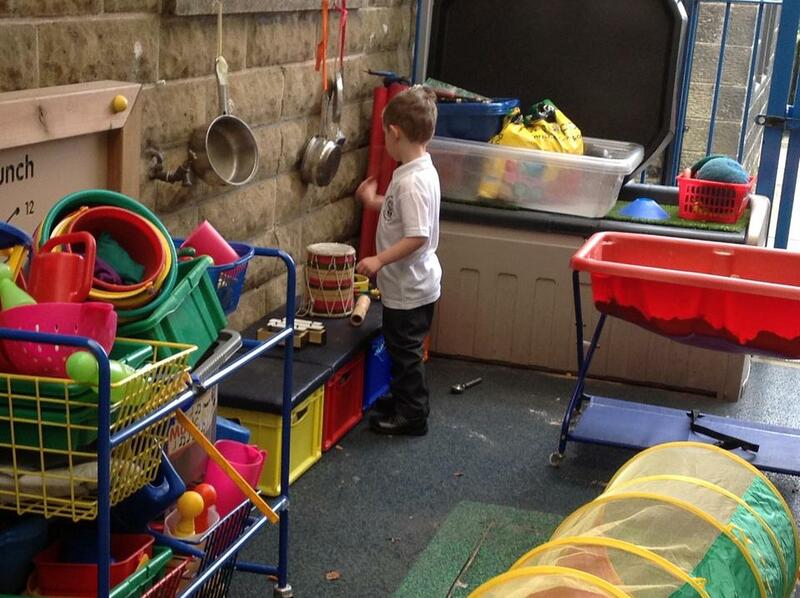 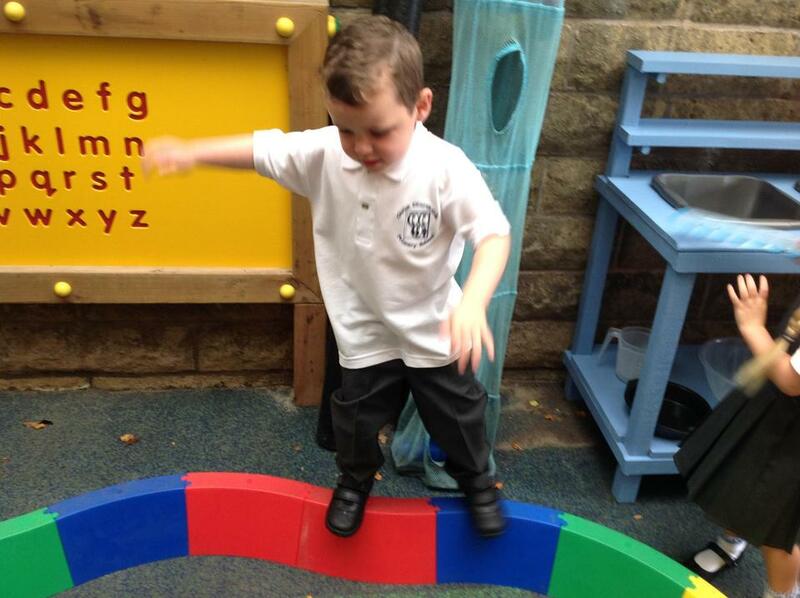 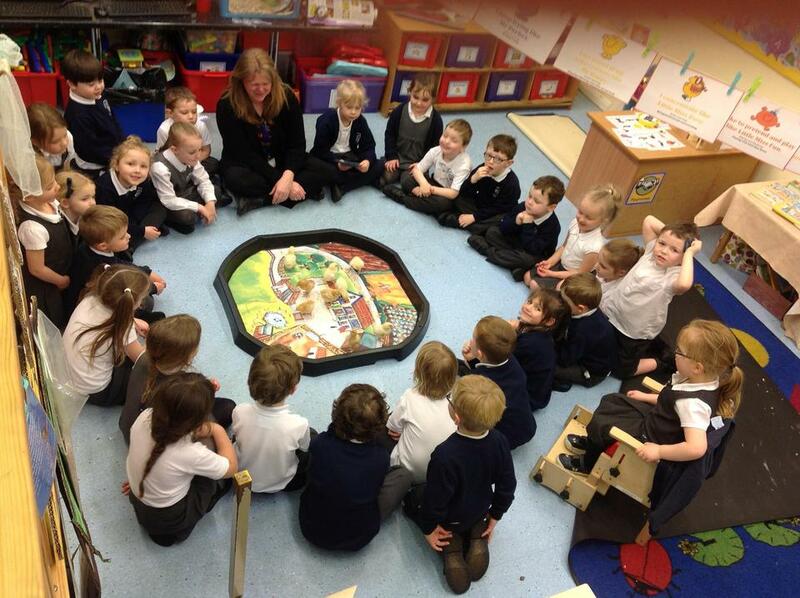 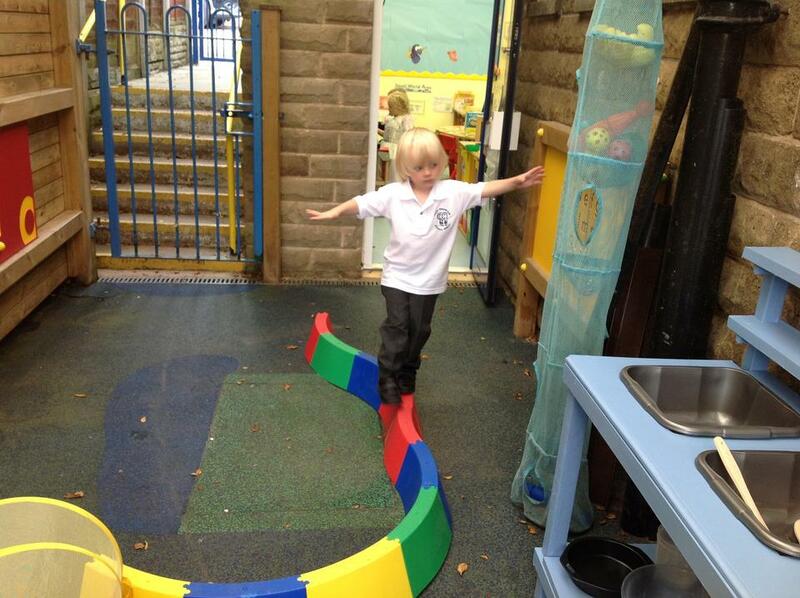 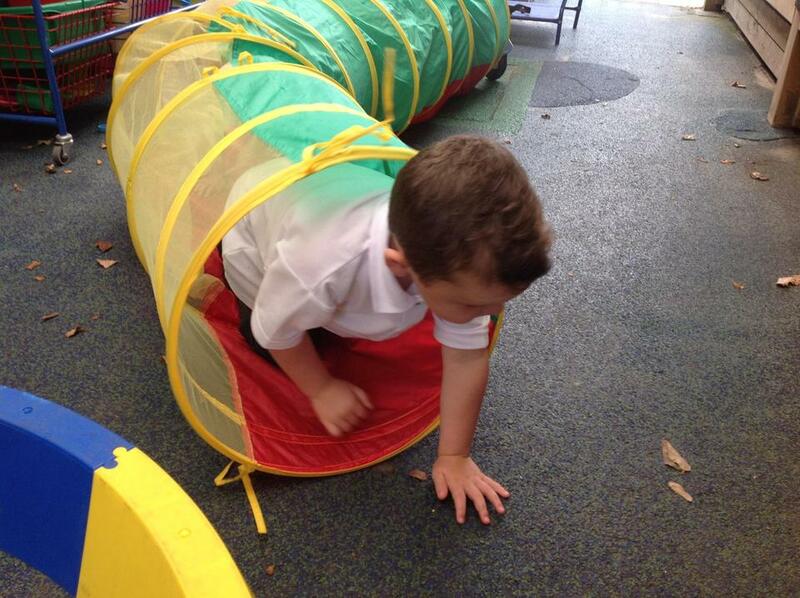 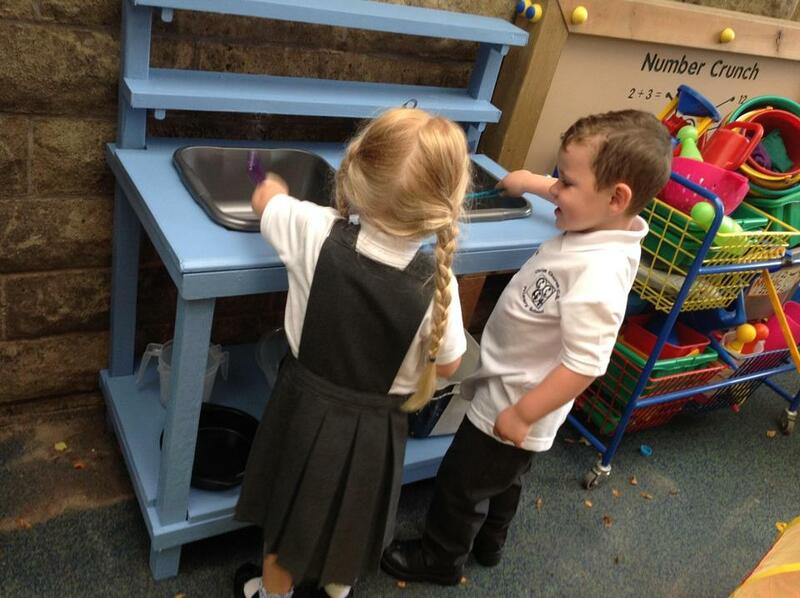 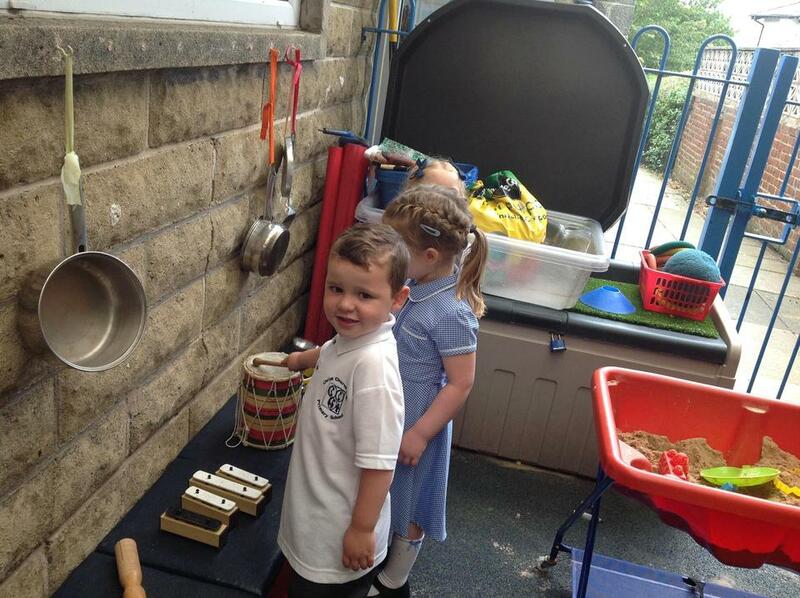 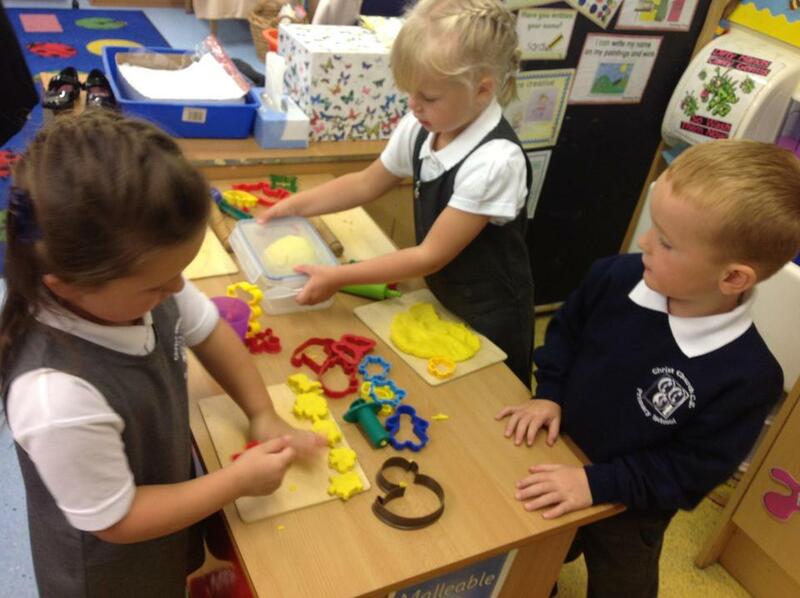 We are going to have a brilliant year together learning through play. 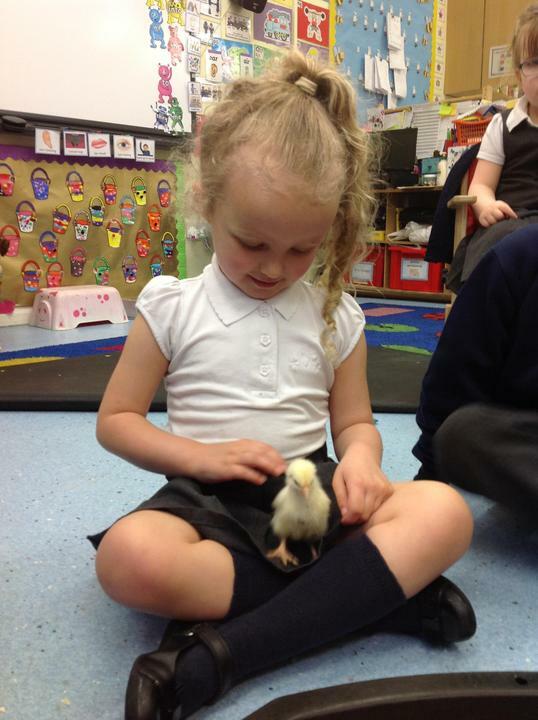 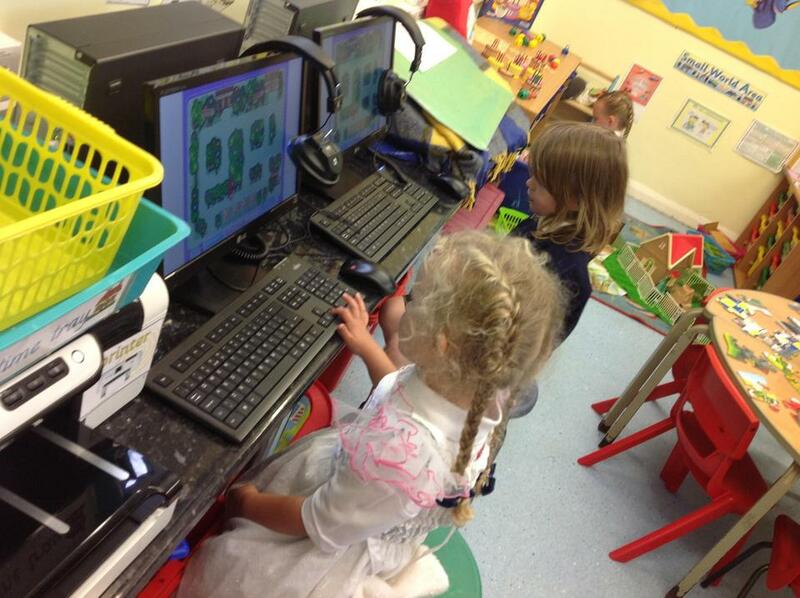 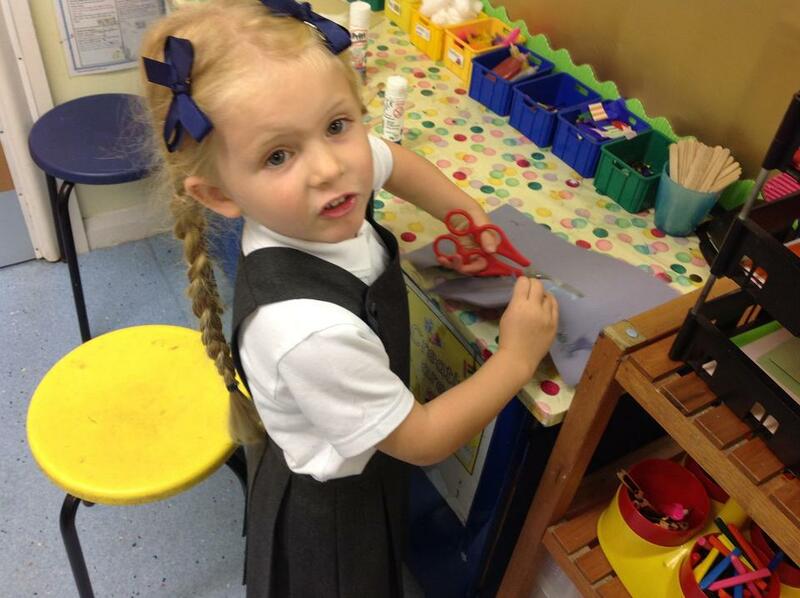 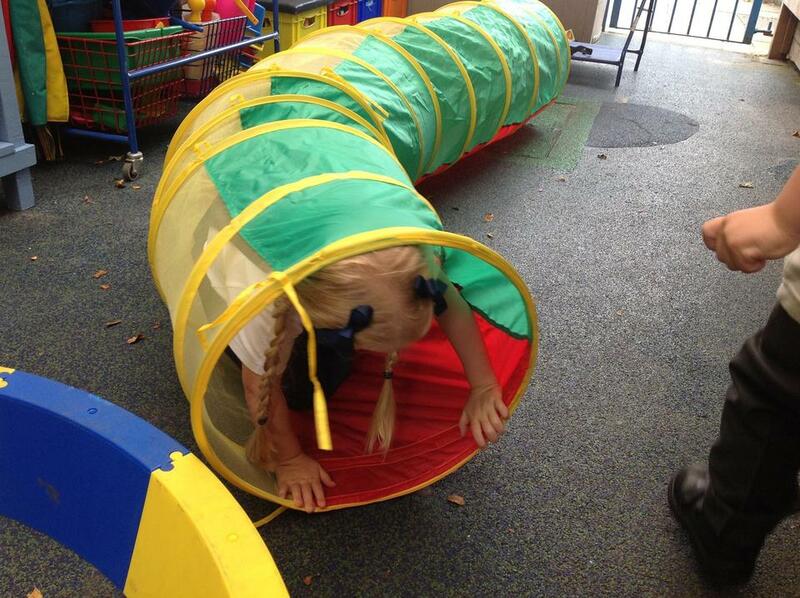 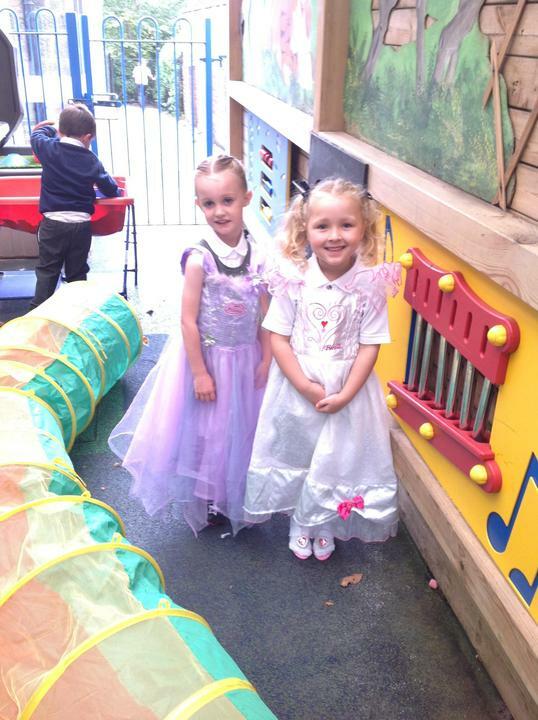 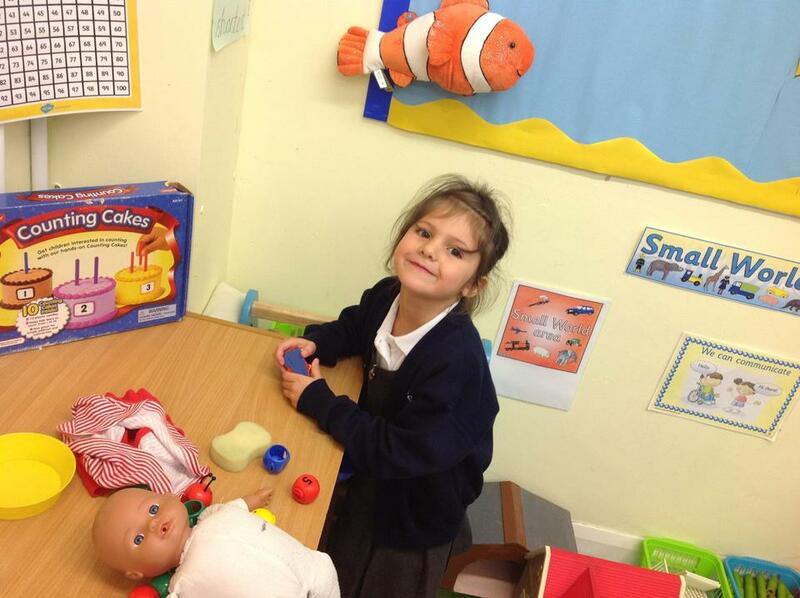 I know you are all going to enjoy your time in Reception Class.